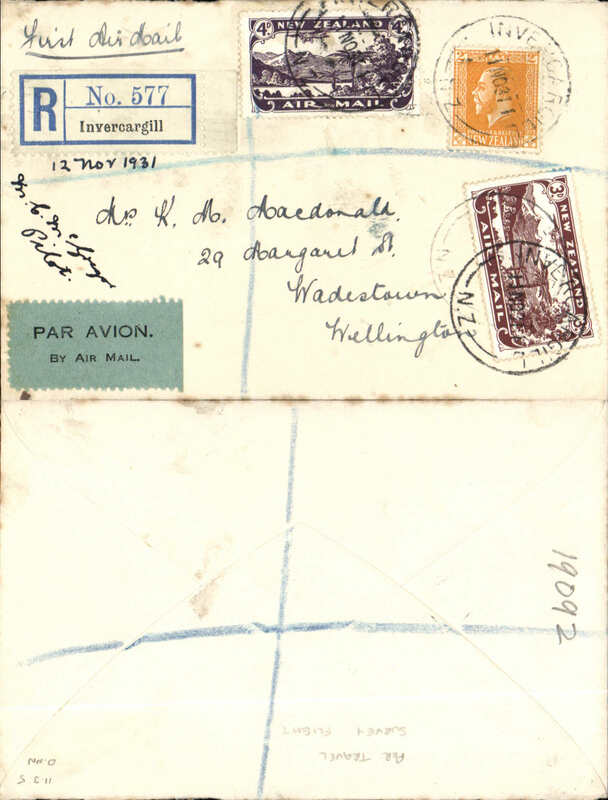 Dominion Airlines, F/F weekly service Hastings to Gisborne, no arrival ds, plain cover franked 1d, black/white "Hastings to Gisborne/Dominion Airlines" label with 'SIXPENCE' removed, large pale green framed flight cachet. Signed by the pilot George Bolt. Nice item. 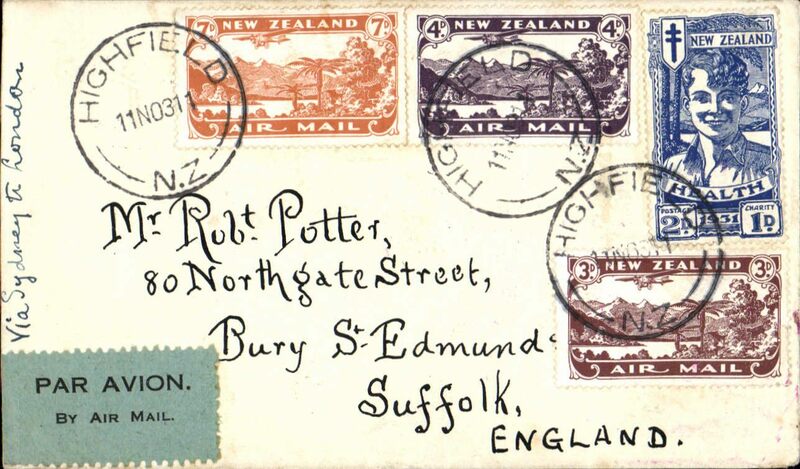 First New Zealand acceptance of mail for England via the Karachi-London service, Wellington to Sutton Coldfield, arrival ds 7/8 on front, airmail etiquette cover franked 1/-, ms endorsement "By Adelaide-Perth and/Karachi-London", plain cover, Francis Field authentication hs verso. Maximum of 10 covers flown. 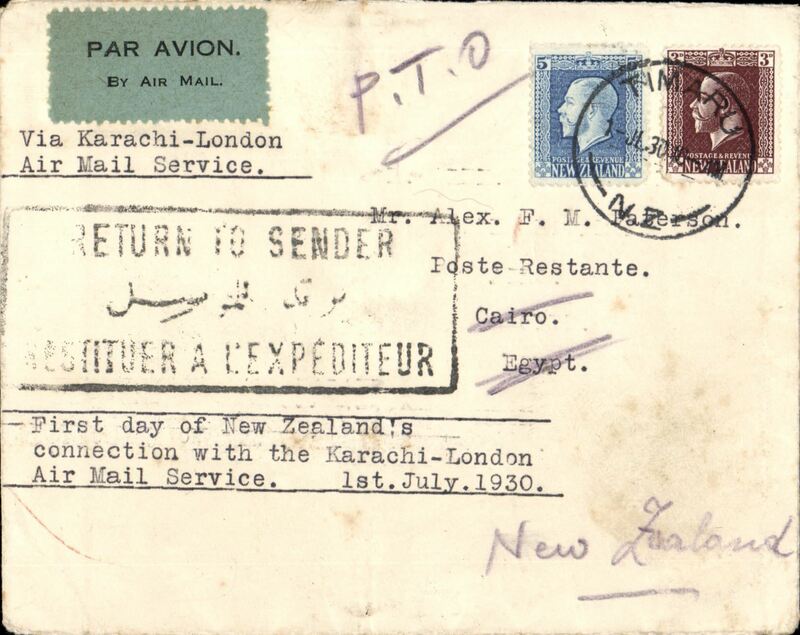 First New Zealand acceptance via Adelaide-Perth and Karachi-London services, Timaru to Cairo, bs 8/8, correctly rated 8d (see Walker p25), typed endorsement "Via By Karachi-London Air Mail Service"/"First Day of New Zealands/Connection with the Karachi-London/Air Mail Service/1st July, 1930", plain cover, special black/pale blue etiquette. 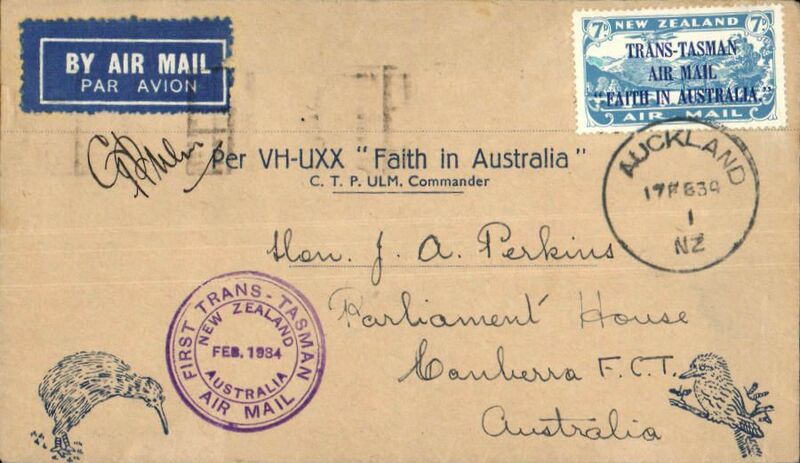 The July 1st date of postage suggests internal carriage by Adelaide-Perth service and is, thus, likely to be one of only 10 flown, see Walker p26. Superb item. 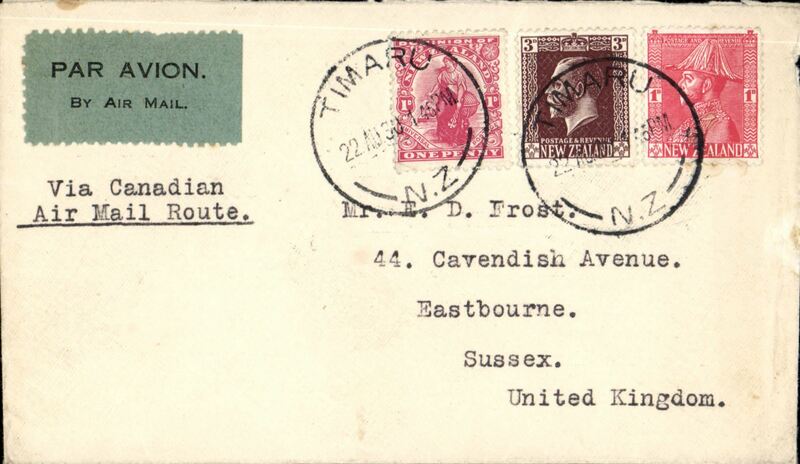 Scarce New Zealand to England commercial airmail carried by the Canadian airmail route, plain cover correctly franked 5d (4d air mail fee and 1d surface rate) canc Timaru cds, grey blue/black airmail etiquette, typed "Via Canadian/ Air Mail Route". Mail steamer to Vancouver, Canadian airmail service to Mntreal/Toronto, then surface to England. See Walker, pp 34-36. 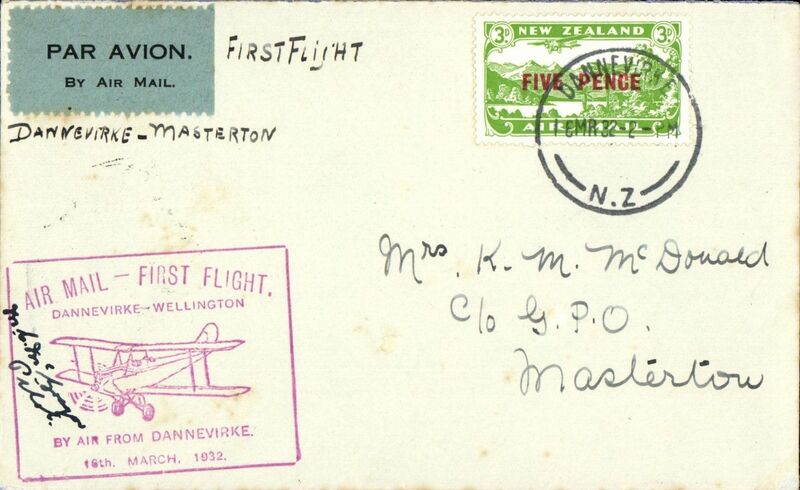 Experimental flight Dunedin to Christchurch, franked 4d, blue air mail label, special blue on white envelope, no b/s, Francis Field authentication and Air Mail Society of NZ Expert Committee Authentication hs's verso, Air Travel, signed by MC McGregor, pilot. Mail carried on one day only. NZAMS Expert Committee expertisation hs verso. 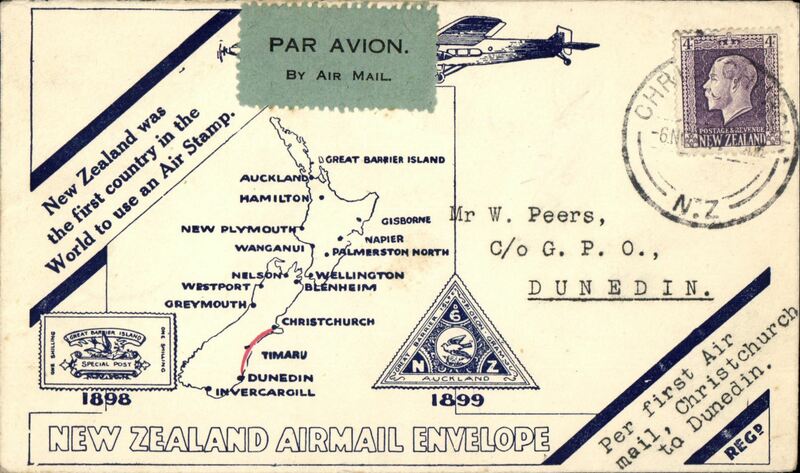 Air Travel, inauguration of Daily Service, Christchurch to Dunedin, bs 6/11, blue/white souvenir cover with map of route, NZAMS Expert Committee expertisation hs verso. Few faint tone spots verso, otherwise fine. 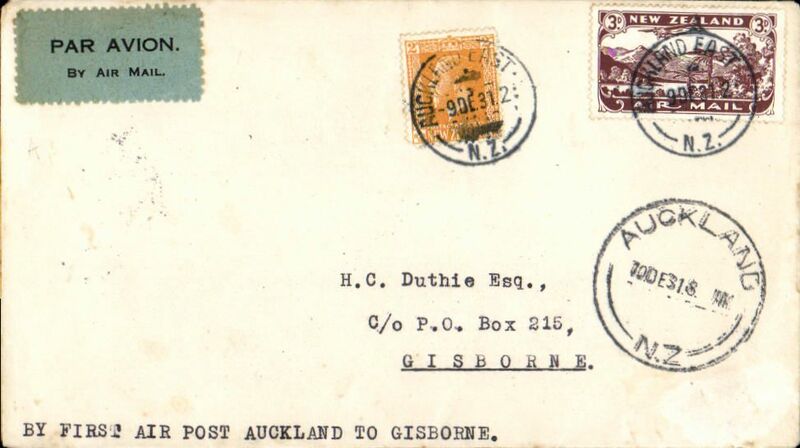 Dominion Airlines Ltd, F/F Hastings to Gisborne, plain cover franked 1d cancelled on arrival Gisborne 19 JA 31 cds, cut 'Hastings to Gisborne/Dominion Airlines Ltd' to remove word 'sixpence', green framed rubber stamp cachet, signed by the pilot G.B.Bolt. Francis Field authentication hs verso. 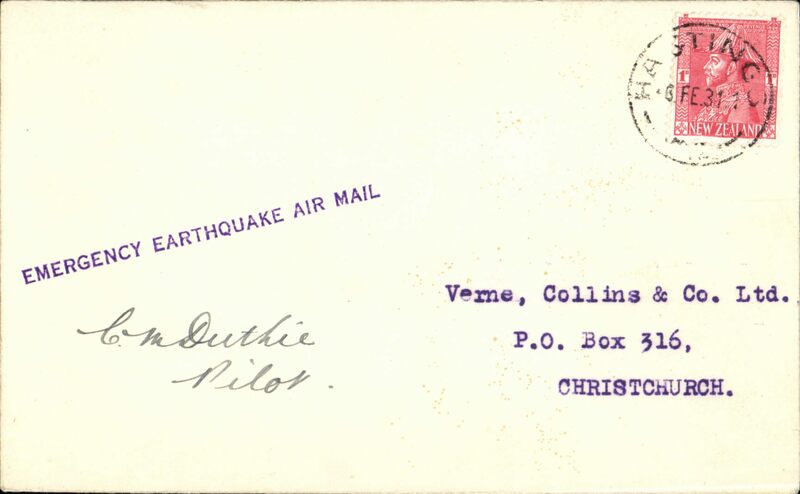 Tenth anniversary of the first Christchurch to Timaru flight, special cover flown over CChristchurch-Ashburton-Timaru, b/s 18/2, Qantas, signed by Euan Dickson who flew the inaugural flight..
Hawkes Bay Earthquake Emergency Flight from Hastings, plain cover franked 1d, canc 'Hastings/6 Feb 31', fine strike "Emergency Earthquake Air Mail" hs, signed by the pilot C.M.Duthie. 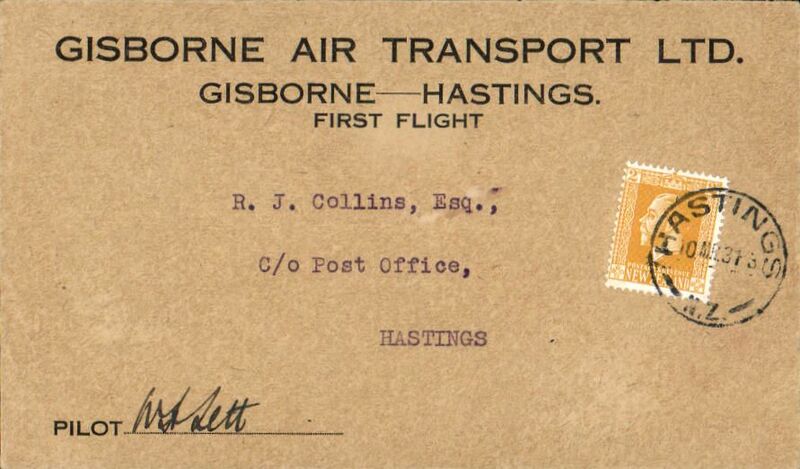 Gisborne Air Transport Ltd, F/F Hastings to Gisborne service, special printed envelope franked 2d, posted on arrival and cancelled Hastings 10 MR 31 cds. signed by the pilot W.H.Lett. Francis Field authetication hs and NZAMS Expertisation cachet verso. 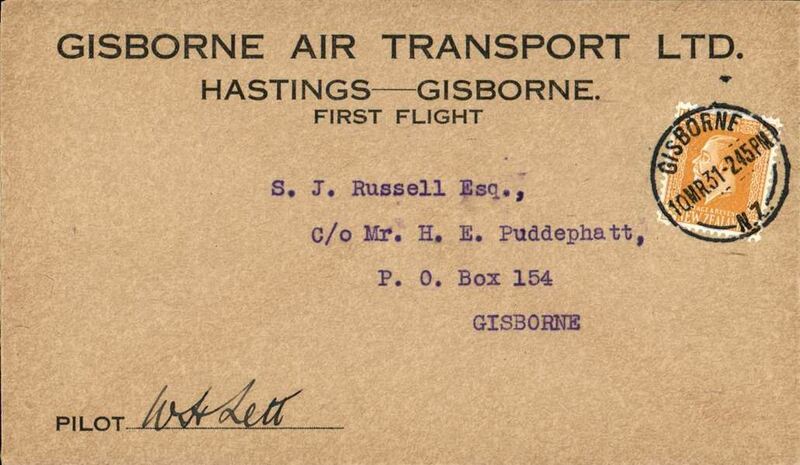 Gisborne Air Transport Ltd, F/F Hastings to Gisborne service, special printed envelope franked 2d, posted on arrival and cancelled Hastings 10 MR 31 cds. signed by the pilot W.H.Lett. NZAMS Expertisation cachet verso. 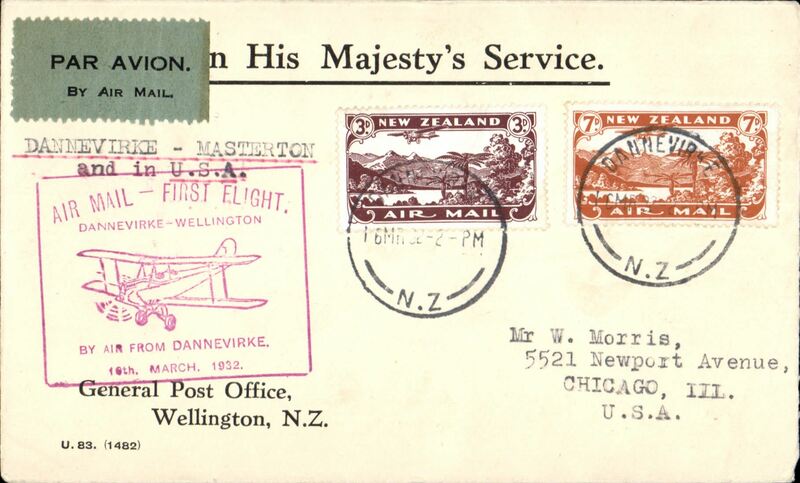 First New Zealand acceptance for Chicago, US, bs 14/12, for carriage on the F/F Danneverke to Masterton, bs16/3, airmail etiquette cover franked 10d, red boxed " F/F Danneverke-Wellington.........' flight cachet, air in NZ and USA. Image. 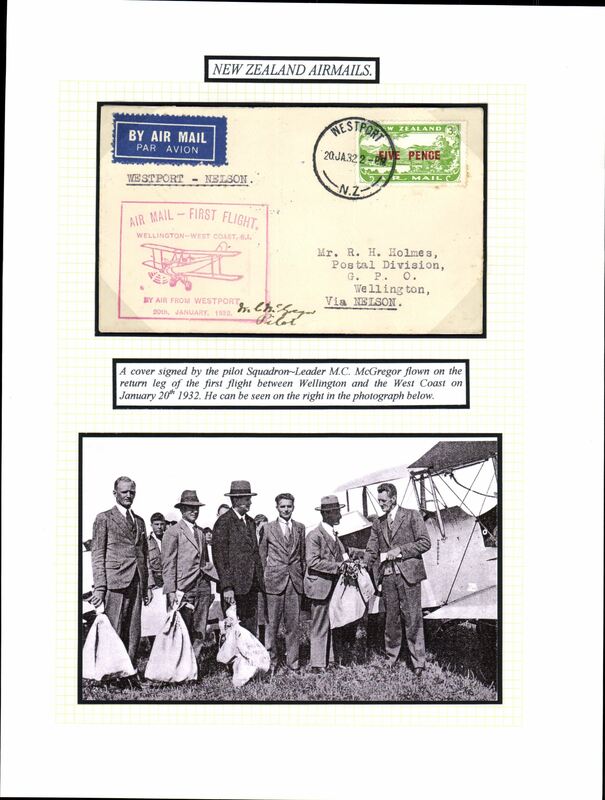 Kaitaia Aero Club and Air Survey Transport Co, Auckland to Kaitaia, special green/cream printed cover, posted on arrival, 'Kaitaia Aero Club' and 'Air Survey Transport Co' hs's on front, signed by the pilot, FD Mill, POA, NZAMS Expert Committee expertisation hs verso. 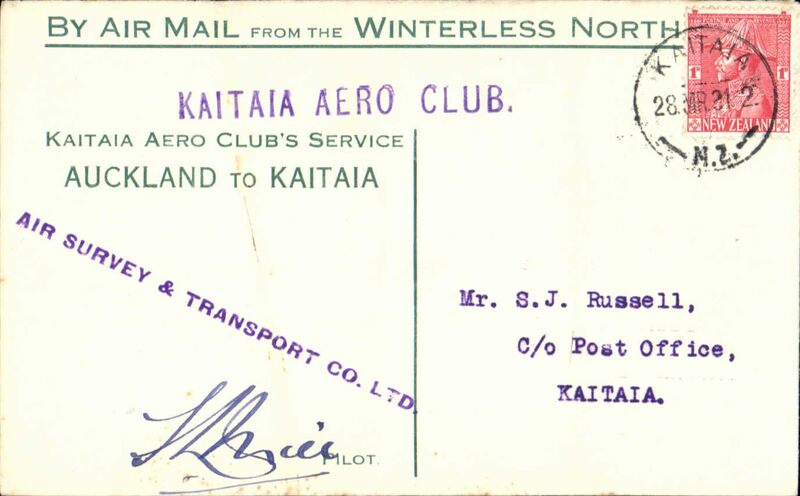 Air Survey and Transport Co Ltd, Kaitaia Aero Club F/F Auckland to Kaitaia, POA, Kaitaia 24/3 arrival ds on front, printed souvenir cover, signed by pilot FD Mill, Air Mail Society of NZ Expert Committee Authentication hs verso. 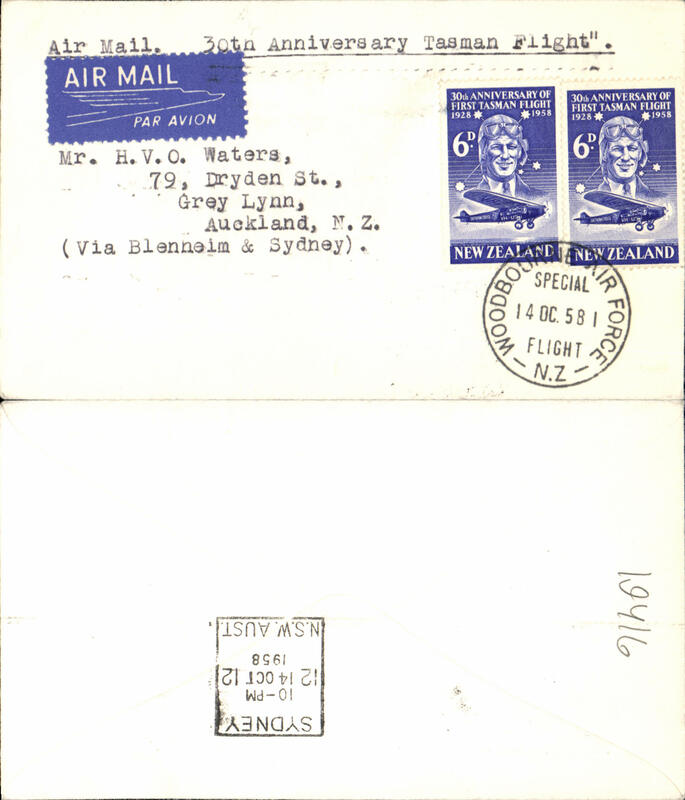 NA/Qantas/IAW, first acceptance of New Zealand mail for carriage to France on the inaugural experimental airmail Australia-England service, Remuera NZ to Grasse, Alpes Maritime, France, bs 16/5, via Paris Gard du Nord Avion 14/4 and Marseilles Gare (date illegible), plain cover with original contetnts franked 2/2 1/2d, good strike special purple cachet verso, black/grey-blue airmail etiquette cancelled by fine strike black cross Jusqu'a applied at Paris to indicate termination of carriage by the IAW service, then onward transmission to Marseilles and final destination. A scarce item with great routing. One for the exhibit. 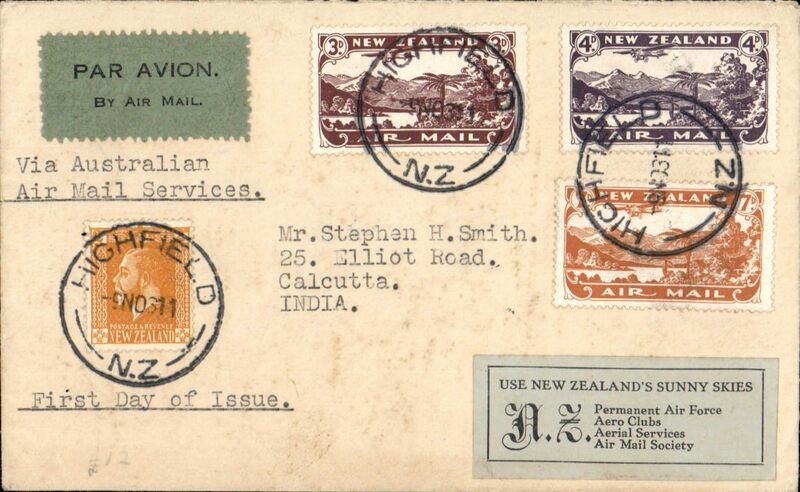 First New Zealand overseas mails using airmail stamps, New Zealand to India, Highfield to Calcutta 6/12, plain cover with black/ green blue etiquette franked 2d ordinary + unique first day usage 1931 set complete 3d, 4d, 7d, canc 'Highfield/9 Nov 33/NZ' cds, typed "Via Australian/ Air Mail/Services" and "First Day of Issue", black/grey-green 'Air Mail Society of New Zealand' label on front, and bearing signature of Stephen Smith verso. 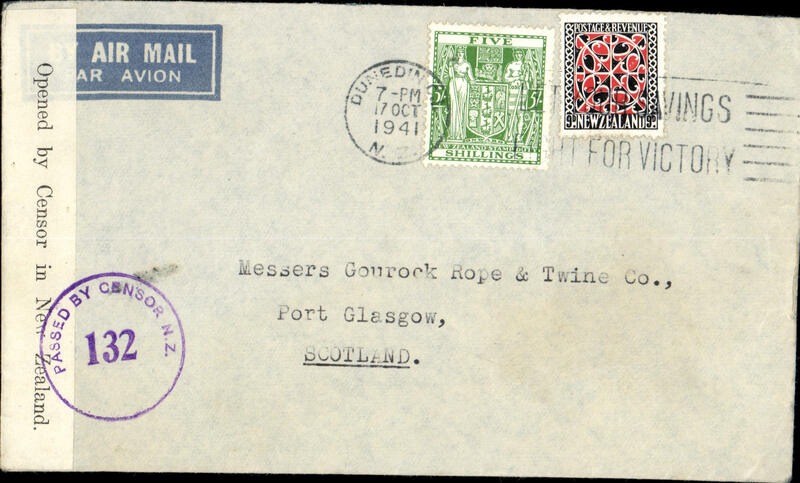 Nice clear Highfield postmarks. 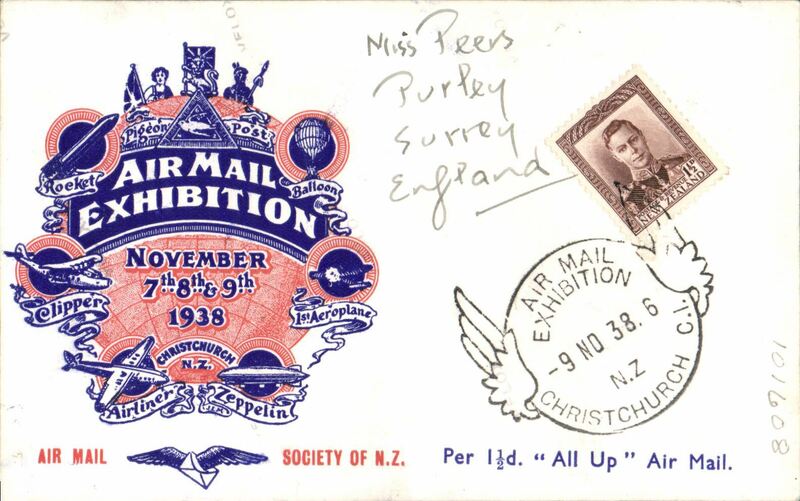 The official first day of issue was Nov 10th, but at Highfield, a suburb of Timaru, a small number of stamps were sold in error on Nov 9th. 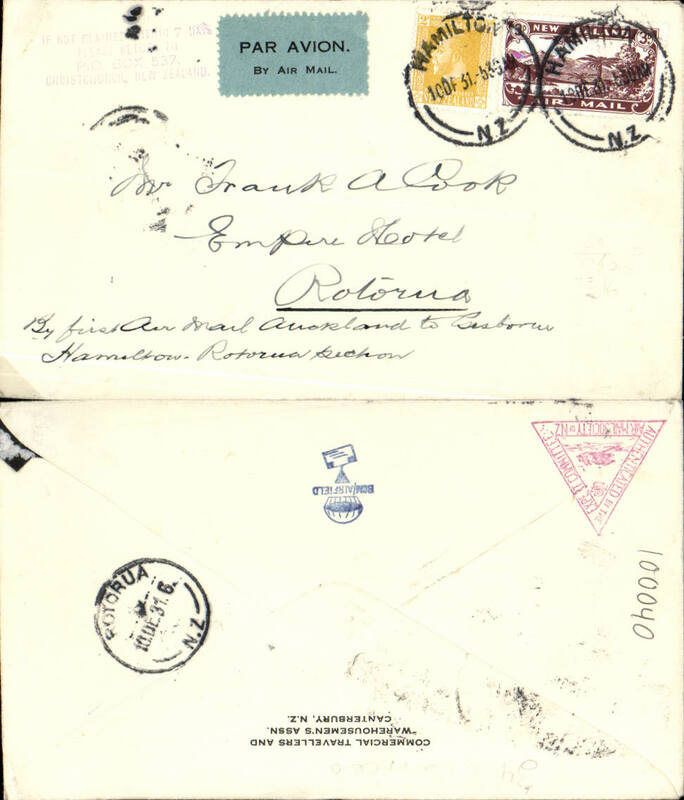 This cover is not only aerophilatelically scarce, but also a "unique 'Day of Issue' item" (see Walker DA, p95). Odd spots, see scan. 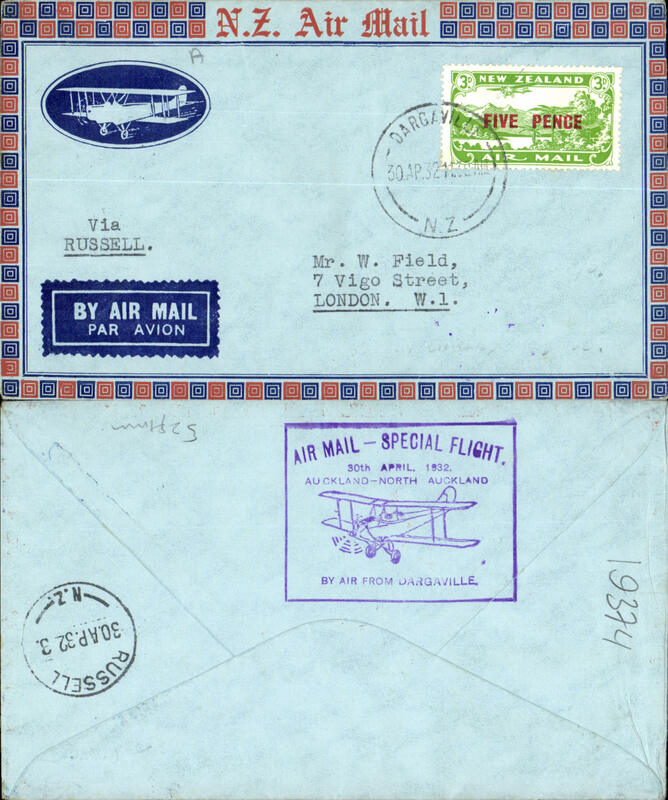 Christmas Airmail by ANA Sydney-London flight, Highfield to London, no arrival ds, franked 1931 Airs set and 2d Health, canc Highfield 11/11/1931 cds, large red boxed 'New Zealand-Australia-London' light cachet verso, ms 'Via Sydney to London', black/ green blue etiquette rated very scarce by Mair. Delayed by crash at Alor Star, arrived London 16/12. 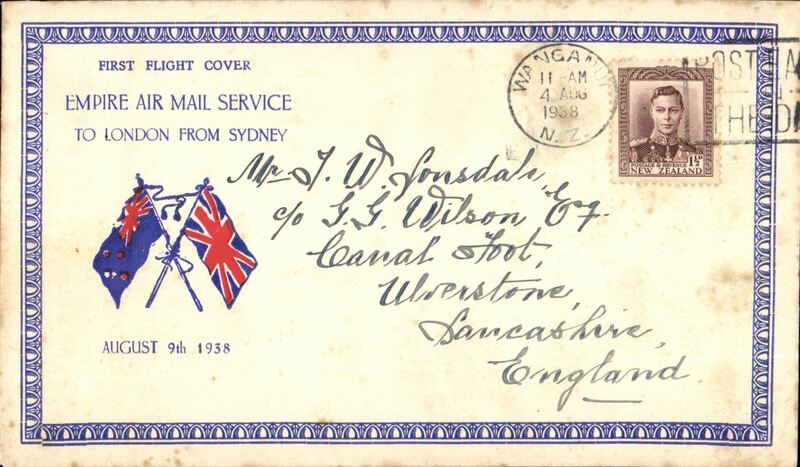 Christmas Airmail by ANA Sydney-London flight, Invercargill to London, no arrival ds, blue/cream printed souvenir cover franked 1/8d, canc Invercargill 11/11/1931 cds, large red boxed 'New Zealand-Australia-London' light cachet, typed "Via Invercargill-Auckland & Sydney-London/Special Christmas Air Mail "Special Air Mail/Australia-England/Also New Zealand Air Mail", black/ green blue etiquette rated scarce by Mair, violet 'Air Mail Society of New Zealand' hs verso. Delayed by crash at Alor Star, arrived London 16/12. Superb cover, see scan. 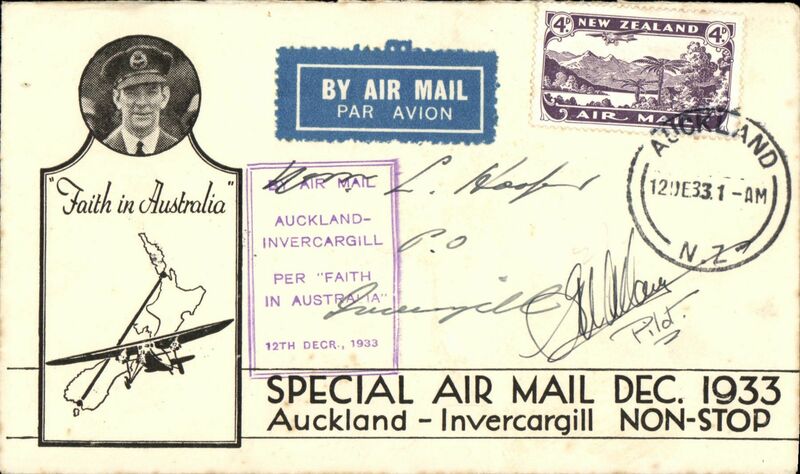 Special survey flight Invercargill to Auckland, Wellington to Auckland leg, bs 12/11, franked 5d inc 4d air stamp, no b/s, Air Travel Ltd, signed by MC McGregor, pilot. 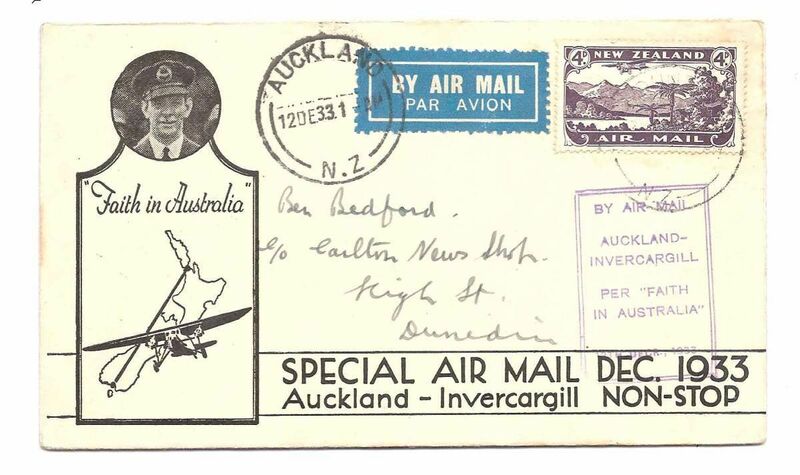 Special survey flight Invercargill to Auckland, Wellington to New Plymouth leg, bs 12/11, franked 5d inc 4d air stamp, no b/s, Air Travel Ltd, signed by MC Mcgregor, pilot. 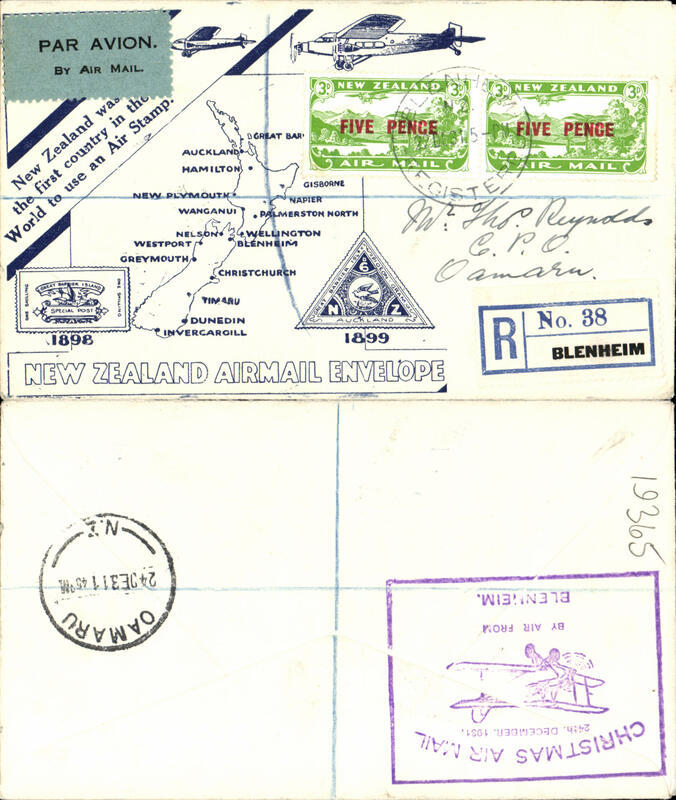 Air Travel Ltd, special survey flight, Invercargill to Blenheim, 12/11 arrival ds on front, plain cover franked 2d ordinary and 1931 3d airmail stamp, canc 12 Nov, black/grey-green airmail etiquette, 52 flown. 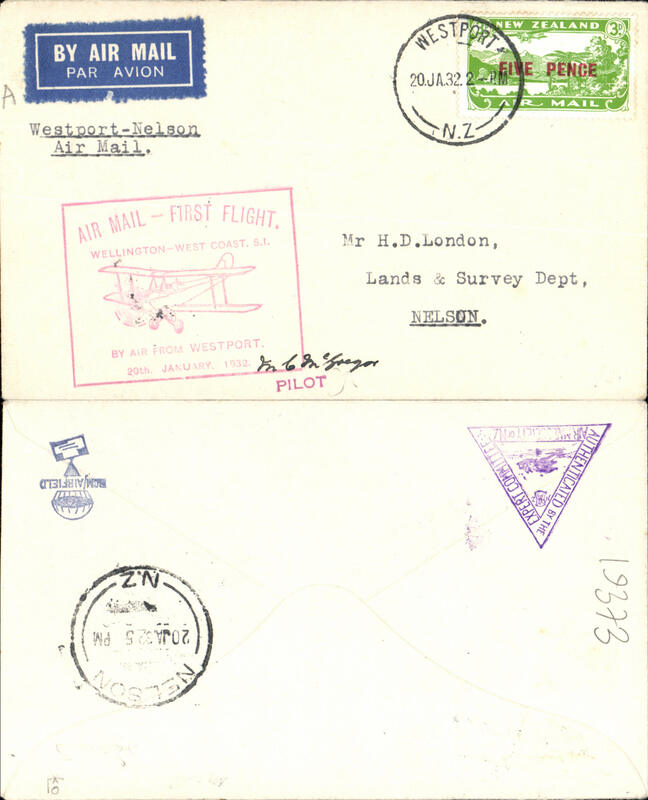 Air Travel Ltd, special survey flight, Invercargill to Wellington, no arrival ds, registered (label) cover franked 2d ordinary and 1931 3d and 7d airmail stamps, canc 11 Nov, black/grey-green airmail etiquette, signed by the pilot C.M. MC McGregor. 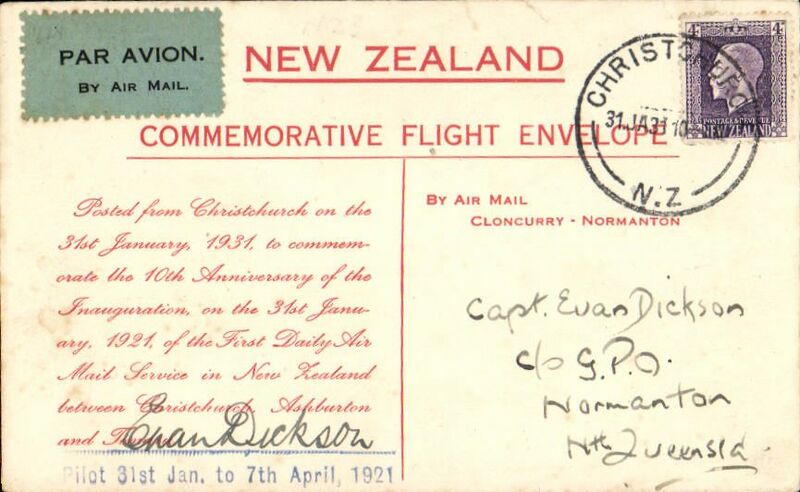 Air Travel F/F Auckland to New Plymouth, bs 13/11, signed by pilot signed by the pilot C.M. McGregor. 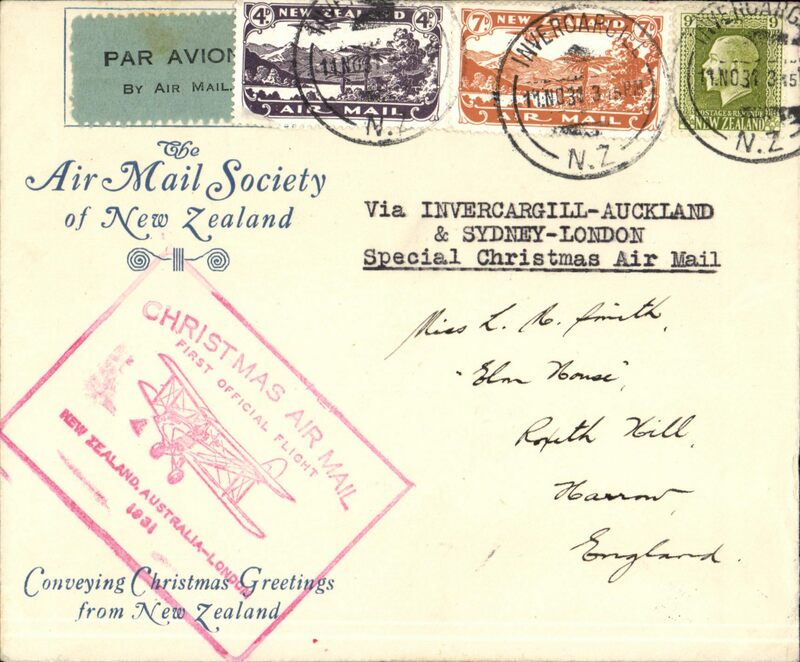 ANA special flight Auckland to England Christmas airmail, correctly rated 1/- air and 2d postage, 1st flight cachet verso.Non invasive closed flap tear verso, see image. Also of press cutting showing KIngsford Smith helping to unload the mail on arrival at Croydon. 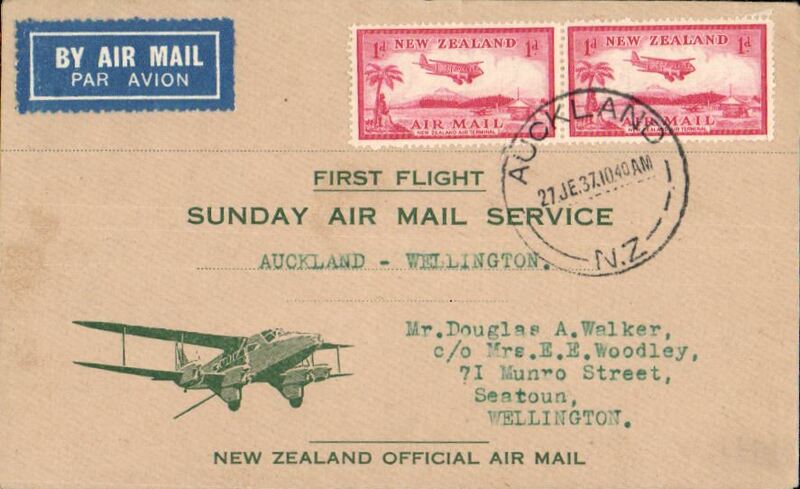 Air Travel Survey Flight, Auckland-Rotura, bs 10/12, franked 4d air + 1d, typed 'First Flight/Auckland-Rotura'. 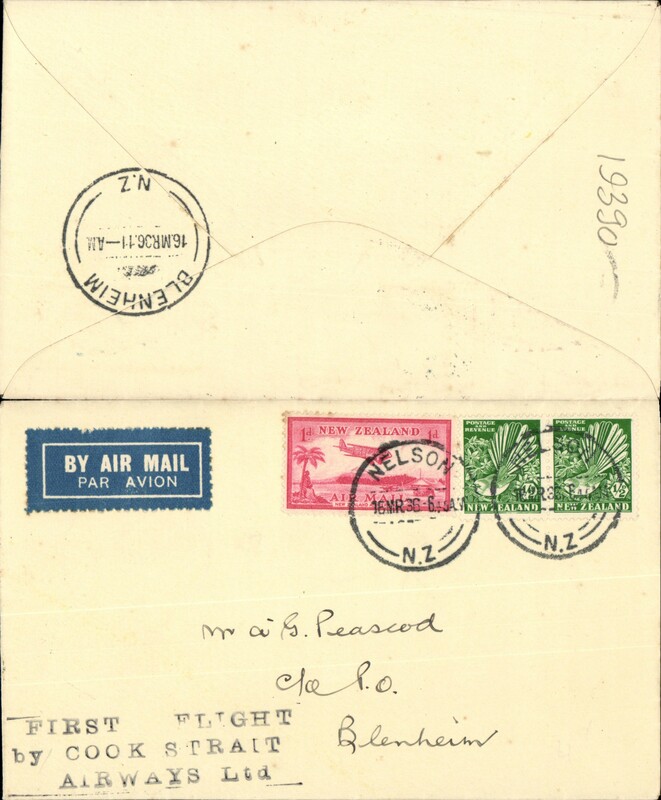 Air Travel Survey Flight, Hamilton-Rotura, bs 10/12, franked 3d air + 2d, Francis Field authentication and NZAMC Expertisation hs's verso..
Air Travel Survey Flight, Rotorua-Auckland, bs 10/12, plain cover franked 3d air + 2d, typed 'First Flight Rotorua-Auckland'. 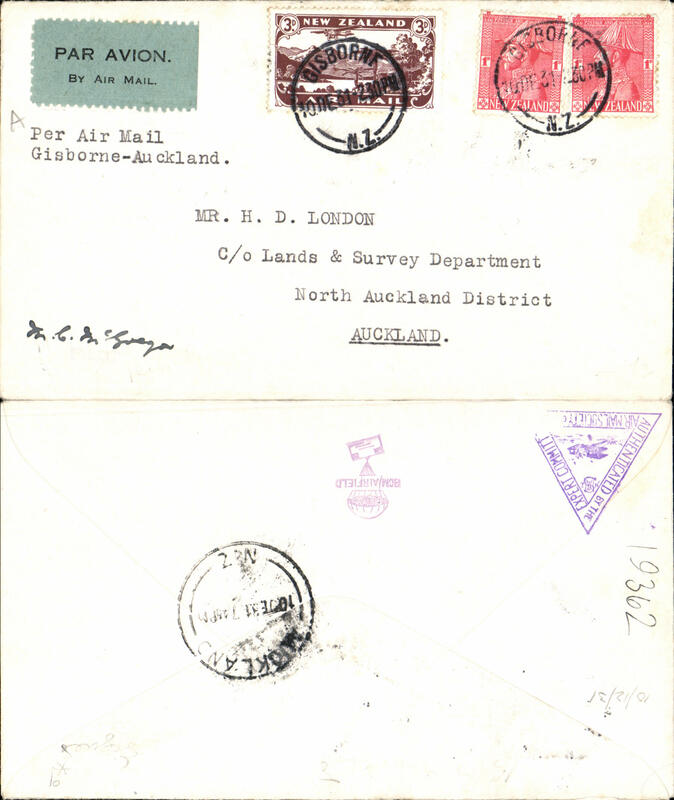 Air Travel survey flight, Rotorua to Hamilton, bs 10/12, franked 3d air + 1d, Air Mail Society of NZ Expert Committee Authentication hs verso. 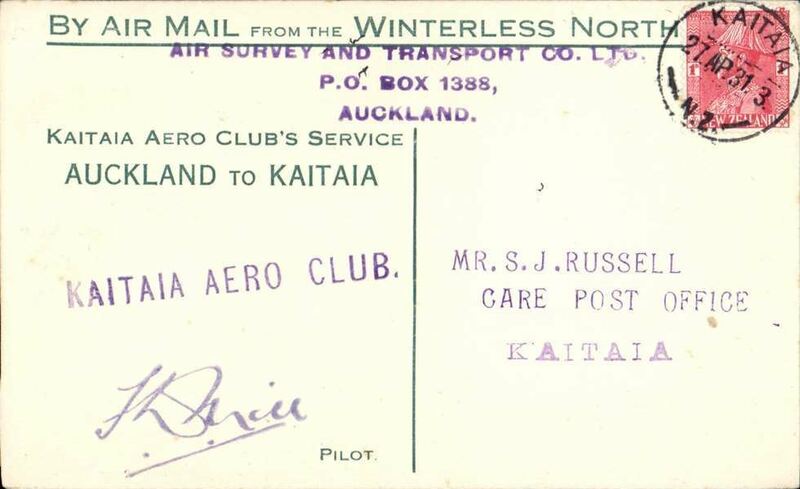 Air Travel Survey Flight, Auckland-Gisborne, bs Rotura 10/12, Whakatane 11/12, franked 3d air + 2d, 'First Air Mail/Auckland-Gisborne' cachet. 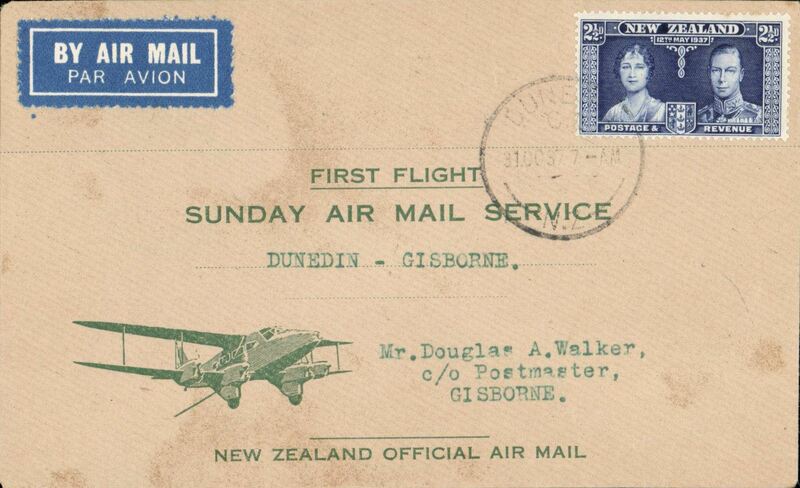 Air Travel Survey Flight, Gisborne-Auckland, bs 10/12, franked 3d air + 2d, typed 'Per Air Mail/Gisborne-Auckland'. Signed by pilot Squadron Leader M.C.McGregor. 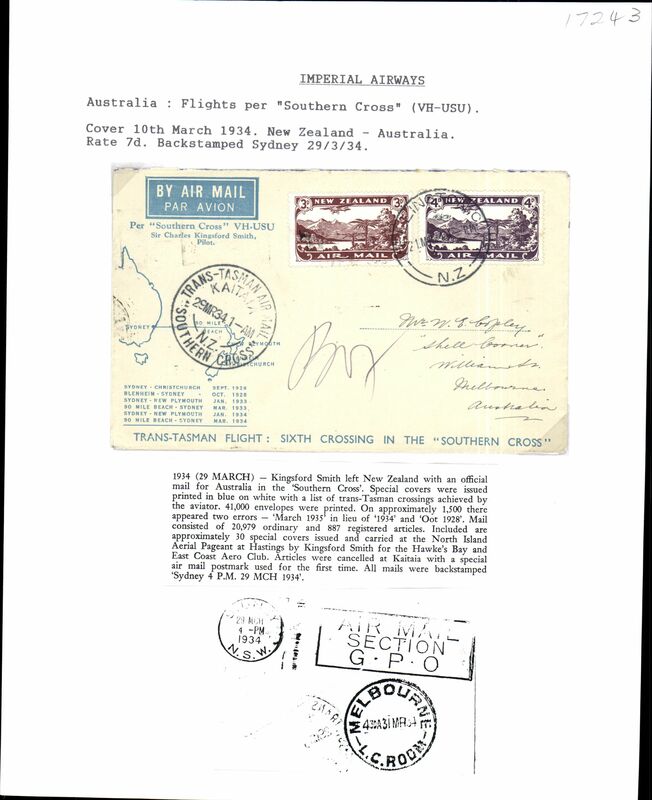 Air Mail Society of NZ Expert Committee Authentication hs and Francis Field authentication hs verso. 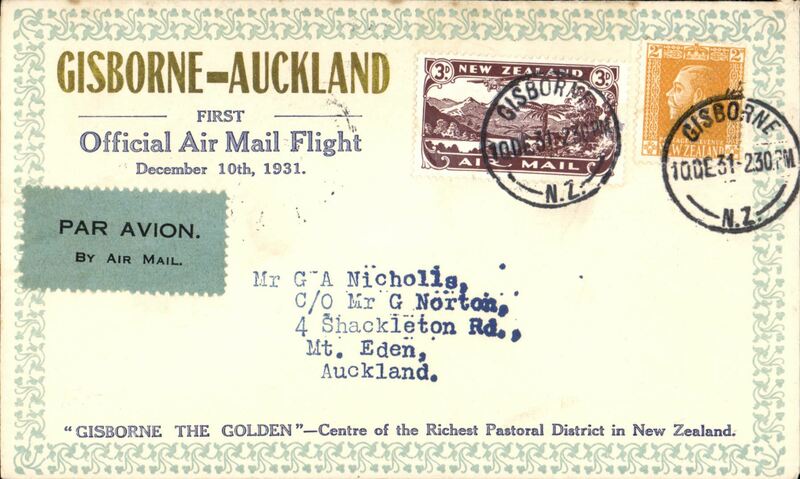 Survey Flight, Gisborne to Auckland, 10/12, uncommon and attractive souvenir airmail cover. 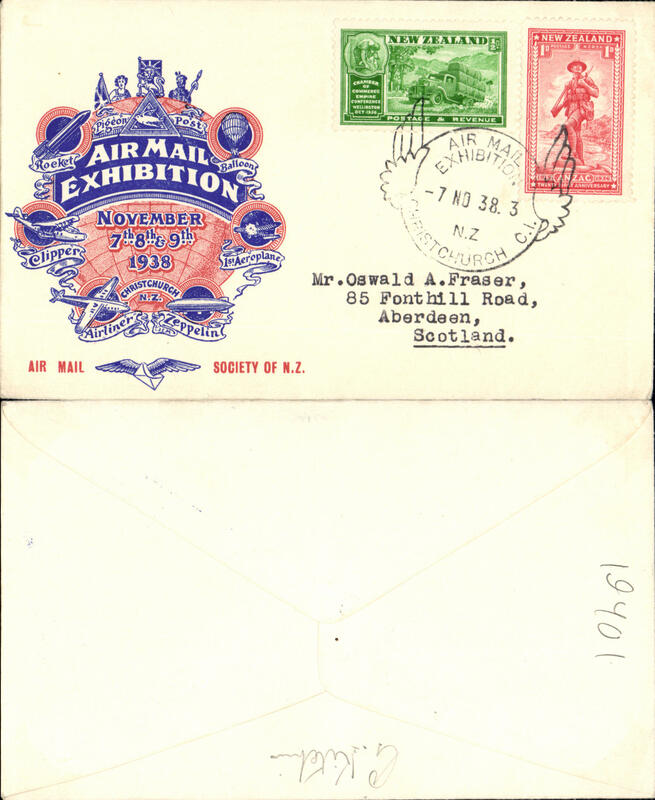 Air travel survey flight, Auckland to Hamilton, bs 10/12, airmail etiquette cover franked 3d air + 1d. Air Mail. 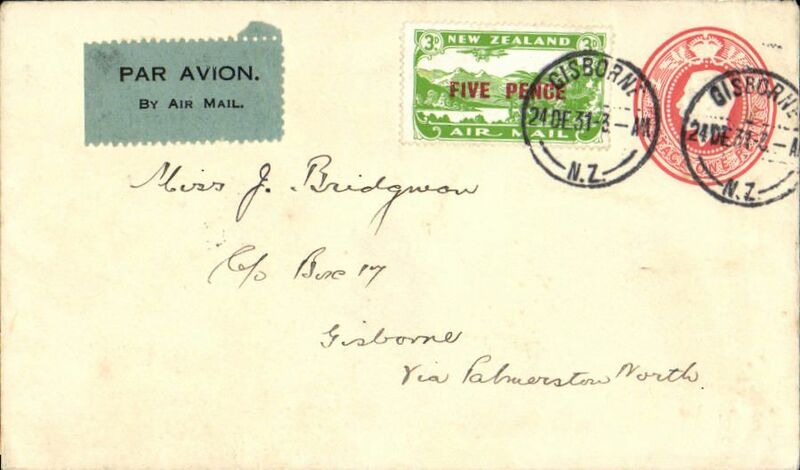 Air travel survey flight, Auckland to Gisborne, bs 10/12, airmail etiquette cover franked 3d air + 1d. Air Mail. 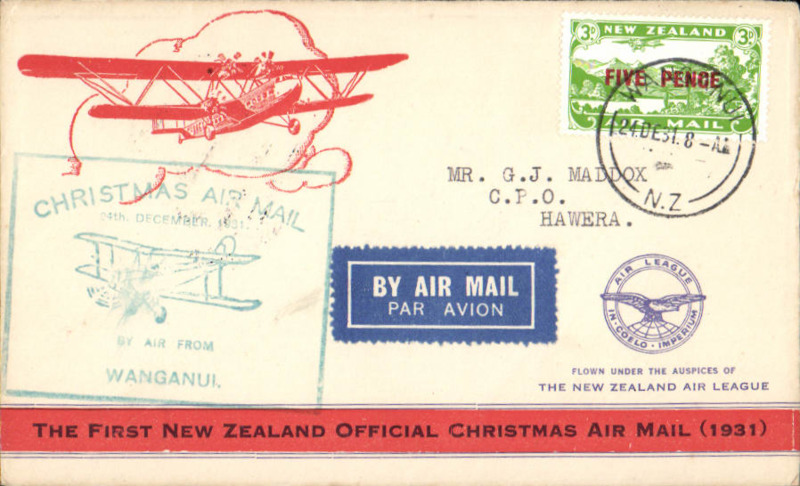 NZ Air League, First New Zealand Official Christmas Air Mail, Wanganui to Hanera, bs 24/12, franked 5d/3d air, large green flight cachet, printed orange/cream souvenir air cover with NZ Air League logo on front. 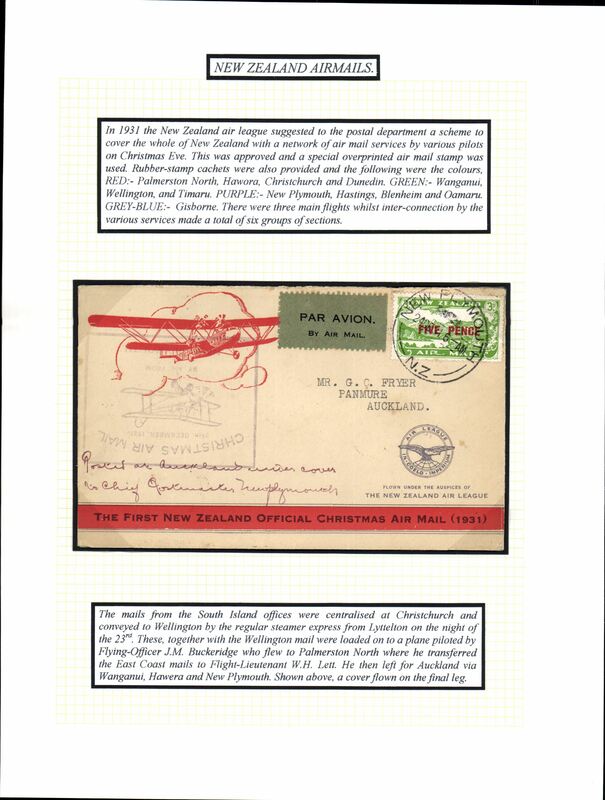 NZ Air League, First New Zealand Official Christmas Air Mail, Christchurch to Omaru, bs 24/12, franked 5d/3d air stamp, airmail etiquette cover. 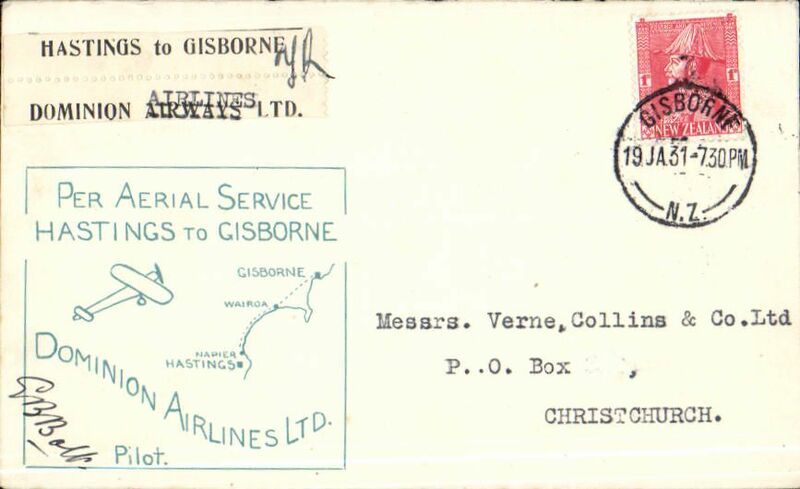 NZ Air League, First New Zealand Official Christmas Air Mail, Gisborne to Palmerston North, franked 5d/3d air stamp, large blue Gisborne flight cachet verso. 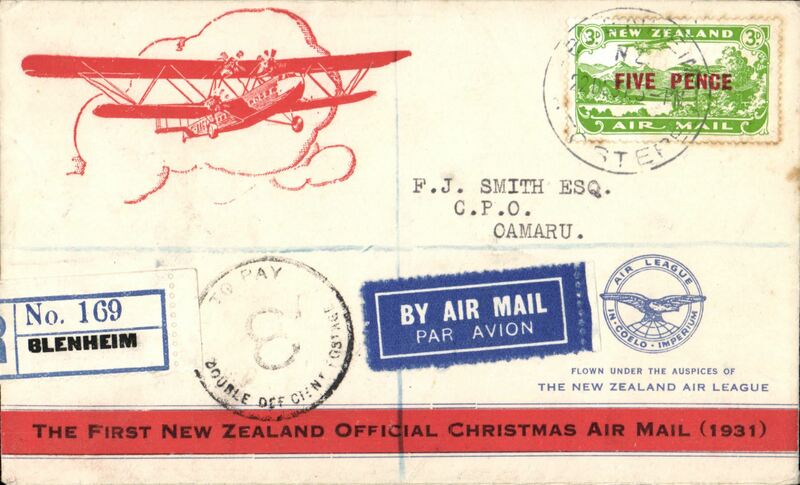 Special Christmas Survey Flight, Blenheim to Oamaru, bs 24/12,attractive registered (label) red/white souvenir cover, franked 5d, underpaid, black 8d postage due hand stamp, violet framed flight cachet verso..
New Zealand Air League, first official Christmas Air Mail, New Plymouth to Auckland, bs 24/12, franked 5d provisional air stamp, large purple flight cachet , printed orange/cream souvenir air cover. 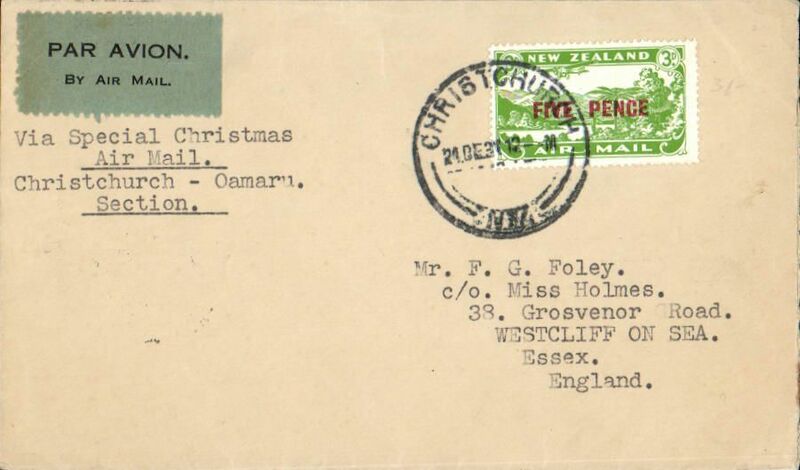 NZ Air League, First New Zealand Official Christmas Air Mail, Wellington to Blenheim, bs 24/12, franked 3d air, large green flight cachet verso, printed orange/cream souvenir air cover. 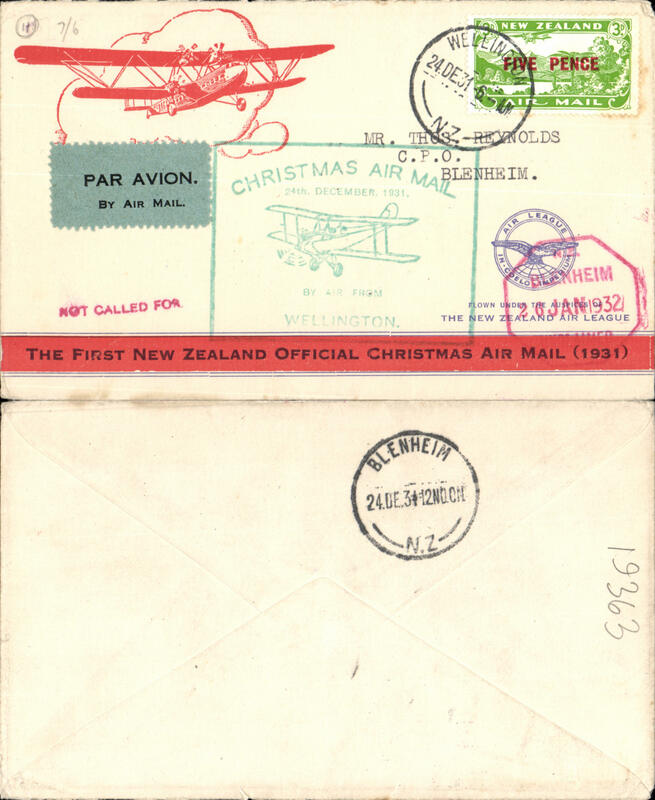 NZ Air League, First New Zealand Official Christmas Air Mail, Palmerston N to Gisborne, bs 24/12, franked 3d air, large red flight cachet verso. 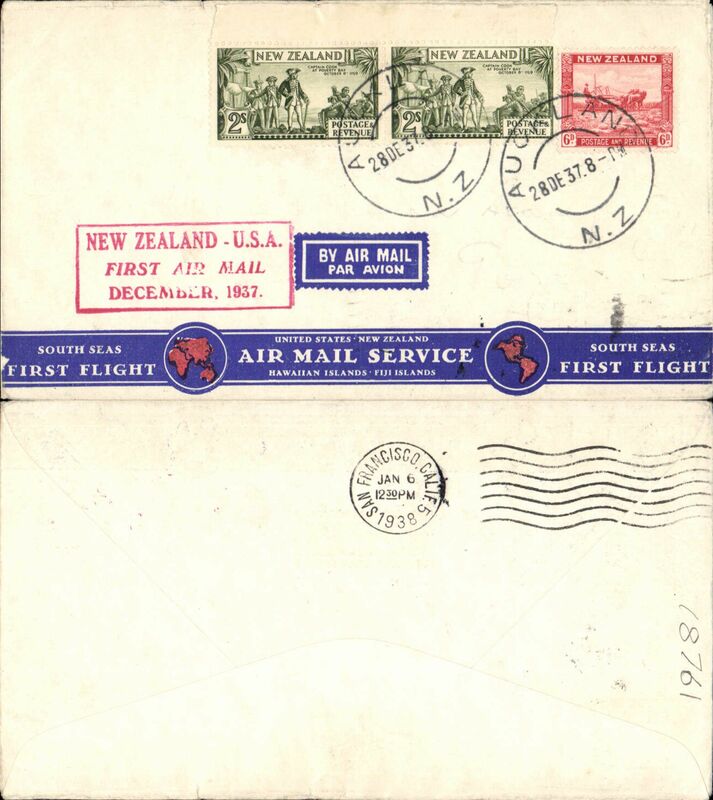 NZ Air League, First New Zealand Official Christmas Air Mail, Blenheim-Omaru, bs 24/12, registered blue/cream 'Great Barrier Island' map cover franked 2x3d air, large violet flight cachet verso. 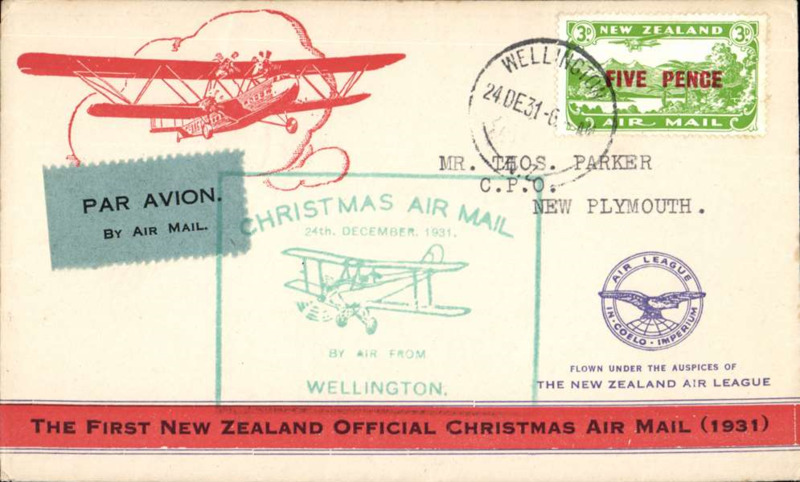 Nz Air League, First New zealand Official Christmas Air Mail, Palmerston North to Invercargill, bs 24/12, franked 5d provisional air stamp, large flight cachet verso, printed orange/cream souvenir air cover. 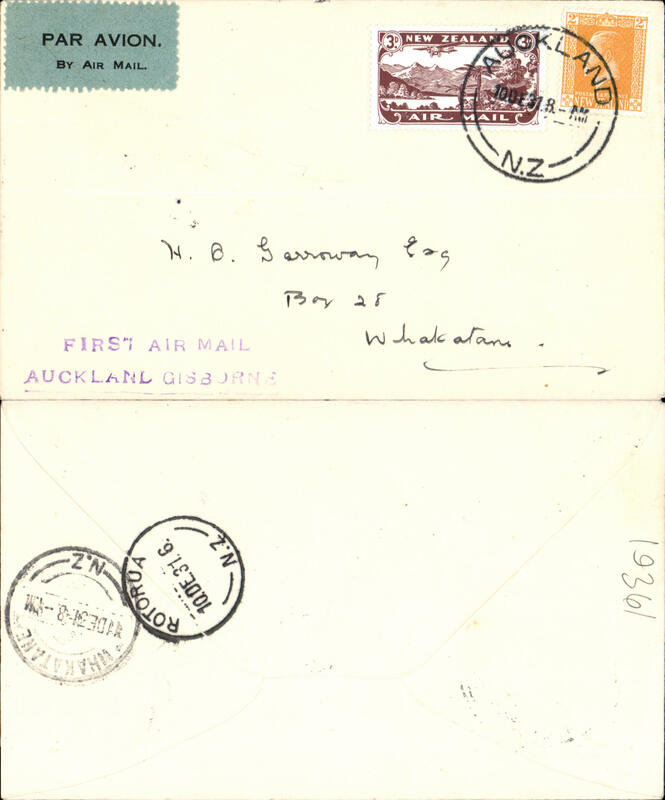 NZ Air League, First New zealand Official Christmas Air Mail, Timaru to Invercargill, bs 24/12, franked 2x 5d provisional air stamp, large flight cachet verso, registered (label) printed orange/cream souvenir air cover, 166 flown. 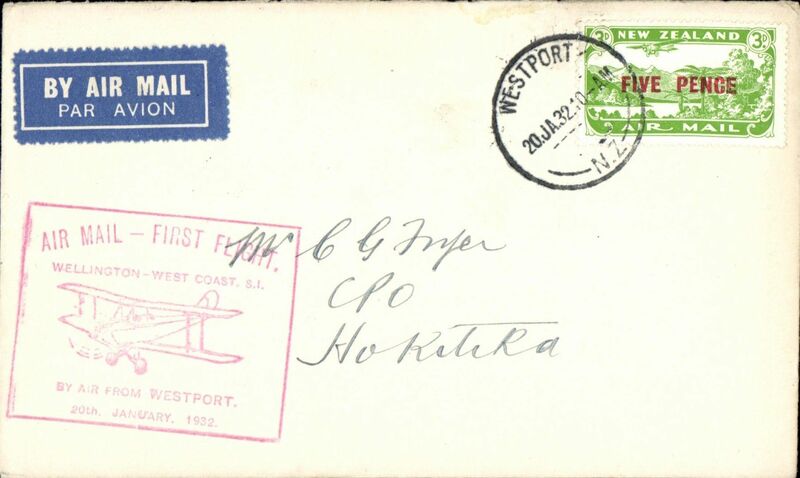 West Coast (South Island) survey flight, Hokitika to Westport, bs 20/1, franked 5d provisional air stamp, large flight cachet , signed by piot Sq Ldr MC McGregor. 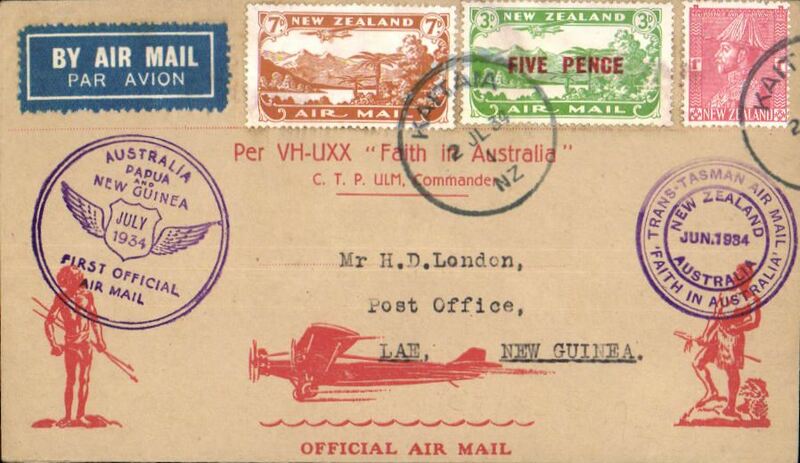 Air Mail Society of Nz Expert Committee Authentication hs verso. 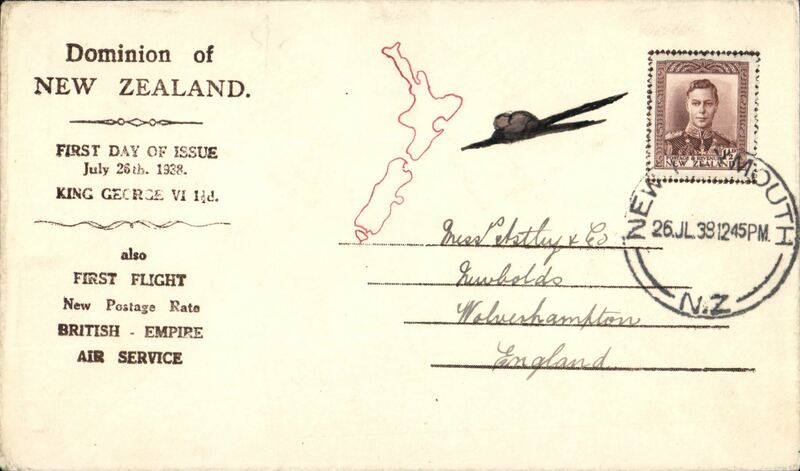 West Coast (South Island) survey flight, Hokitika to Wellington, bs 20/1, franked 5d provisional air stamp, large flight cachet , signed by piot Sq Ldr MC McGregor. 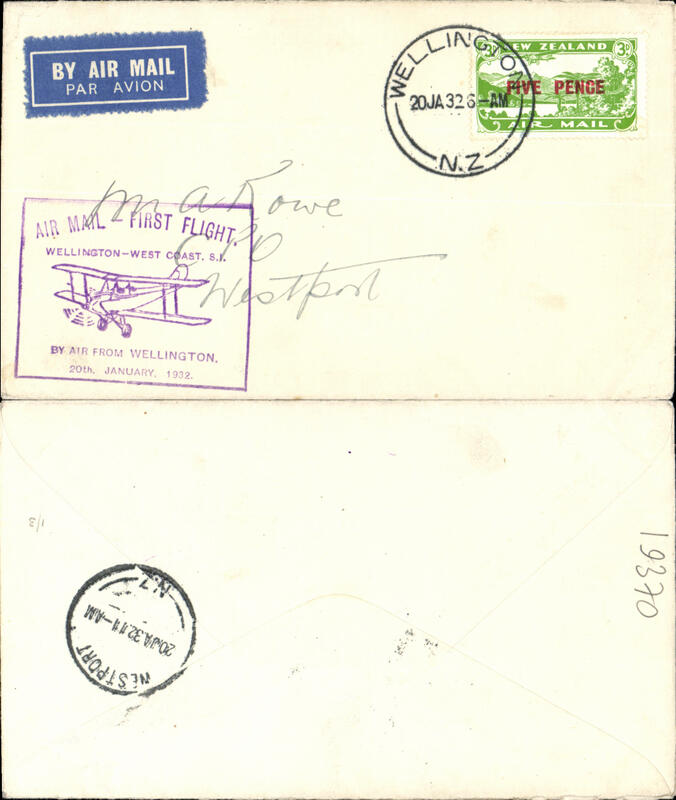 West Coast (South Island) survey flight, Hokitika to Wellington, 3d & 4d air stamps, green cachet, b/s, Air Travel Ltd.
West Coast (South Island) survey flight, Westport to Nelson, bs 20/1, plain cover franked 5d opt air stamp, red flight cachet, Air Travel Ltd. Signed by pilot Squadron Leader M.C.McGregor. Air Travel Ltd, West Coast (South Island) survey flight, Westport to Hokitika leg, 3d air stamp, cachet, bs 20/1. Air Travel Ltd, Wellington-Danneverke survey flight, Danneverke to Masterton, bs 16/3, 3d air stamp, red cachet. Signed by the pilot M.C. McGregor. 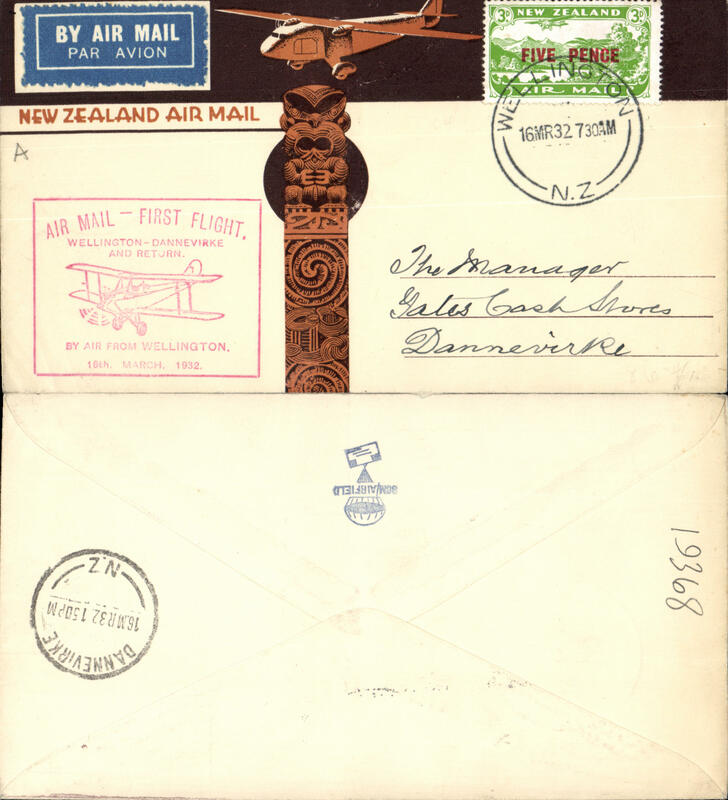 Wellington-Danneverke Survey Flight, bs 16/3, illus NZ Airmail cover with Maori totem and plane, franked 5d air stamp, red flight cachet, Air Travel Ltd.
Danneverke-Wellington Survey Flight, bs 16/3, plain cover franked 4d air stamp, red flight cachet, Air Travel Ltd. 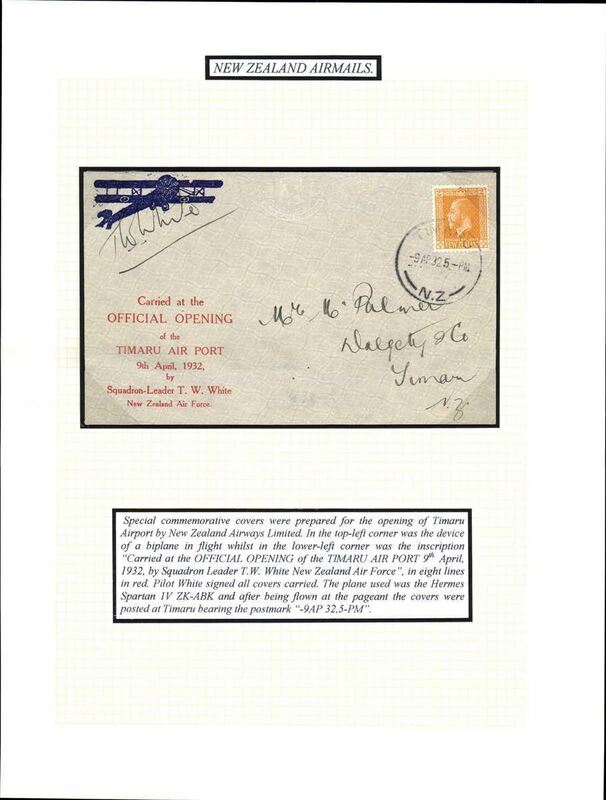 Opening of Timaru Airport, special souvenir cover, flown from Timaru, signed by the pilot TW White. Mounted on album leaf with explanatory text. See scan. 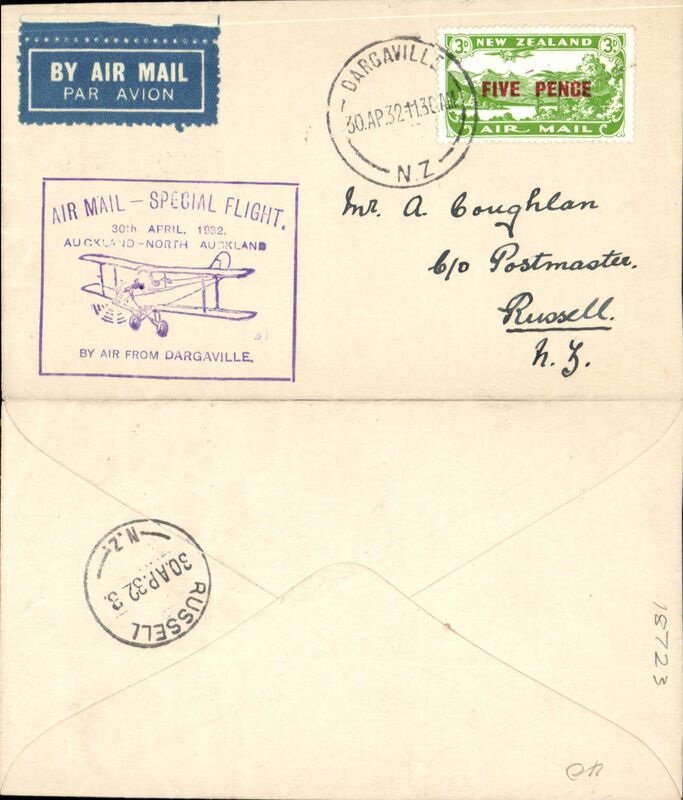 Auckland-North Auckland Survey Flight, Auckland to Russell, bs 30/4, airmail etiquette cover franked 5d/3d air, violet boxed flight cachet verso, Francis Field authentication hs and NZAMS Expert Committee expertisation hs verso. 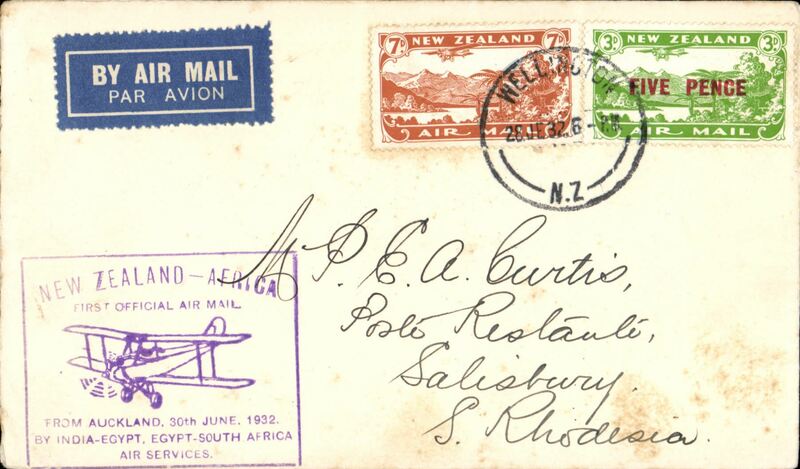 Auckland -North Auckland and Return survey flight, Russell to Auckland, 5d air stamp, cachet, b/s, Air Travel Ltd.
Auckland to Salisbury, S. Rhodesia bs 6/8, first New Zealand acceptance for the Cairo-Cape route, airmail etiquette cover franked 10d, violet boxed "New Zealand- Africa/First Official Air Mail/from Auckland 30th June 1932/by India-Egypt, Egypt-South Africa/Air Services" cachet, Imperial Airways, scare. 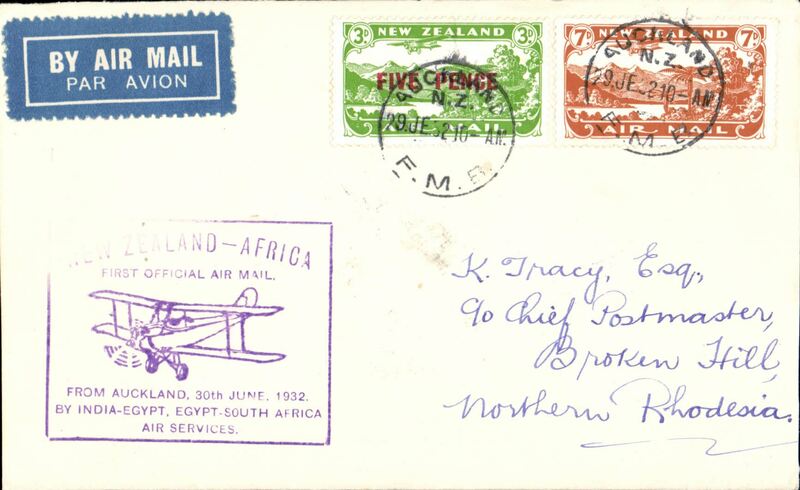 Few light tone spots, see image..
Auckland to Broken Hill bs 5/8, New Zealand acceptance for the Cairo-Cape route, airmail etiquette cover franked 10d, violet boxed "New Zealand- Africa/First Official Air Mail/from Auckland 30th June 1932/by India-Egypt, Egypt-South Africa/Air Services" cachet, Imperial Airways, NZAMS confirmation cachet verso. Scarce. 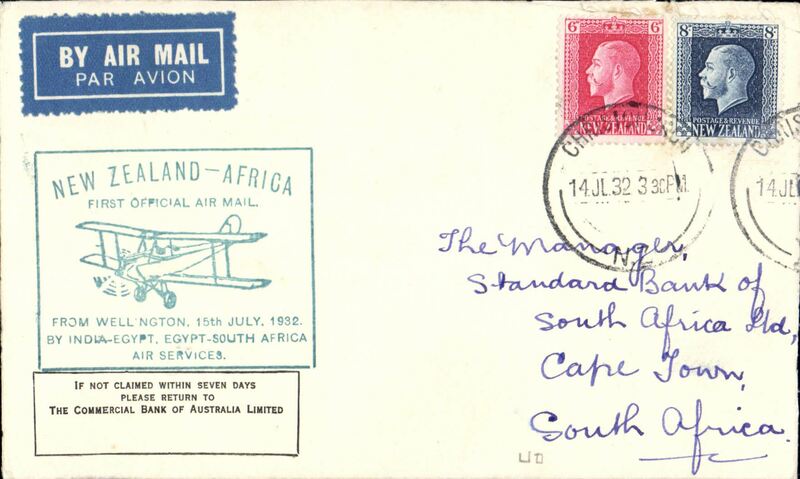 First NZ acceptance from Christchurch via the Wellington dispatch for the Imperial Airways African service, green New Zealand-Africa cachet applied at Wellington, addressed to Cape Town, bs 21/8, franked 1/2d, NZAMS confirmation cachet verso. Covers from the Wellington dispatch are much scarcer, see Walker, p129. 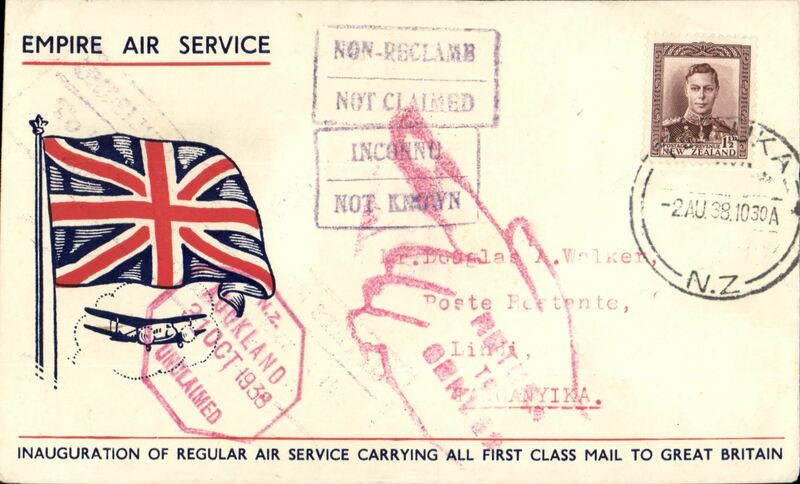 First NZ acceptance from Christchurch for Nairobi bs 17/8 via Cairo 13/8, via the Wellington dispatch for the Imperial Airways African service, blue New Zealand-Africa cachet applied at Wellington, franked 11d. Covers from the Wellington dispatch are much scarcer, see Walker, p129. 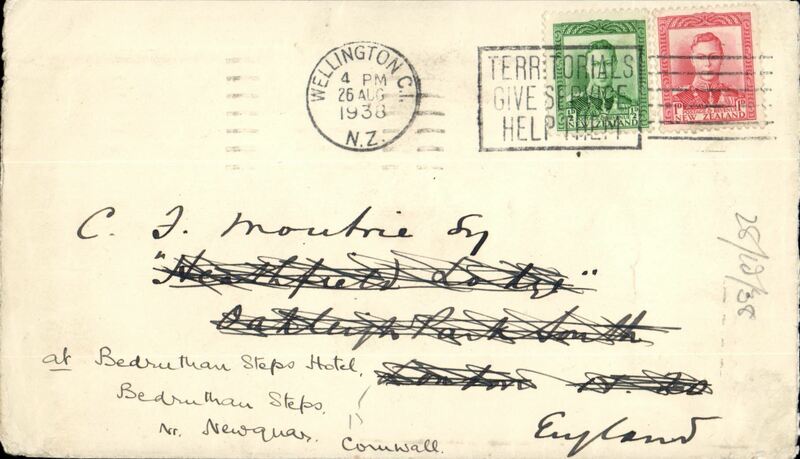 First NZ acceptance from Wellington for Mbeya 18/8 via Cairo 13/8, via the Wellington dispatch for the Imperial Airways African service, green New Zealand-Africa cachet applied at Wellington, franked 11d. Covers from the Wellington dispatch are much scarcer, see Walker, p129. 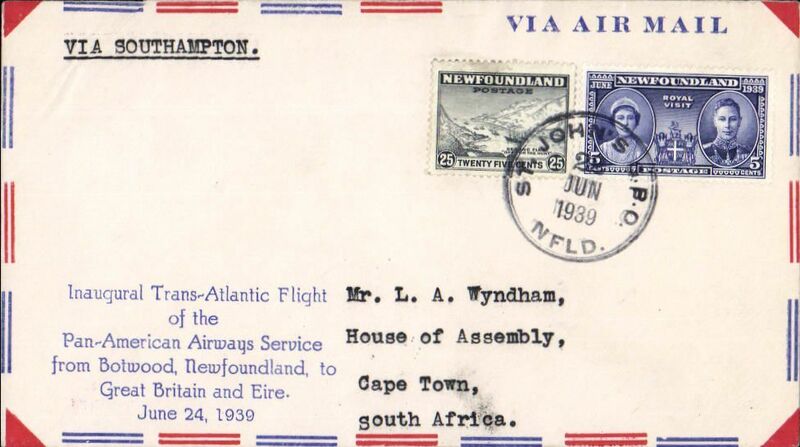 First NZ acceptance from Wellington for Imperial Airways African service, green New Zealand-Africa cachet applied at Wellington, addressed to Bulawayo, S Rhodesia, franked two 5d airs & 1d Admiral. 50 centimes postage due mark. Covers from the Wellington dispatch are much scarcer, see Walker, p129. 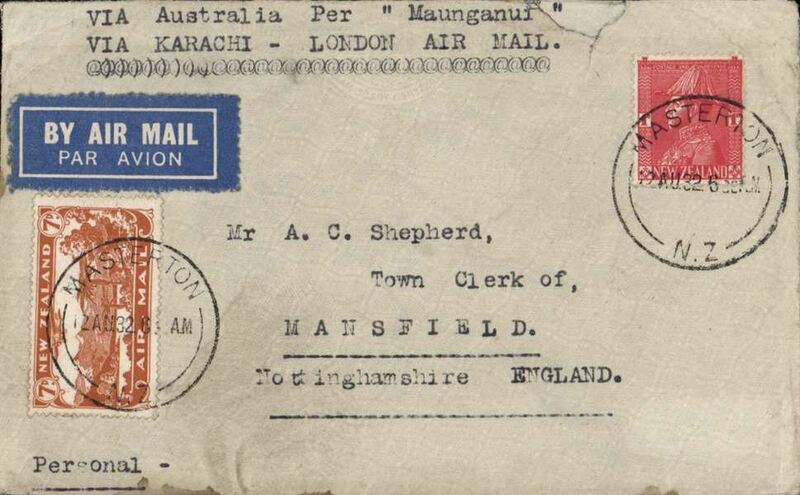 New Zealand to England, airmail etiquette cover franked 7d air + 1d, canc Masterton 12 AU 32 cds, typed 'Via Australia Per "Maunganui"/Via Karachi - London Air Mail', carried by TSS. Maunganui on the trans Tasman service from Auckland to Sydney. The TSS Maunganui was a passenger vessel built by for the Union Steamship Company of New Zealand to carry the Royal Mail on the Auckland-Sydney-San Francisco runs. Small top edge tear and some rough opening verso. 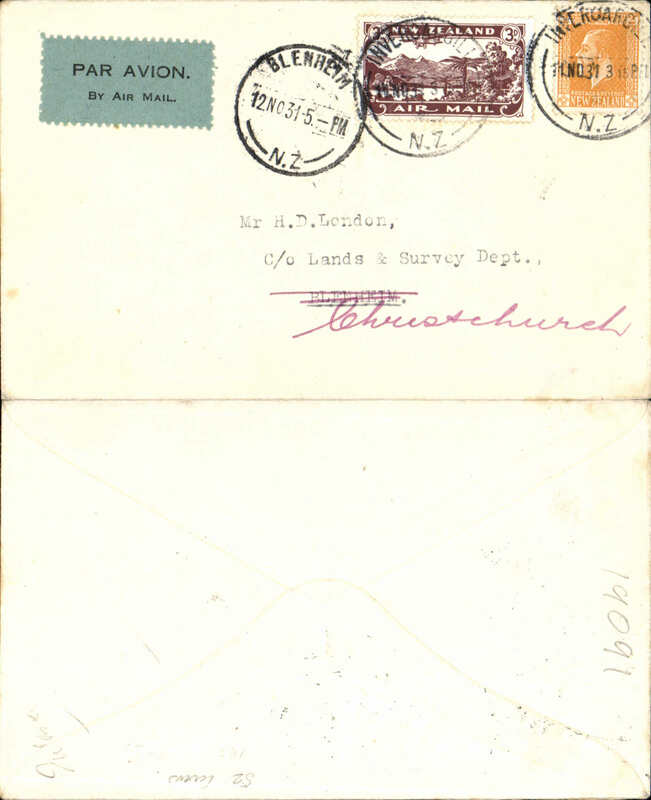 Special Survey Hotitika-Okuru and Return, Palmerston North to Waiho Gorge, b/s, franked 4d air stamp, cachet, Westland Aero Club. 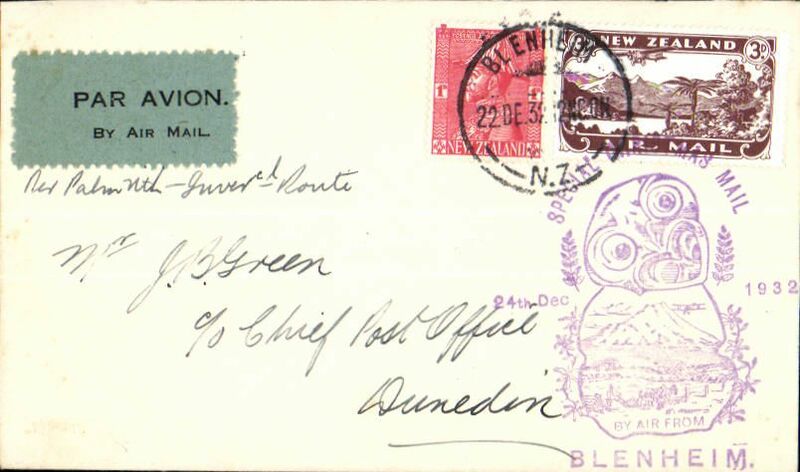 Westland Aero Club, special survey Hokitika to Okuru, b/s, franked 4d air stamp, cachet, b/s. 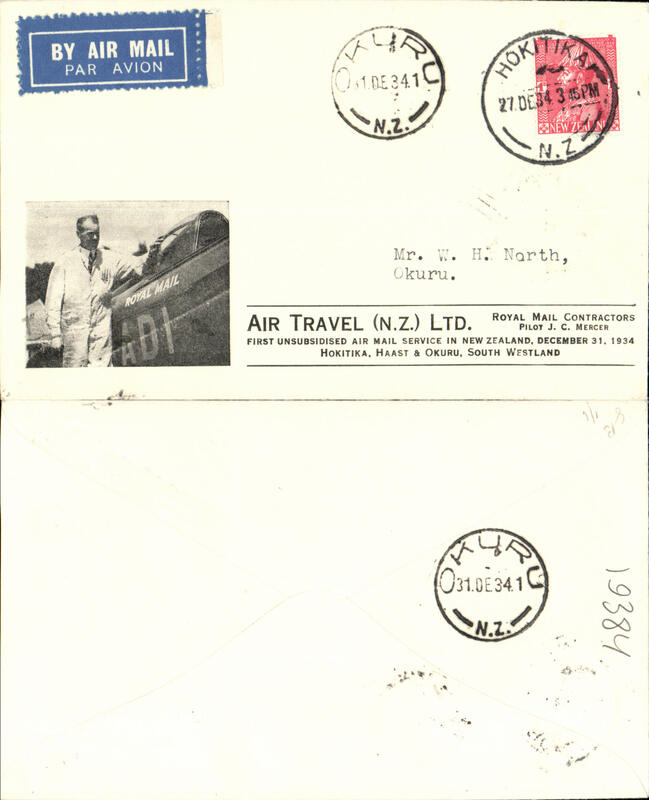 Special Survey Hotitika-Okuru and Return, Hokitika to Okuru bs 28/9, and return to Hokitika 29/9, franked 7d air stamp, blue Hokitika-Okuru cachet on front and purple Hokitika to Okuru cachet verso , Westland Aero Club. 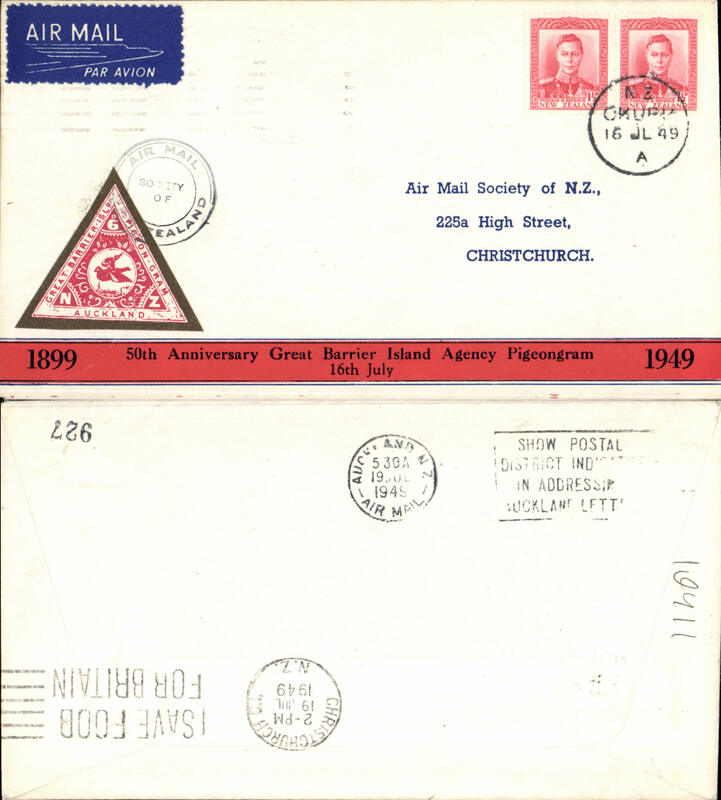 Air Mail Society of NZ Expert Committee Authentication hs. 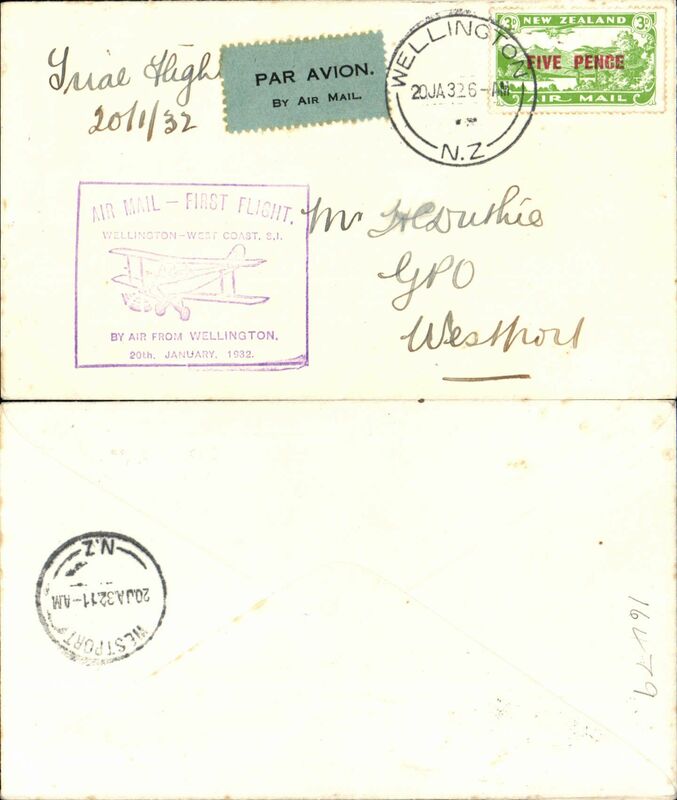 Westland Aero Club, special survey Hokitika to Waiho Gorge to Hokitika, bs 28/9, franked 4d air stamp, cachet. 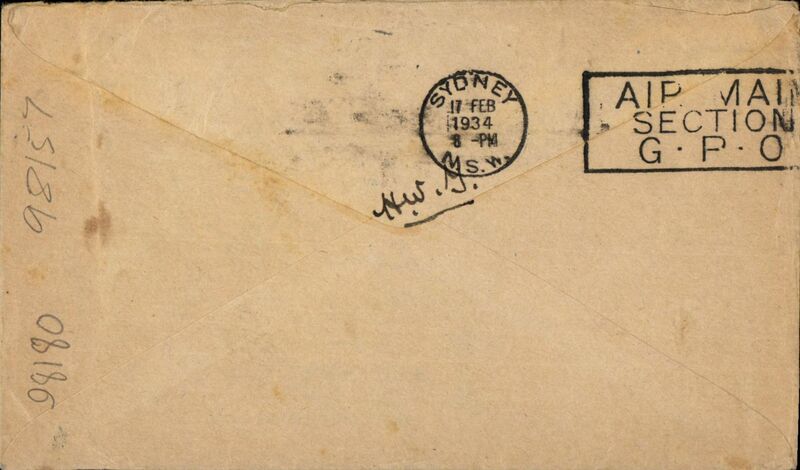 Gisborne to Cape Town, bs 9/1/33, registered airmail cover franked 1/5d canc Gisborne cds, ms 'Per Karachi-Cairo/Air Mail'. What took so long? Image. 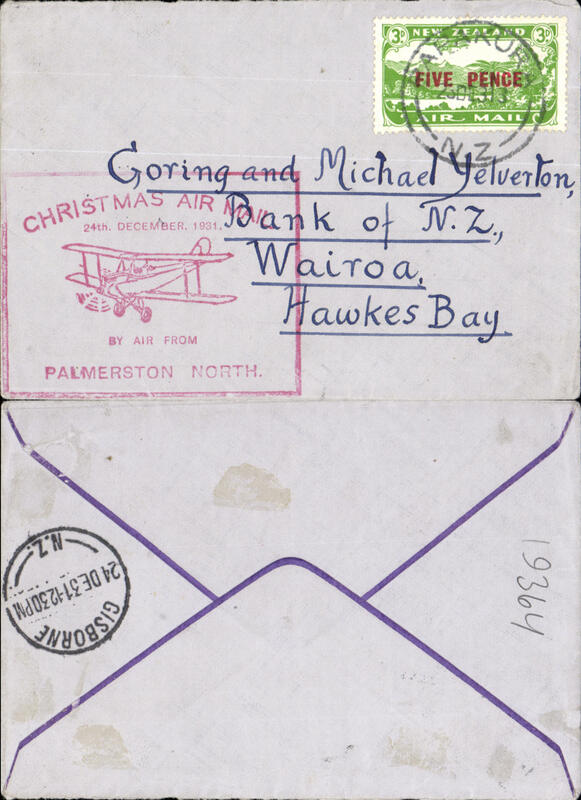 NZ Air League Christmas Air Mail Flight, Blenheim-Dunedin, bs 24/12 plain cover franked 3d air + 1d, large violet cachet. 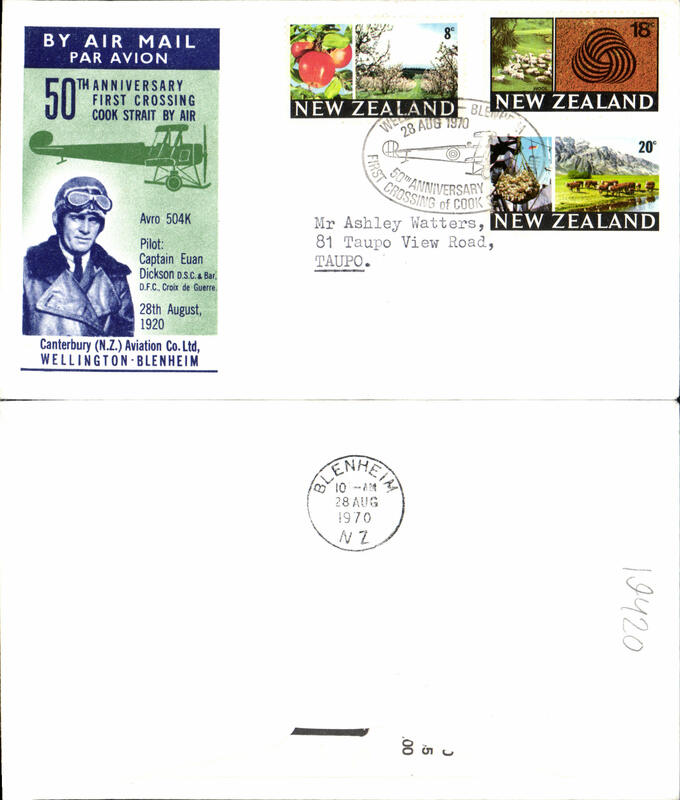 First Non Stop Auckland to Invercargill, franked 4d, violet boxed cachet, bs 12/12, printed black/white souvenir cover with CTP Ulm inset, per Faith In Australia. Signed by the pilot G.U.Allan. 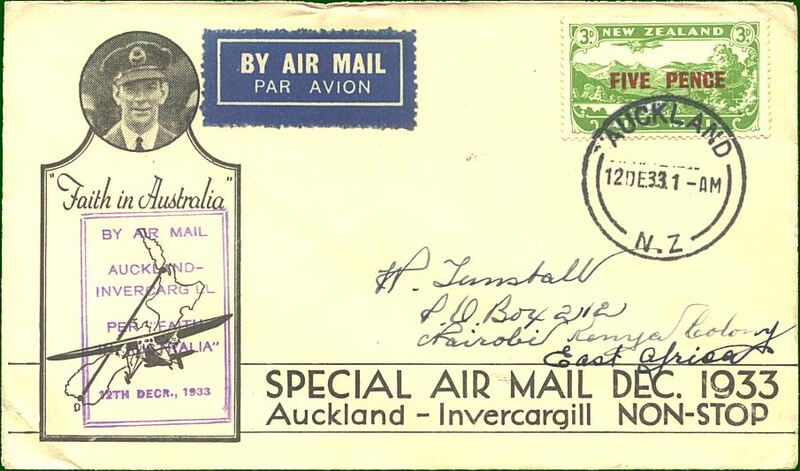 First accept New Zealand mail for Kenya carried by air on the inaugural airmail Auckland to Invercargill service, bs Invercargill 12/12, then by sea to India and on to Nairobi, bs 20/1, franked 5d air, violet boxed cachet "By Air mail/Auckland/Invercargill/Faith in Australia", printed black/white 'Faith in Australia' souvenir cover with CTP Ulm inset and addressed to H Tunstall. 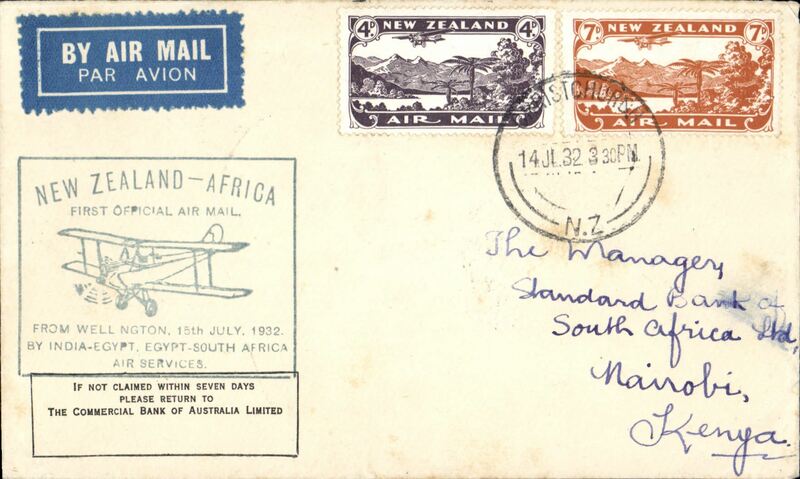 New Zealand acceptance for Africa, Auckland to Nairobi, bs 20/1, carried of the F/F special airmail Auckland to Invercargill, bs 12/12, then by sea to India, franked 5d air, violet boxed cachet "By Air mail/Auckland/Invercargill/Faith in Australia", printed black/white souvenir cover with CTP Ulm inset, and addressed to H Tunstall. 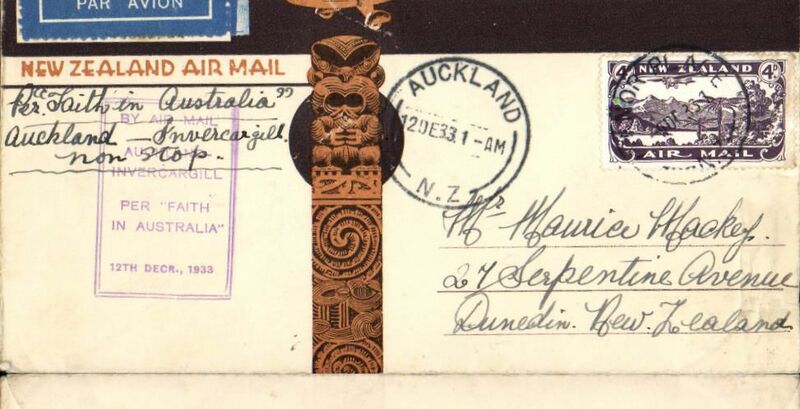 First Non Stop Auckland to Invercargill, bs 12/12, illus brow/cream NZ Airmail cover with Maori totem and plane, franked 4d, violet boxed 'First Non Stop' cachet. 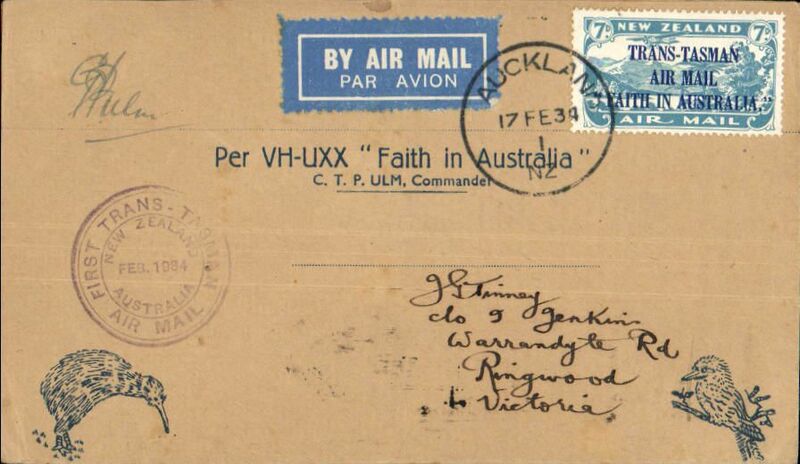 'Faith in Australia', Auckland to Sydney, bs 17 Feb, special Ulm card overprinted 'Per VH-UXX "Faith in Australia"/ C.T.P. 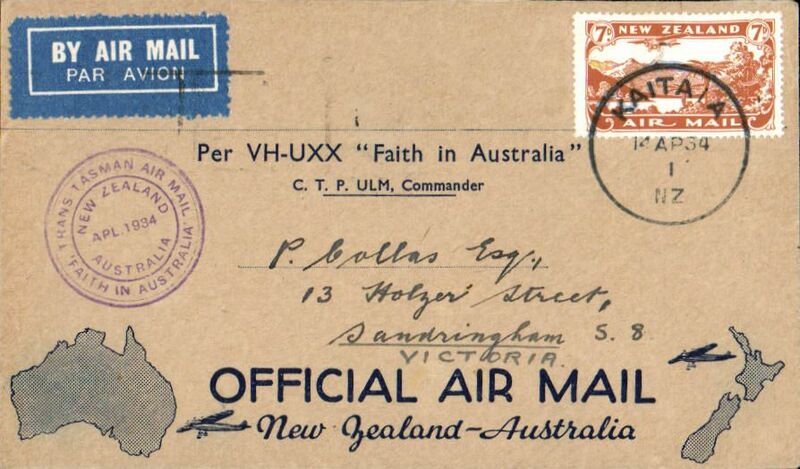 Ulm Commander', franked New Zealand 'Trans-Tasman' 7d, canc Auckland 17 Feb 34 cds, also fine strike violet circular First Trans-Tasman flight cachet, signed CPT Ulm and GU Allan. AAMC #361, cat $300. Only 100 flown. 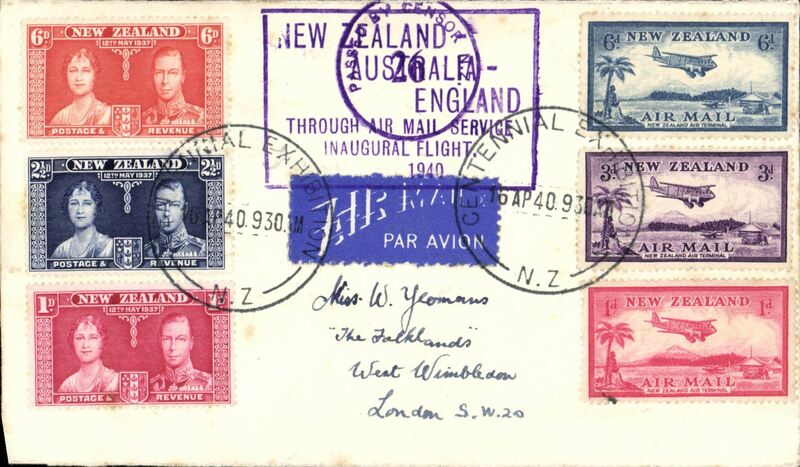 New Zealand to Switzerland, no arrival ds, flown to Sydney by CP Ulm on the first official mail flight from New Zealand to Australia, bs 17/2, franked 7d + 1 1/2d , violet circular "Trans Tasman" flight cachet, official blue/buff Kiwi/Kookaburra souvenir cover, In ms 'From W.Windham'/Founder of the 1st Aerial Mail' written in the same hand as the address, see scan. 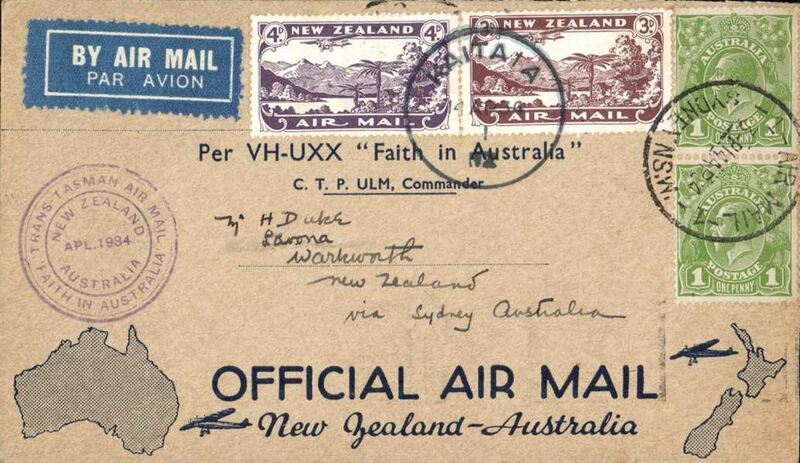 Slight rough opening verso..
New Zealand to South Africa, Auckland to Cape Town, 24/3 via Sydney 18/2, carried on the First Official Trans-Tasman airmail flight in "Faith in Australia", violet circular cachet, plain cover franked 1/8d. Two edge tone spots. See image. 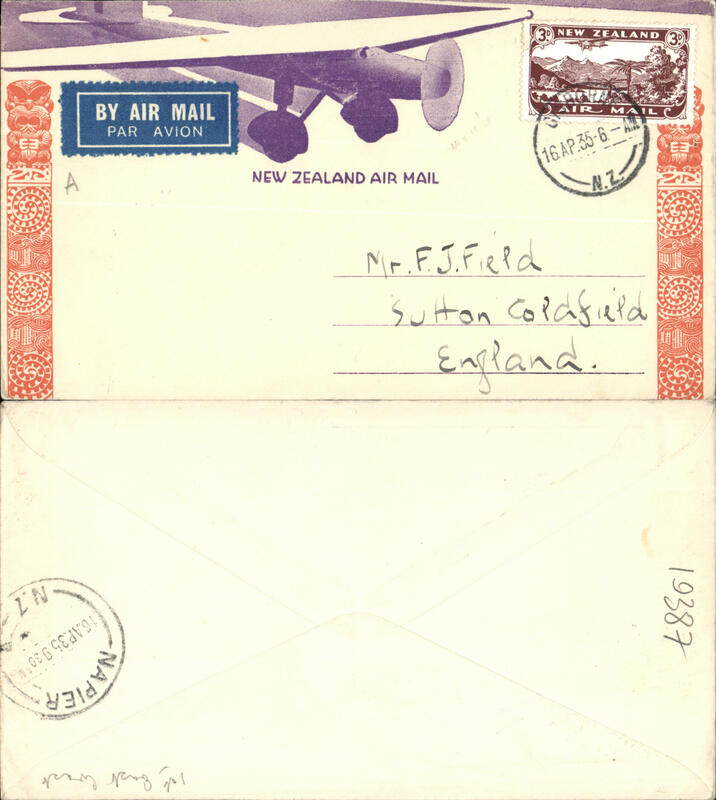 A fascinating one off registered first official aimail cover New Zealand to Australia, bs Sydney 7/2 dedicated to Mr Val Dunne, Superintendant of Mails at Auckland, franked 7d, special purple cachet. Attached to the back is a newspaper cutting giving a 300 word account of his colourful life. One for the memory bank and/or the exhibit. 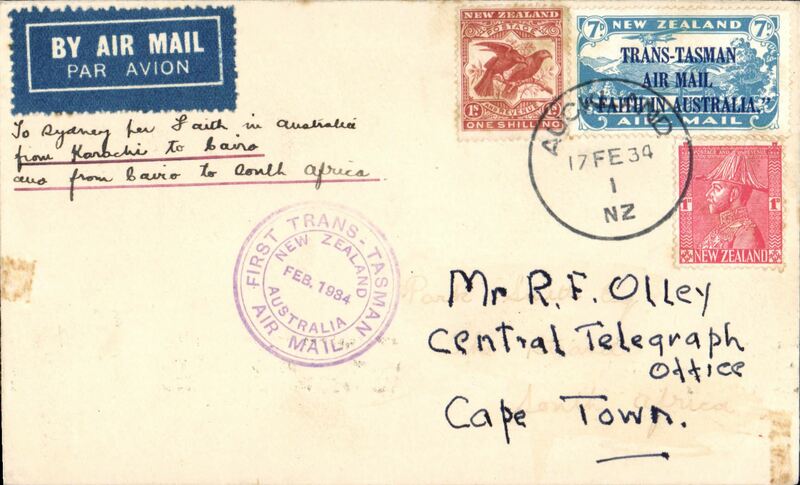 Auckland to Nairobi, no arival ds, carried on CP Ulm, First official mail, New Zealand to Australia, bs Sydney 17/2 , franked 7d "Trans Tasman" opt, special "First tans Tasman" cachet, Kiwi cover addressed to H Tunstall. 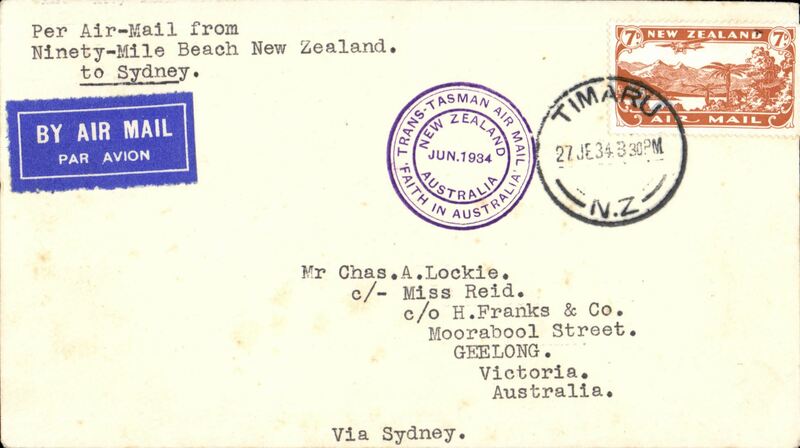 CP Ulm, First official mail, Auckland to Sydney, bs 17/2, franked 7d "Trans Tasman" opt, special cachet, official Kiwi cover. 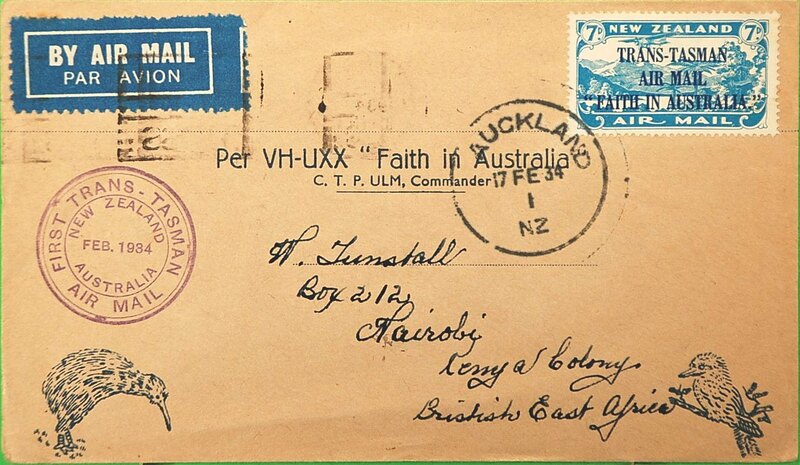 CP Ulm, First official mail, New Zealand to Australia, bs 17/2, plain airmail etiquette cover franked 7d "Trans Tasman" opt, official violet cachet. 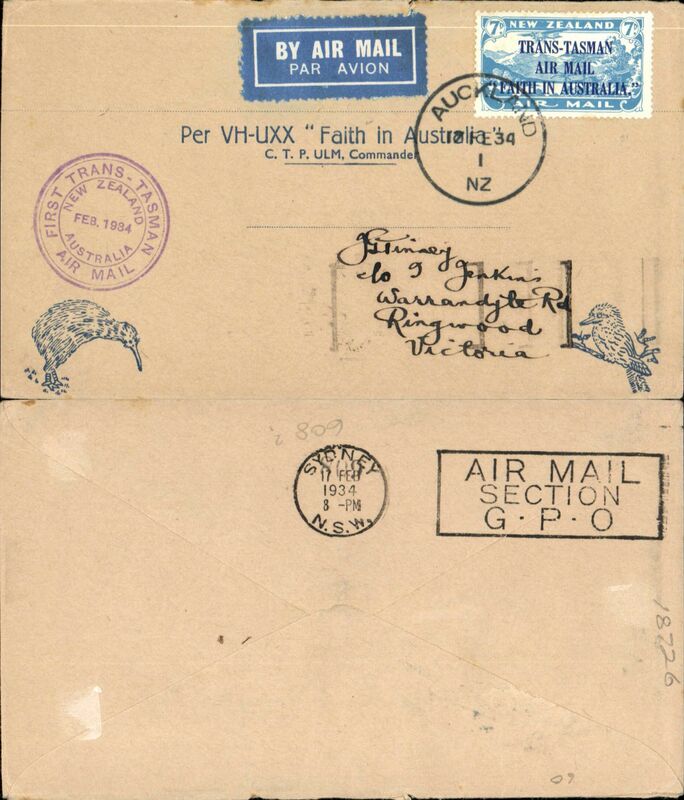 New Zealand to French Indochina, Auckland to Saigon, bs 13/3, via Sydney 17/2, carried on the First Official Trans-Tasman airmail flight in "Faith in Australia", violet circular cachet, plain cover franked 7d, black 'T/30/centimes' in circle underpaid hand stamp. Uncommon acceptance. 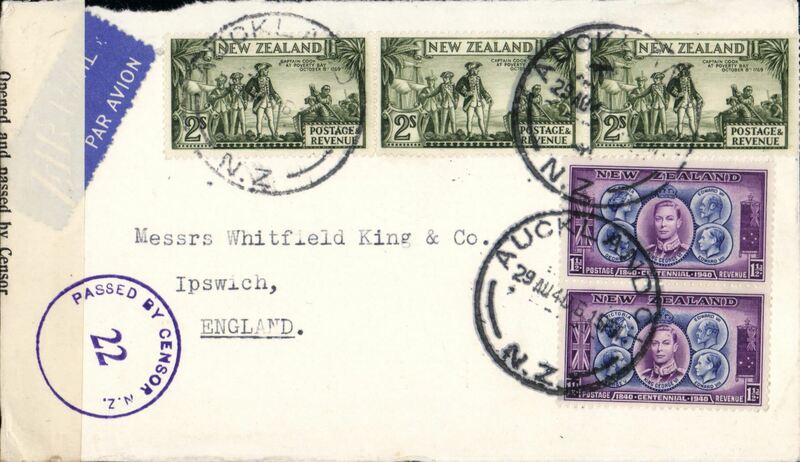 First official mail, New Zealand to Australia, Sydney 7/2 arrival ds on front, official Kiwi cover franked 7d "Trans Tasman" opt canc Auckland 17 Feb 34 cds, special purple cachet. 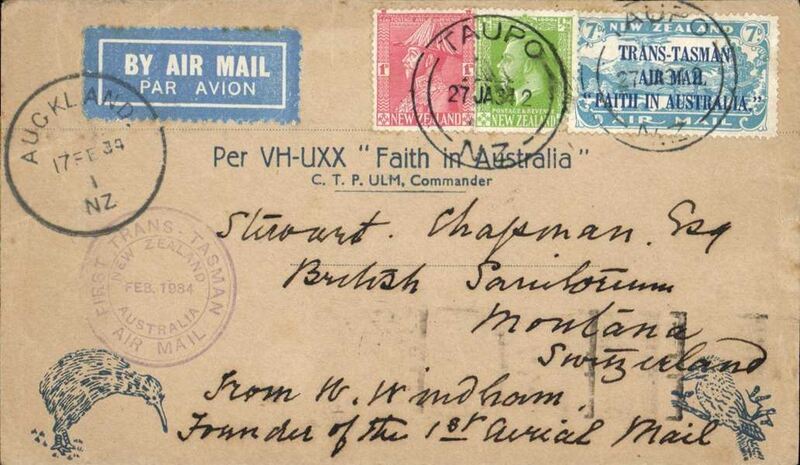 CP Ulm, first official mail, New Zealand to Australia, bs Sydney 17/2, franked 7d "Trans Tasman" opt, special cachet, official blue'buff Kiwi/Kookaburra souvenir cover, signed by pilot CP Ulm. 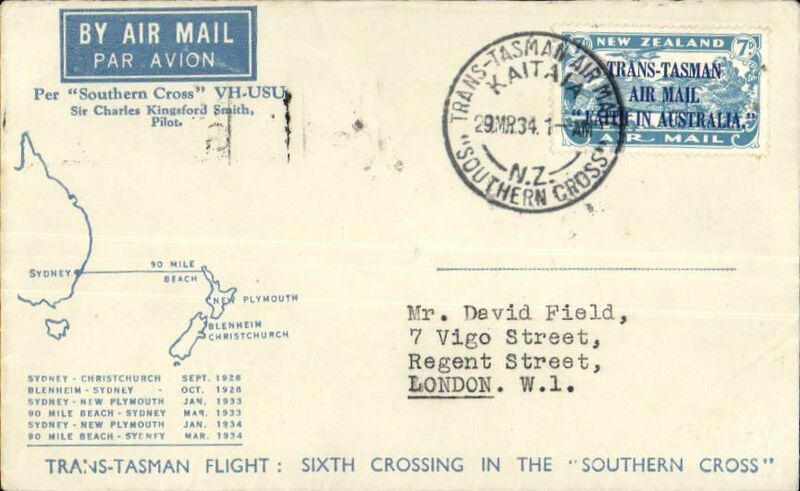 Sixth Trans Tasman crossing of VH-USU Southern Cross, Kaita to Sydney, no arrival ds, bluecream souvenir cover with map and list of crossings, franked 3d & 4d airs canc Kaita cds, violet circular Trans Tasman souvenir flight cachet. Signed by Charles KIngsford Smith and typed "Carried personally by Sir Charles KIngsford Smith across the Tasman on March 29th 1943". Nice item in fine condition. 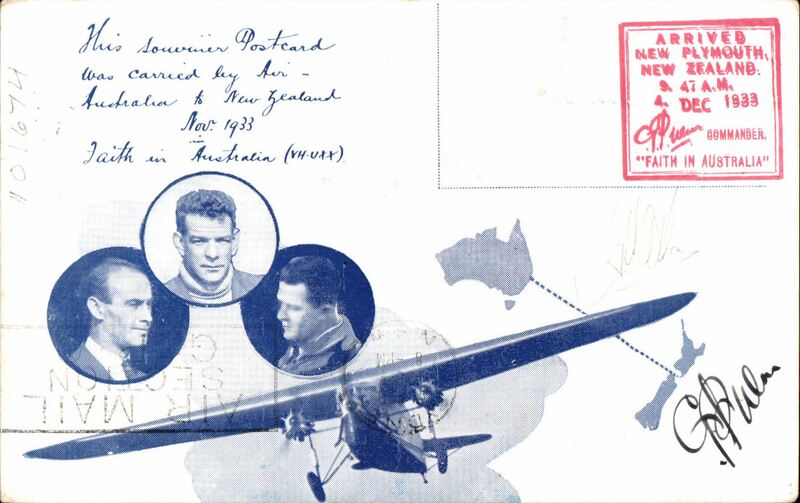 Sixth Trans Tasman crossing of VH-USU Southern Cross, Kaita to Sydney, bs 22/3, bluecream souvenir cover with map and list of crossings, franked 7d air canc Kaita cds, violet circular Trans Tasman souvenir flight cachet. 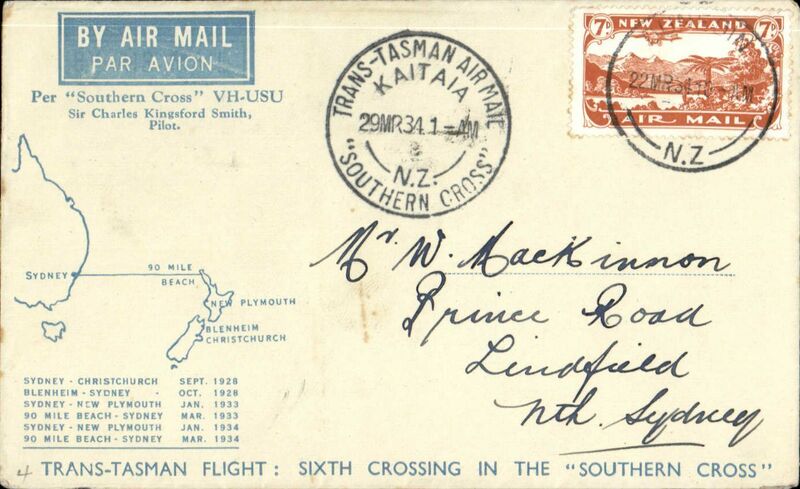 Sixth Trans Tasman crossing of VH-USU Southern Cross, Kaita to Sydney, bs 29/3, franked 7d air canc Dunedin 22 Mar 34 cds, fine strike black Kaita dated 29 March souvenir cachet, attractive blue cream souvenir cover with map and list of crossings franked 7d air. 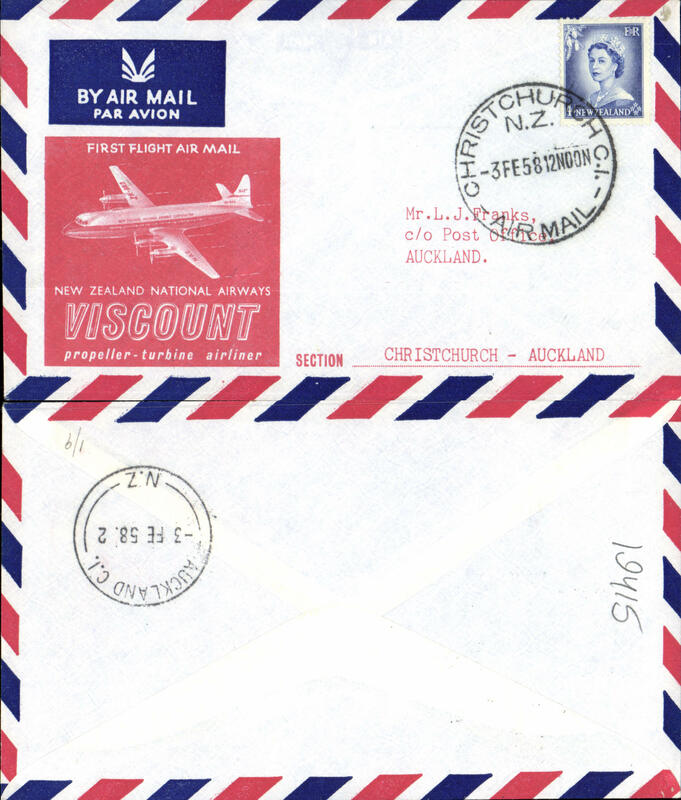 Kaita-Sydney flight of VH-USU and return by sea, Kaita souvenir pm, bs Sydney 29/3, blue/white souvenir cover franked 3d & 4d air, canc Wellington cds, also Melbourne return cds 31/3. 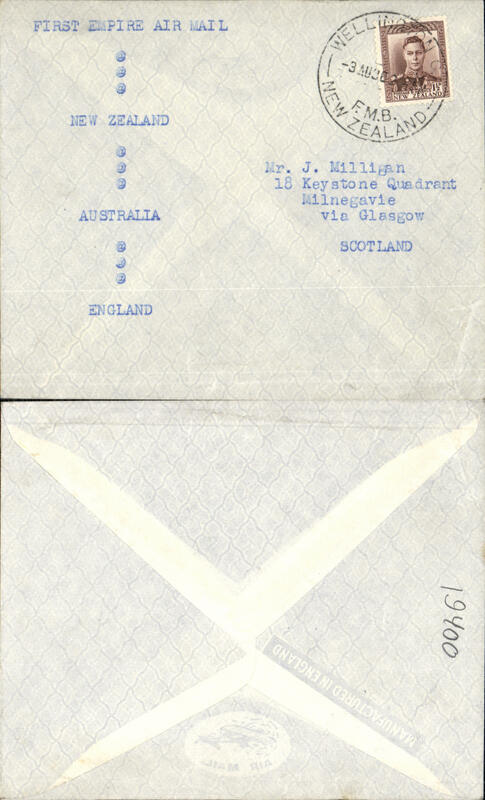 Sixth Trans Tasman crossing of VH-USU, Kaita to Sydney, franked 7d air canc Kaita souvenir postmark bs Sydney 29/3, blue/white registered (label) souvenir cover, . 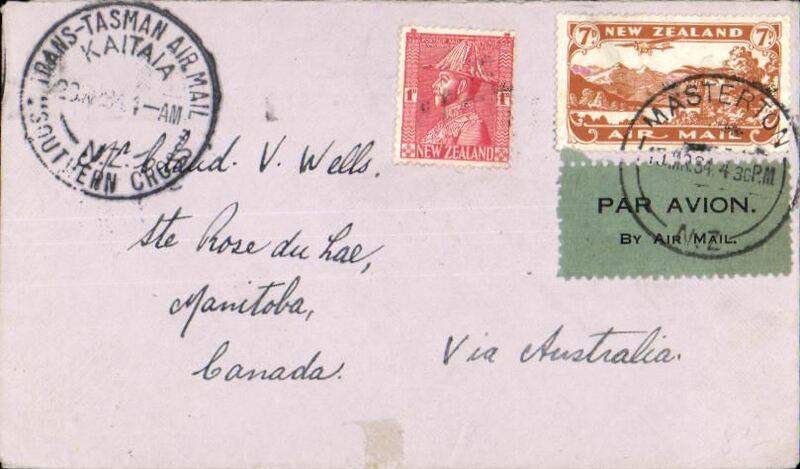 New Zealand to Canada, bs Rose du Lac 28/4, via Sydney 29/3 Air Mail Section, carried on Kingsford Smith's "Southern Cross" Kaita-Sydney flight, black circular flight cachet, plain cover franked 7d air +1d tying black/pale green airmail etiquette. 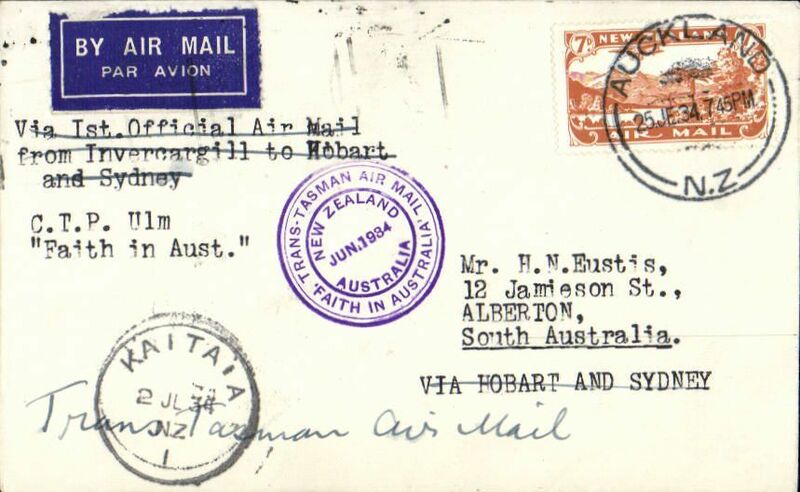 New Zealand to Australia, bs Sydney 14/4, and Return, bs Warkwoth, NZ, 26/4, official dark blue/buff 'maps' souvenir cover franked 7d NZ air canc Auckland 14/4, and 2d Australia stamps canc Sydney 14, violet circular 'Jun 1934 Trans Tasman' flight cachet. 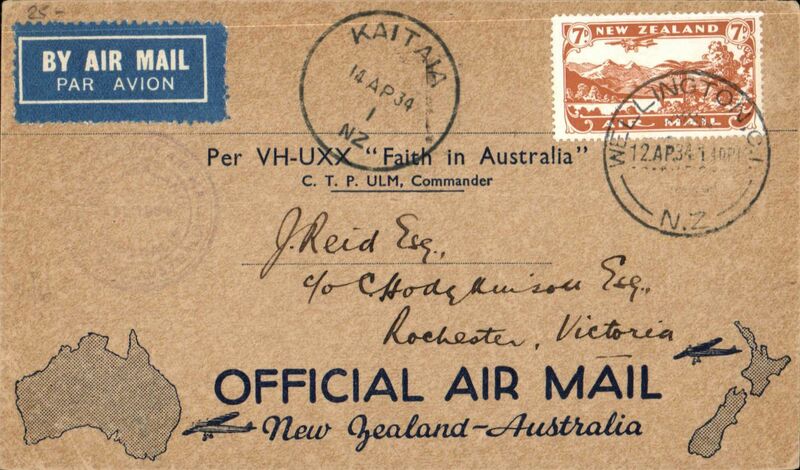 Kaitaia to Sydney Trans Tasman flight of VH-UXX, Kaita to Sydney, b/s 14/4, circular flight cachet, registered buff/blue 'Official Air Mail' souvenir cover, franked 10d airs. Kaitaia to Sydney Trans Tasman flight of VH-UXX, Kaita to Sydney, b/s 14/4, buff/dark blue souvenir 'maps of Australia & New Zealand souvenir cover, franked 7d air, circular flight cachet, blue/white etiquette. 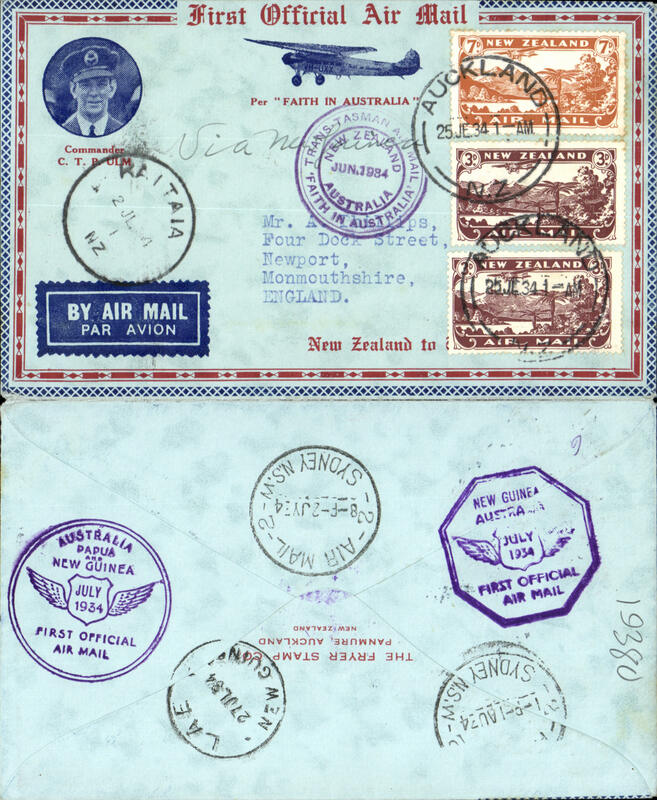 Kaitaia-Sydney Trans Tasman Flight VH-UXX, Kaitaia to Sydney, bs 14/4, buff/dark blue souvenir 'maps of Australia & New Zealand souvenir cover, franked 7d air, violet circular 'April' flight cachet, blue/white etiquette. 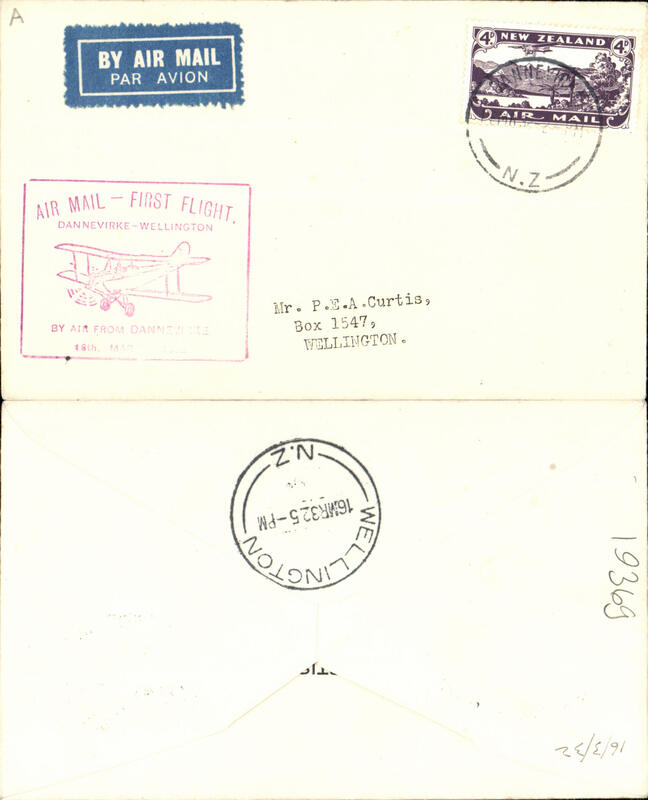 Kaitaia-Sydney Papua-New Guinea & Return Flight to Australia, red/blue/dark blue souvenir cover with inset of Ulm, franked 7d NZ 3d air x3 and 5d air opt, canc Auckland 26/6, b/s Sydney 2/7 and Kaitaia 2/7, violet circular 'Jun 1934 Trans Tasman' flight cachet and 'Australia-Papua/New Guinea Jul 1934' cachets on front, and violet hexagonal 'Papua-Australia Jul 1934' cachet verso, blue/white etiquette. Attractive item. 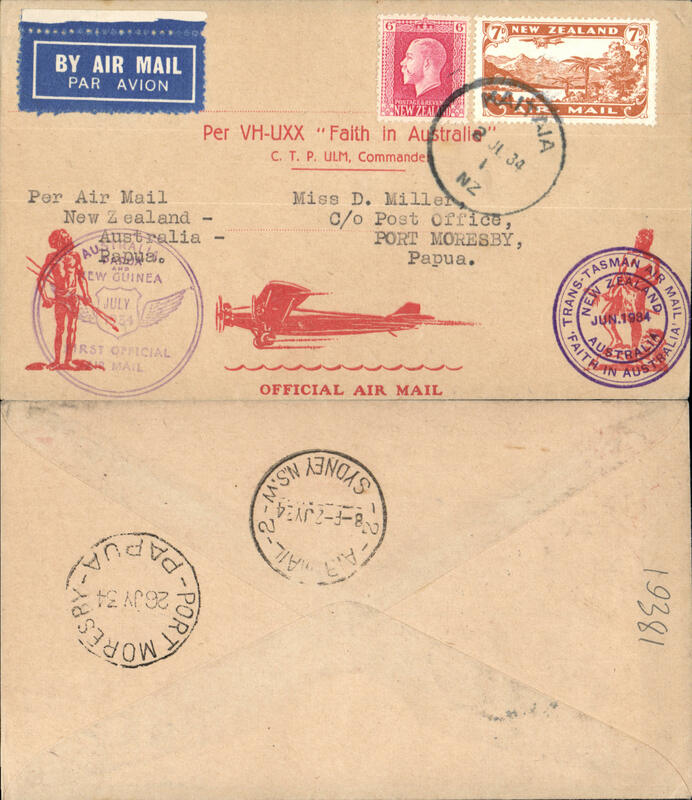 First Trans Tasman airmail flight, plain cover, franked 7d air, fine strike circular violet F/F cachet, airmail etiquette, flown 'Faith In Australia by pilot GU Alan. 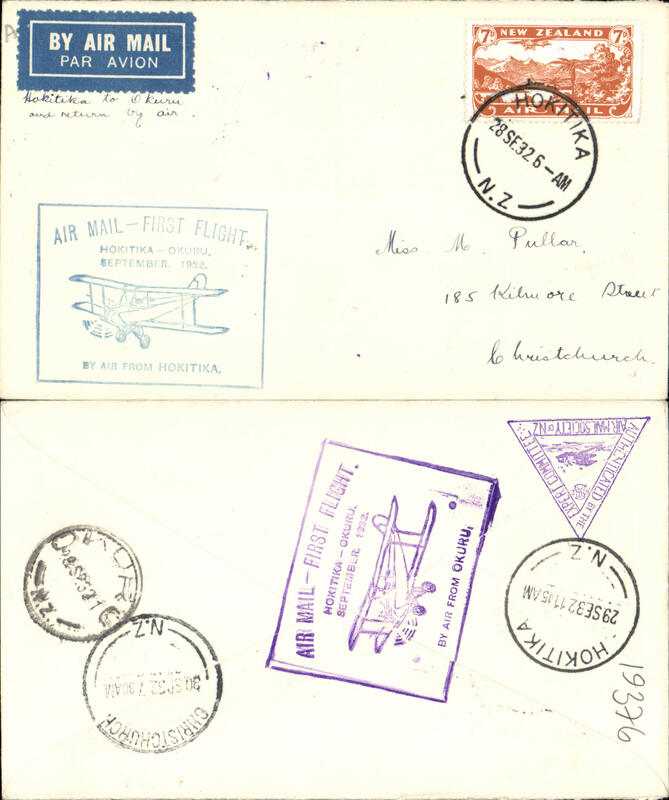 Kaitaia-Sydney Papua-New Guinea & Return Flight to Australia, plain cover, franked 7d air canc Auckland 25/6 cds, b/s Sydney 2/7 and Kaitaia 2/7 arrival ds onfront, violet circular 'Jun 1934' flight cachet, blue/white etiquette. 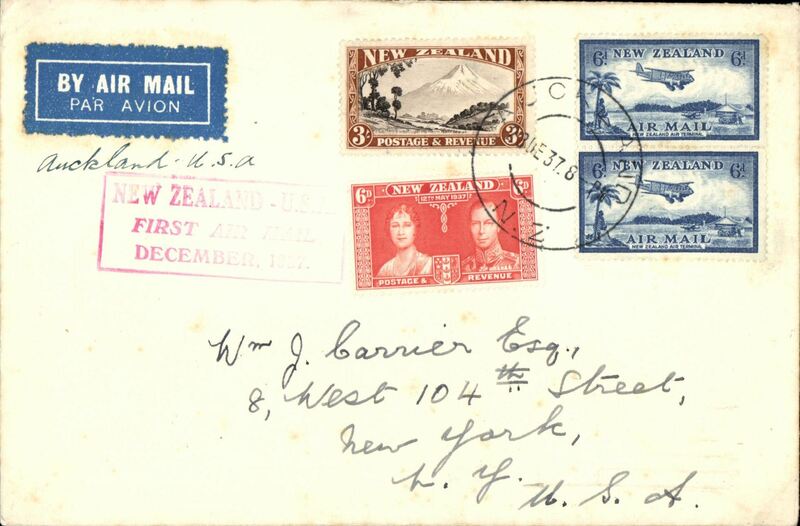 First acceptance of mail for USA, bs New York 28/8 for carriage on the Charles Ulm, Faith in Australia flight, Trans Tasman and Pacific flight, NZ dispatch, registered (label) souvenir cover with inset of Ulm, with mixed franking, NZ 7d, 4d, 3d airs canc Auckland 25/6, and PNG 6d air opt x2 canc Port Moresby 26/7, also Kaitaia 2/7 on front and Sydney 2/7 verso, and purple 'Trans Tasman Air Mail/Faith in Australia' on front, and 'First Official Airmail/Australia,Papua and New Guinea' and 'First Official Airmail/New Guinea Australia' cachets verso. 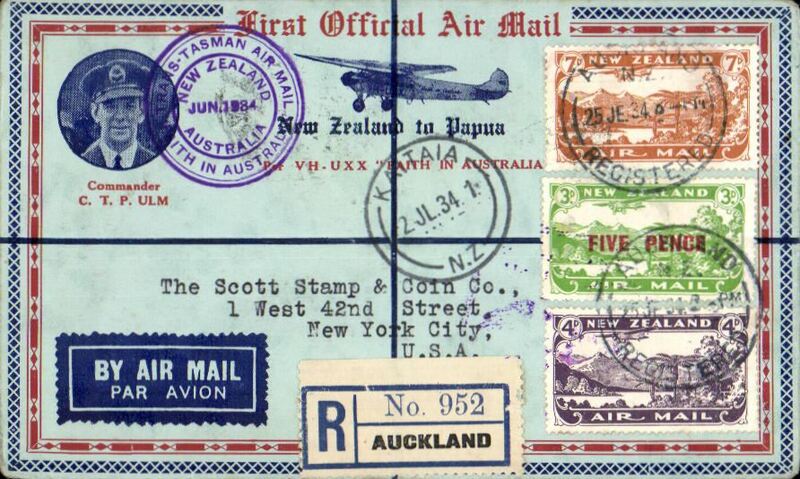 This flight was the first NZ airmail service to North Queensland, Papua and New Guinea. Carried onward by sea from Sydney to New York. 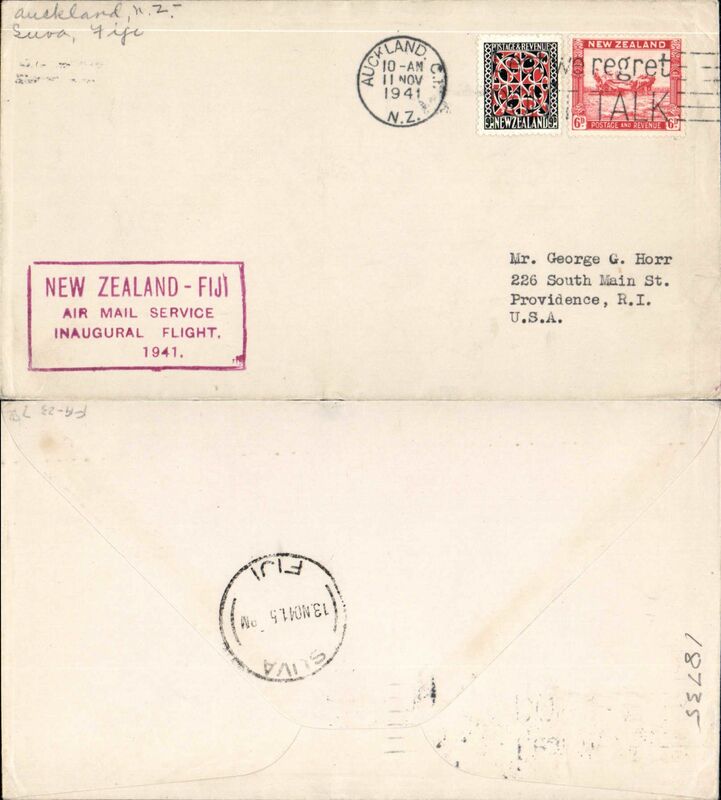 Trans Tasman Flight, Kaitaia-Sydney 2/7 and on to Lae, NG 27/7, franked 7d & 5/3d opt + 1d ordinary canc Kaitaia cds, violet NZ-Australia flight and Australia-PNG cachets, red/buff aborigine cover, signed by the pilot GU Alan. 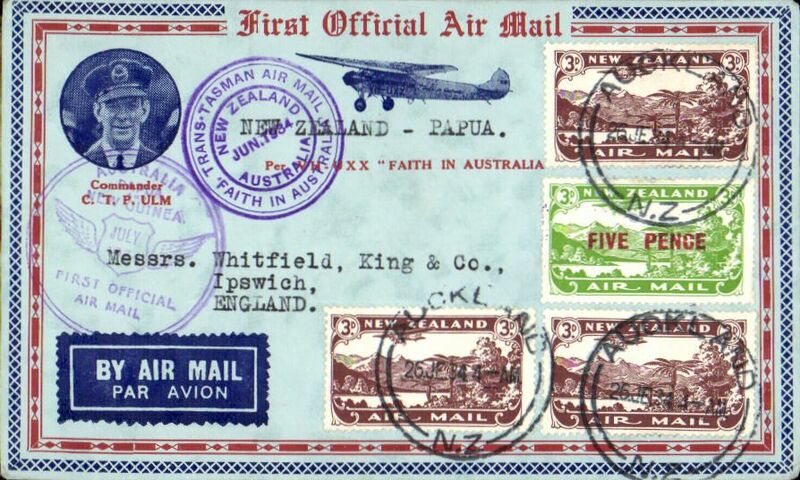 Kaitaia-Sydney Papua-New Guinea & Return Flight to Australia, red/buff 'Faith in Australia' cover franked 7d,3d, 5d opt airs, canc Auckland 25/6 cds,b/s Sydney 2/7 and Lae 27/7, and Kaitaia 2/7 arrival ds on front, violet circular 'Jun 1934 Trans Tasman' flight cachet on front and violet 'Australia-Papua/ New Guinea Jul 1934' and violet hexagonal 'Papua-Australia Jul 1934' cachets verso, blue/white etiquette. Kaitaia-Sydney Return Trans Tasman Flight, Kaitaia-Sydney 2/7 and on to Lae, NG 27/7, franked SG 548 x2, 550(cat £39.00 used) canc Auckland cds, violet NZ-Australia flight, Australia-PNG and Australia-NG cachets, red/buff aboriginee cover, pilot GU Alan. Kaitaia-Sydney Return Trans Tasman Flight, Kaitaia-Sydney 2/7 and on to Port Moresby 26/7, franked SG 7d air + 6d ordinary canc Kaitaia 2/7 cds, violet NZ-Australia flight and Australia-PNG cachets, red/buff aboriginee cover, pilot GU Alan. 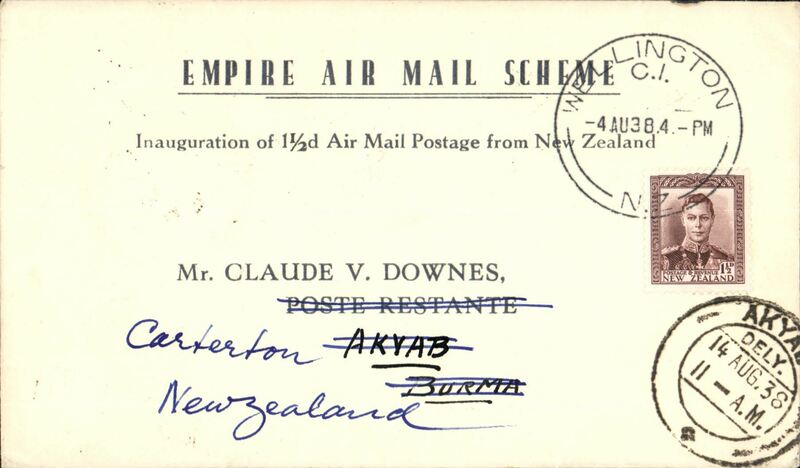 First New Zealand acceptance for the inaugural flight on the Brisbane-Singapore section of the Empire route from Australia-England, Auckland-London, no arrival ds, plain cover, franked 4d air, 2x 7d air, canc Auckland cds, blue/white etiquette. 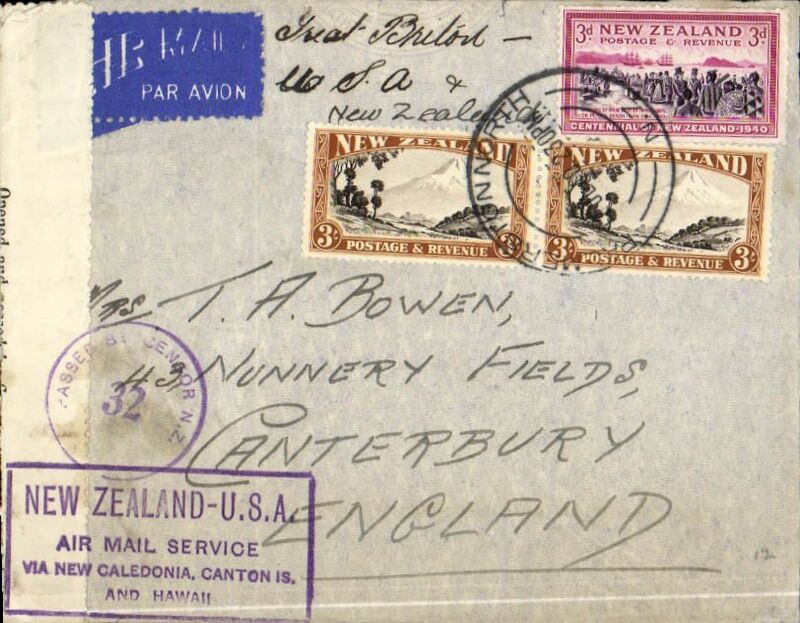 NZ acceptances closed at Auckland on 30/11, then sea by SS Monterey to Sydney, rail to Cootamundra, Butler Air Transport to Charleville, where mail collected by plane for Australia-England service, Qantas/ITCA/ Imperial Airways. 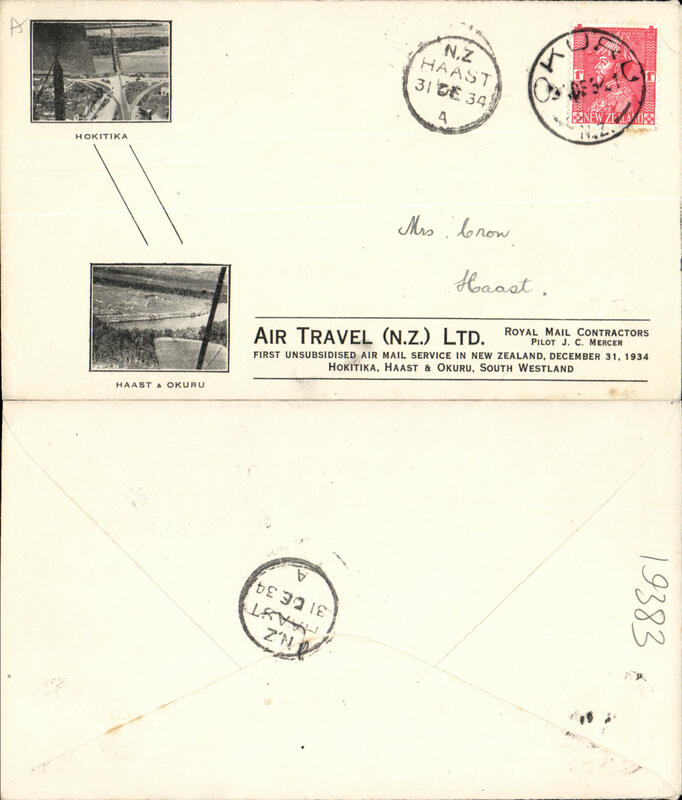 F/F Okuru to Haast, arrival ds on front, souvenir cover with inset of picture of Hokitika and Haast/Okuru, franked 1d, Air Travel Ltd.
F/F Hokitika to Okuru, arrival ds on front, souvenir cover with inset of picture of pilot standing by plane, franked 1d, Air Travel Ltd.
F/F Hokitika to Okuru, arrival ds on front, souvenir cover with inset of picture of pilot standing by plane, franked 1d, Air Travel Ltd. Signed by the pilot J.C. Mercer. Few faint tone spots top edge. 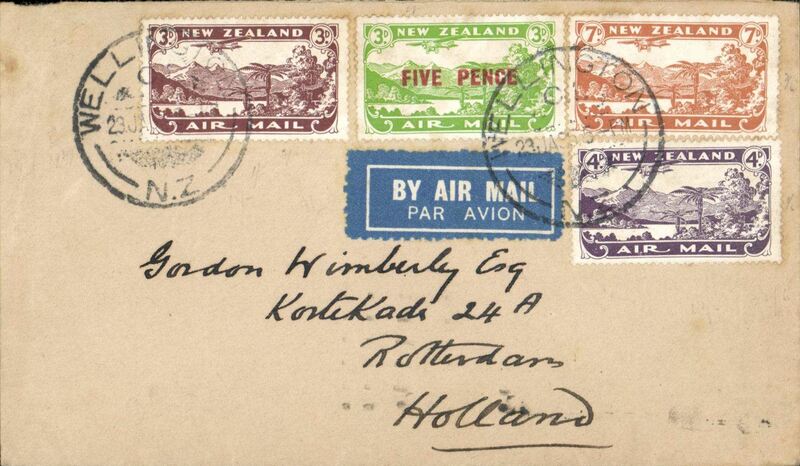 New Zealand acceptance for Holland, 11/2 via Paris 11/2, Wellington to Rotterdam carried on flight IW 309 Imperial Airways Far Eastern service, buff airmail etiquettte cover franked 1/5d, canc Wellington cds. 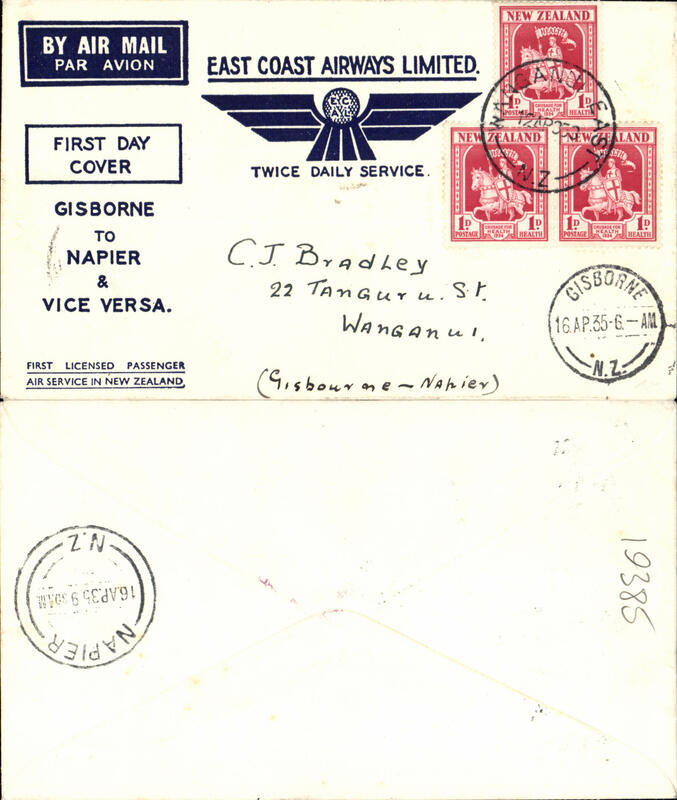 East Coast AW, F/F Gisborne to Napier, b/s 16/4, blue/cream souvenir cover with company logo, franked 3d. 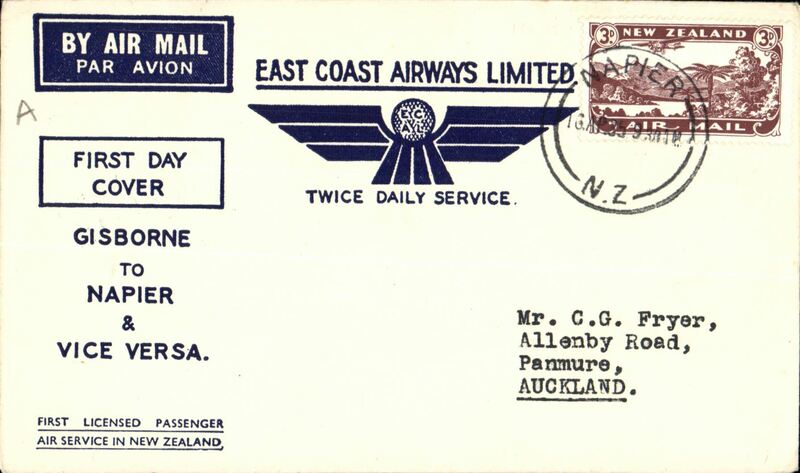 East Coast AW, F/F Napier to Gisborne, b/s 16/4, blue/cream souvenir cover with company logo, franked 3d. 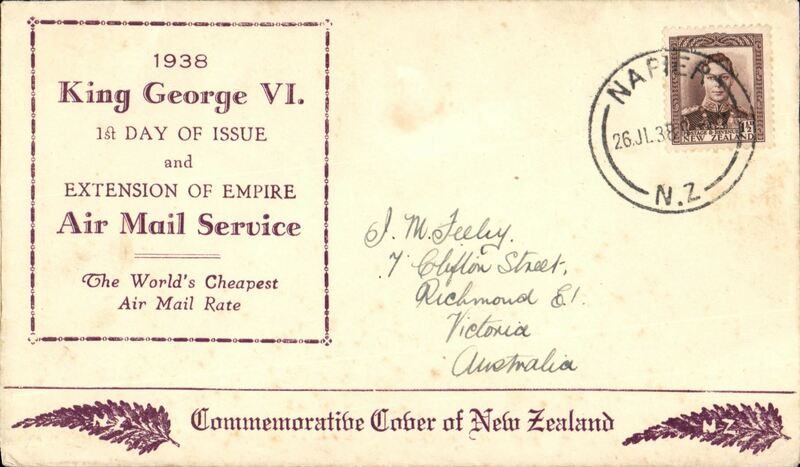 East Coast AW, F/F Gisborne to Napier, b/s 16/4, orange/mauve/cream 'Maori' souvenir cover, franked 3d. 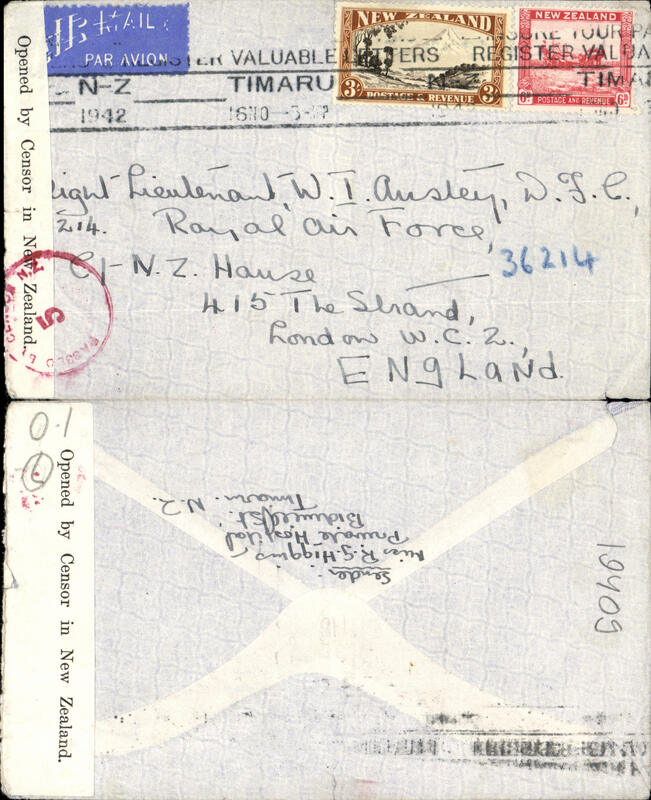 Interrupted Jubilee Air Mail flight, intended return flight New Zealand-(Australia)-Engand, no arrival ds, printed blue/white souvenir cover, franked 2/1d, canc Auckland cds. 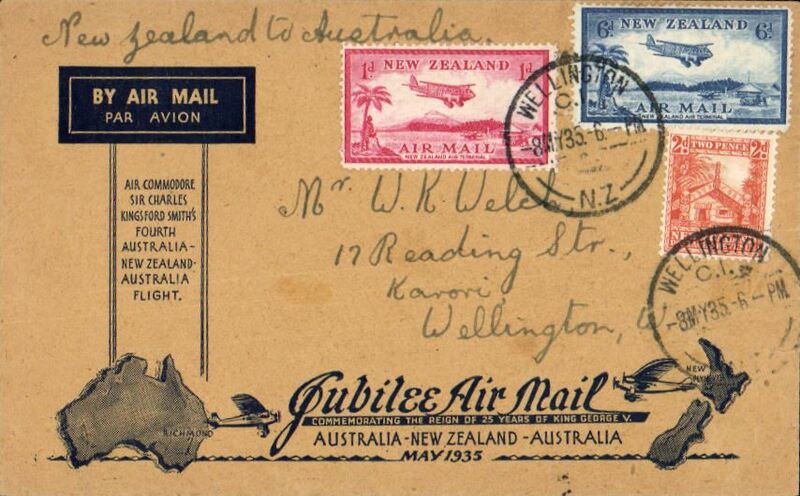 Plane failed to reach NZ on outward flight, so all NZ mail went to Australia. Unofficial unsubsidised flight, Hokitika to South Westland, bs Hass 13/5, cream/brown 'Ski-ing Mt. 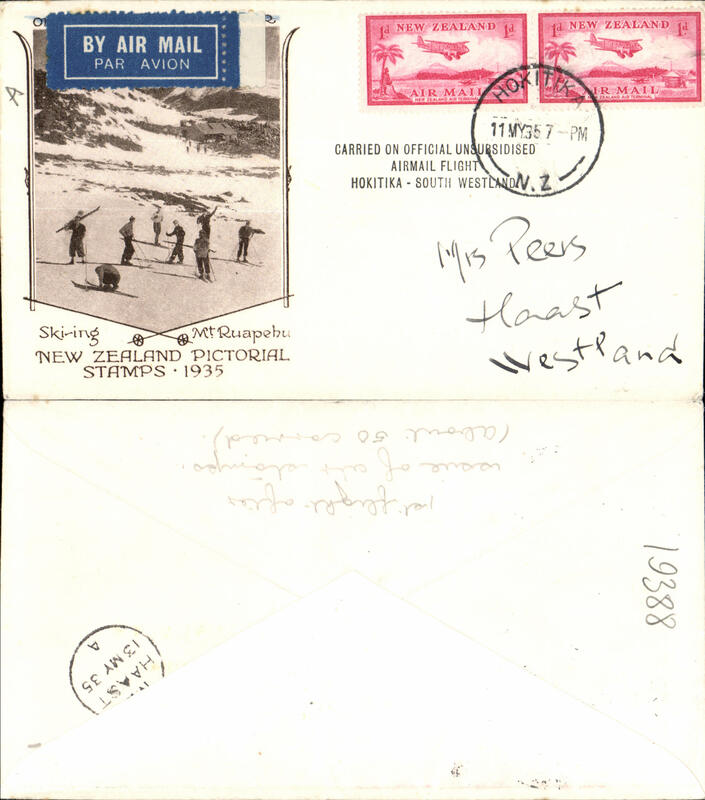 Ruapehu' souvenir cover, franked 2x 1d air. 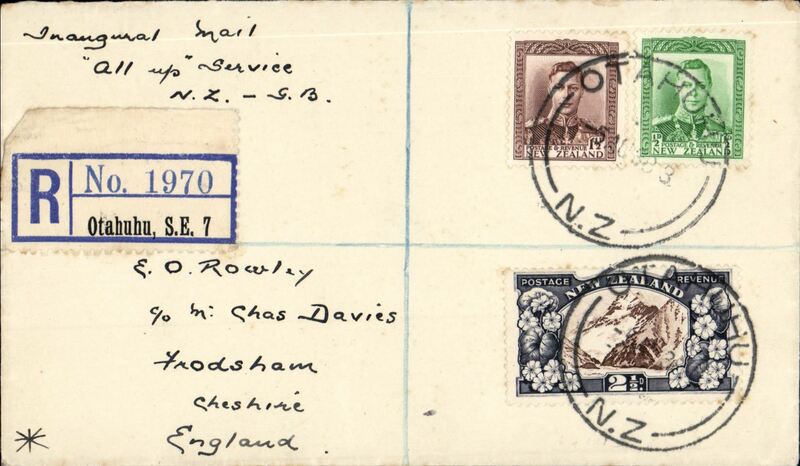 Abandoned Jubilee airmail, return New Zealand to Australia, bs Sydney 20/5, blue/buff souvenir cover franked 7d air + 2d, canc Wellington cds. 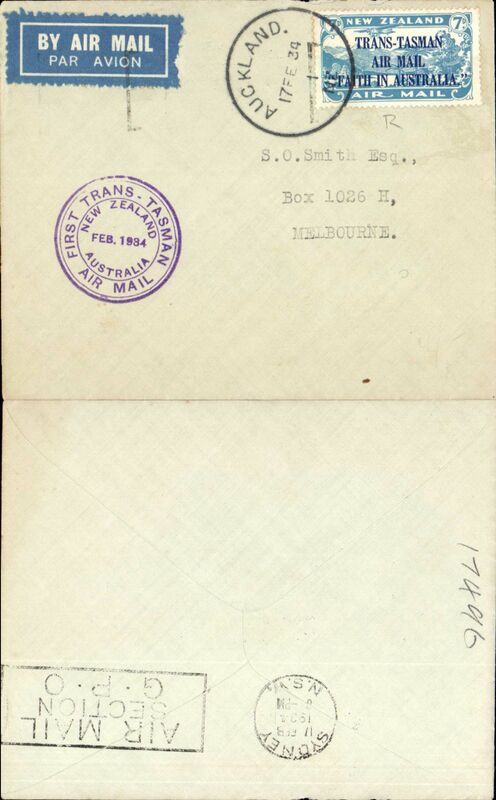 Mail for the return flight was sent by ship to Sydney. 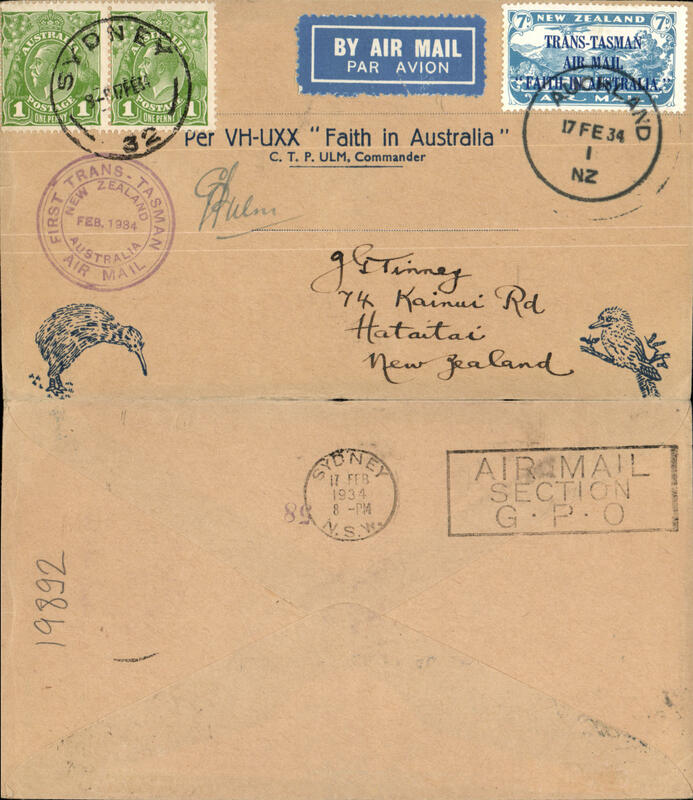 Abandoned Jubilee airmail, return New Zealand to Australia, bs Sydney 20/5, blue/buff souvenir cover franked 7d air + 2d, canc Wellington cds and Australia 2d canc Sydney 20/5. Mail for the return flight was sent by ship to Sydney.mounted on album page with explanatory text and picture of the damaged propeller. 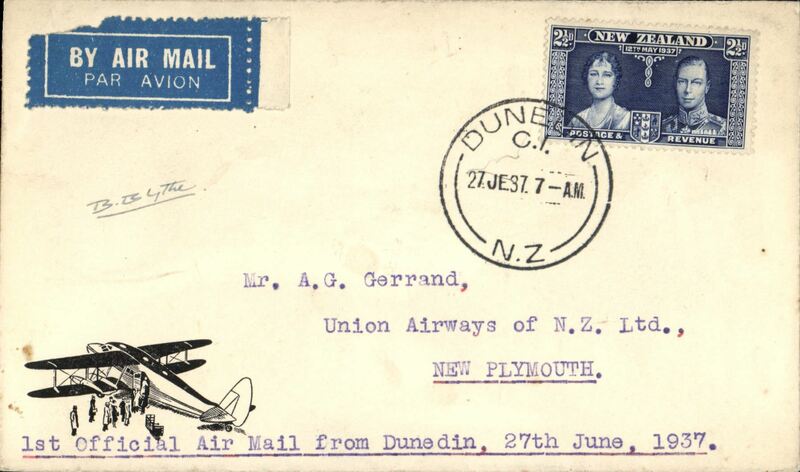 Union Airways, F/F Dunedin to Palmerston North, bs 16/3, cover with Union Airways logo on the flap, franked 2x 1d air, signed by the pilot Commander AG Gerrand..
Union Airways, F/F Palmerston North to Dunedin, bs 16/3, cover with Union Airways logo on the flap, franked 2x 1d air, signed by both pilots..
First acceptance of airmail for Morocco, bs Ville-Nouvelle 17/4 for carriage on the F/F Dunedin to Palmerston North, bs 16/3, brown/cream souvenir cover depicting DH flying over Maori totem, franked 3d air + 1 1/2d. 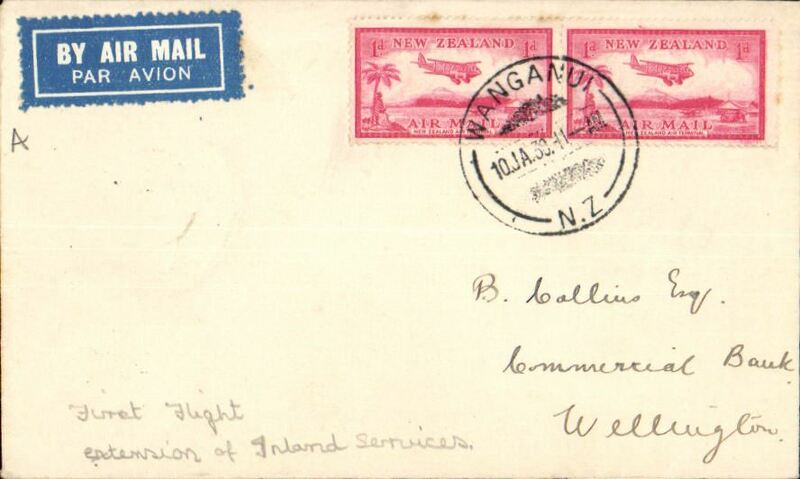 Uncommon destination..
Cook Strait Airways, F/F Wellington to Blenheim, bs 16/3, plain cover franked 2d, underpaid, postage due 2d tied by black PD handstamp. 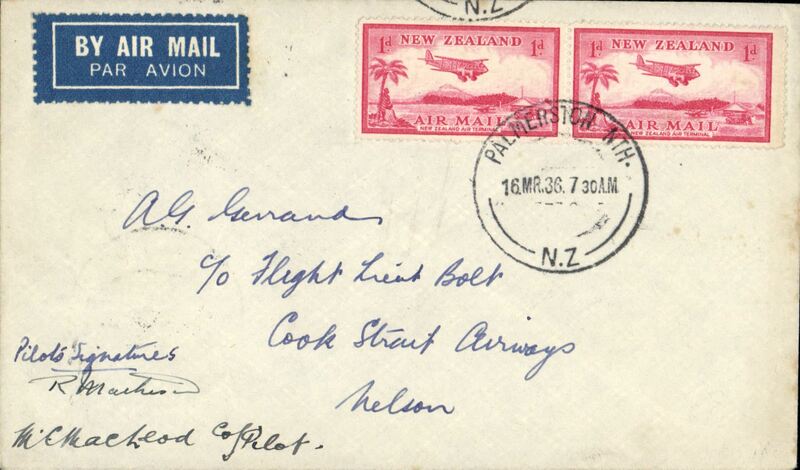 Union AW/Cook Strait Aw, F/F Nelson to Blenheim, bs 16/3, plain cover franked 2d, flight cachet. 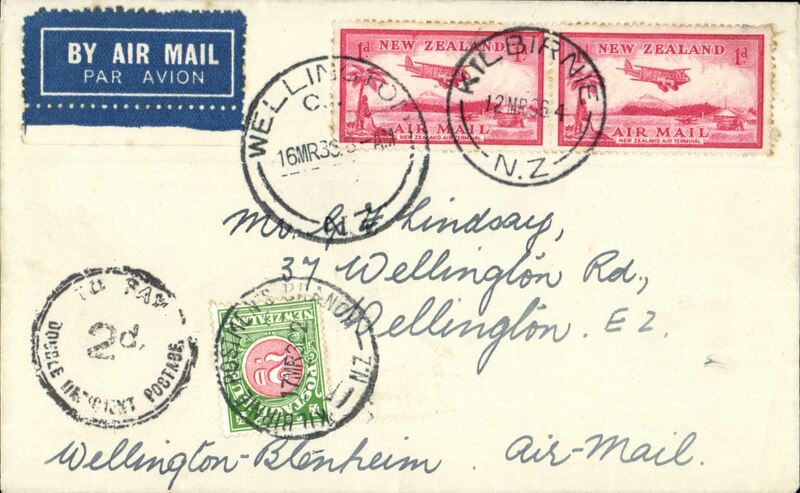 Union Airways of New Zealand F/F Wellington-Dunedin, bs 16/3, plain cover franked 2x 1d air. 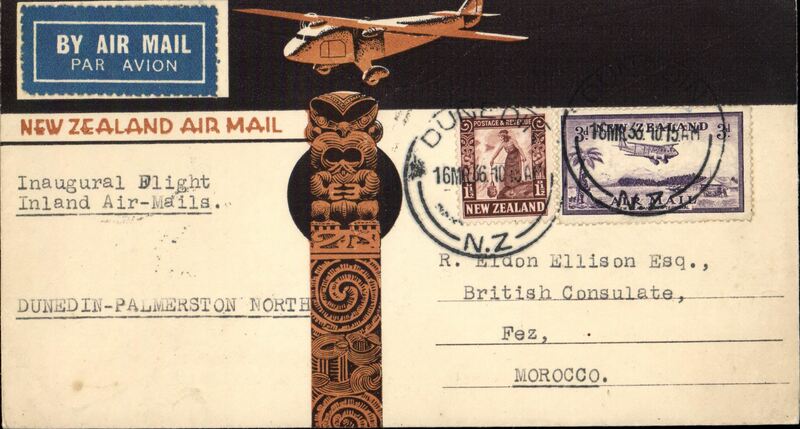 Union Airways of New Zealand F/F Christchurch-Wellington, bs16/3, Blenheim, bs 16/3, attractive cream/orange souvenir cover depicting DH flying over Maori totem franked 2 x 1d airs. 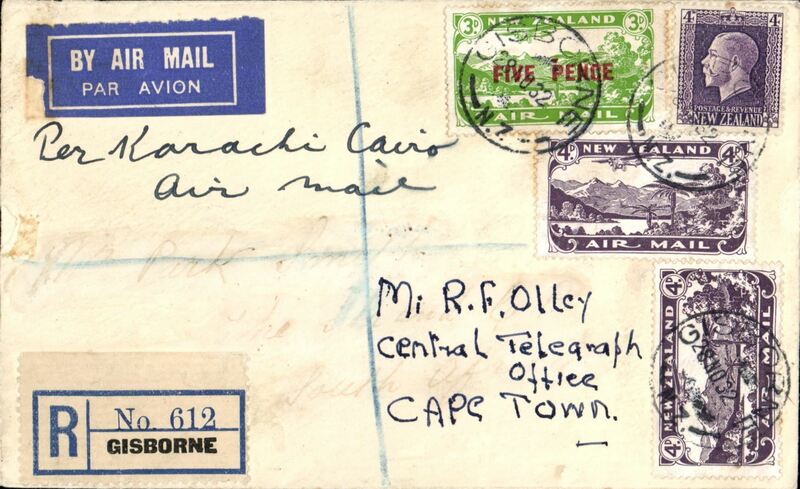 Union Airways of New Zealand F/F Blenheim to Wellington, bs 16/3, plain cover franked 1d air and 1d ordinary, large violet two line 'First Inter Island/Air Mail' cachet. 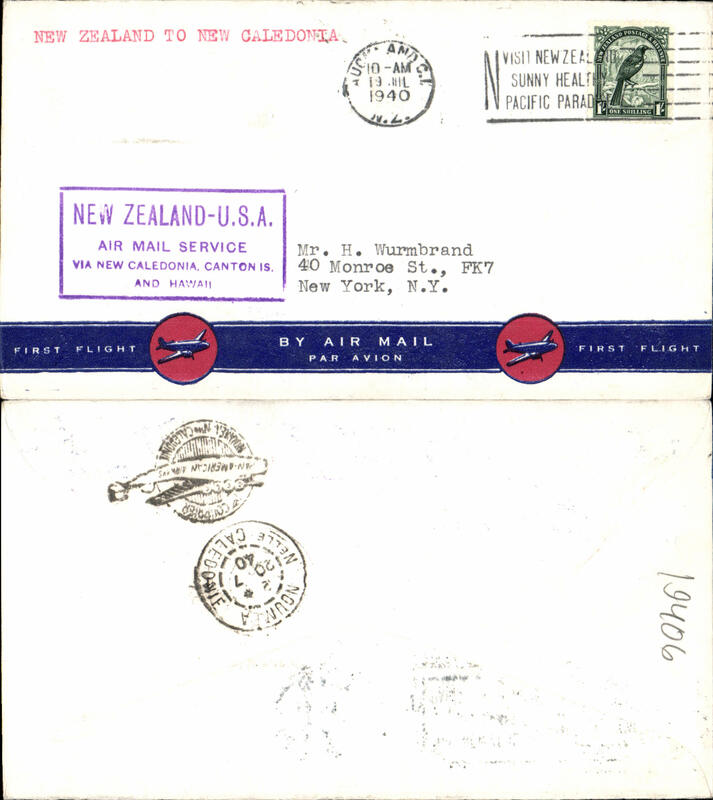 Union Airways of New Zealand F/F Christchurch-Blenheim, bs 16/3, and on to Picton 17/3, plain airmail etiquette cover franked 2x 1d air. 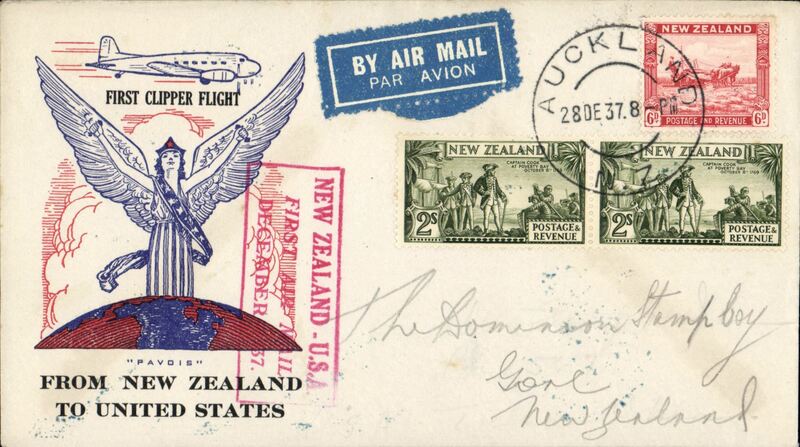 Union Airways, F/F Palmerston North to Dunedin, bs 16/3, franked 2x 1d air. F/F Palmerston North to Dunedin, bs 16/3, Union AW. 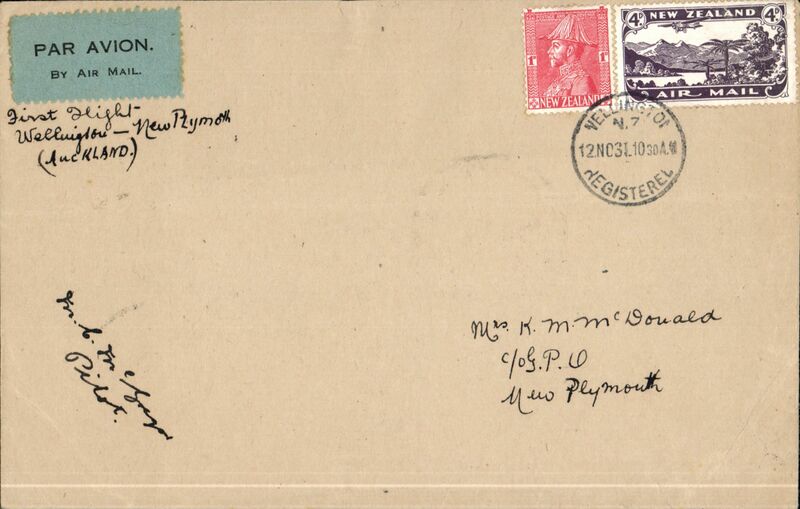 Airmail cover New Zealand to England, New Plymouth to Halifax, bs, plain etquette cover franked 1/6c. 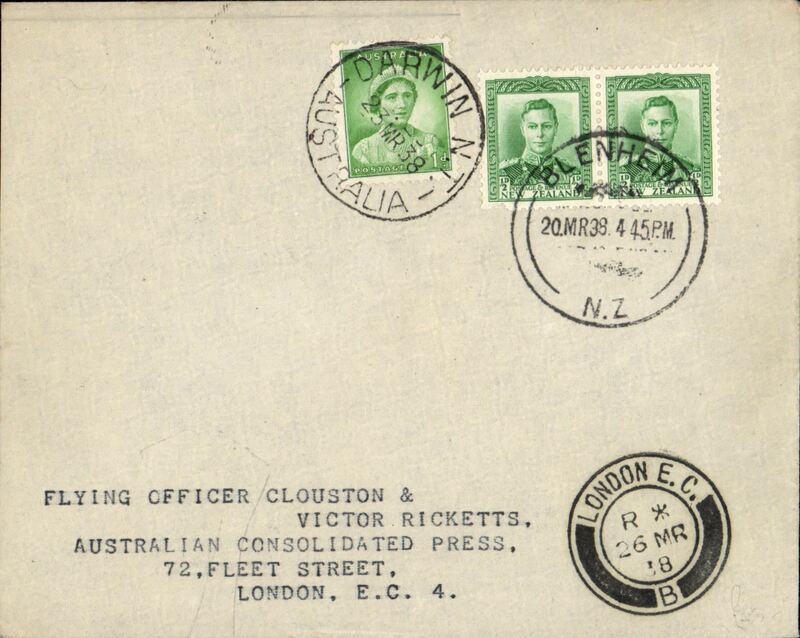 fine strike uncommon "Per Australian-London Air Mail" hand stamp. 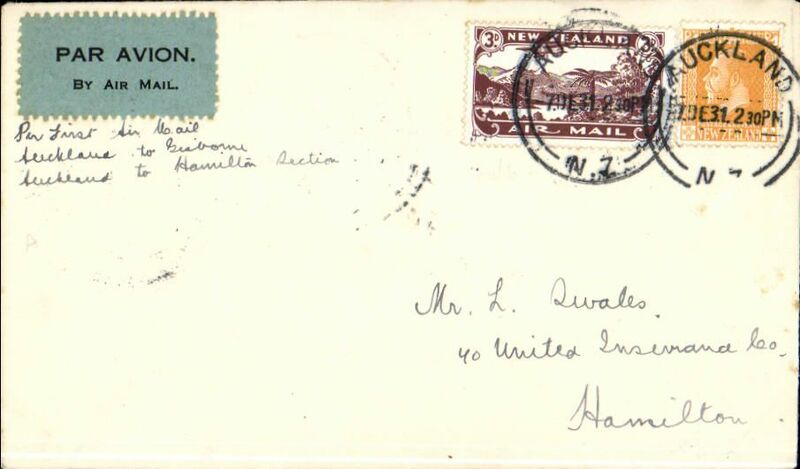 Union AW/Cook Strait Aw, first Sunday service, Palmerston North to Wellington, bs 22/3, green/cream souvenir cover franked 2x 1d air. 56 flown. 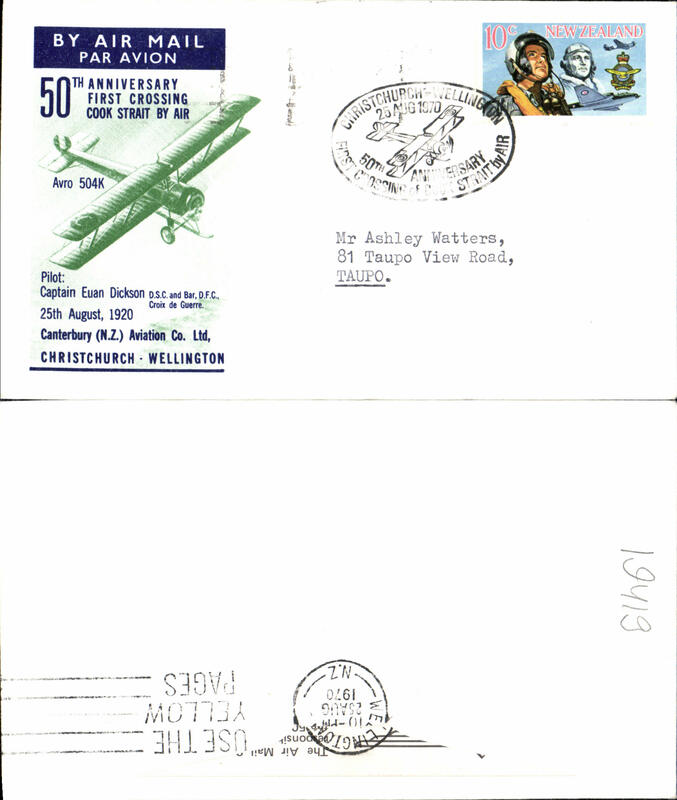 FDC Wellington Industries set of 5 plus additional same set 4d on plain cover canc Auckland 1 Oct 36 cds, New Zealand acceptance for flight IW486 Imperial Arways Brisbane-London service. Cook Strait AW. 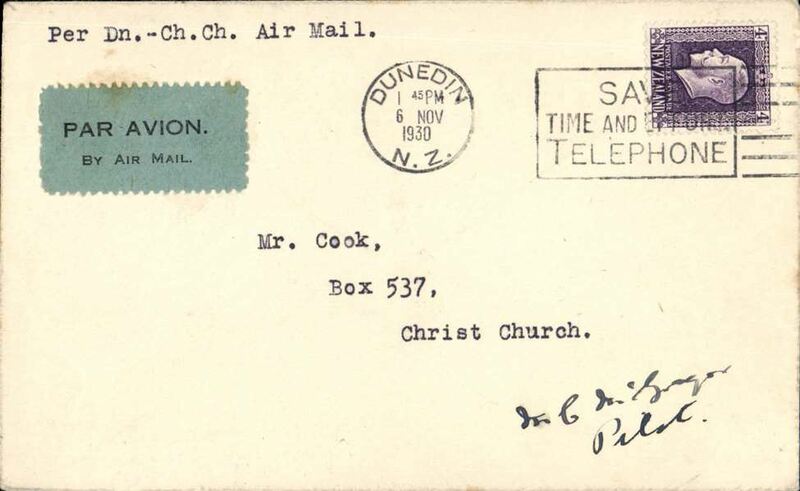 F/F Wellington to Greymouth, bs 24/2, black/white souvenir cover, franked 2 1/2d, fine blue/dark blue 'Use the Air Mail' vignette verso. Only 16 flown. Mounted on album leaf with explanatory text. See scan. Cook Strait AW. 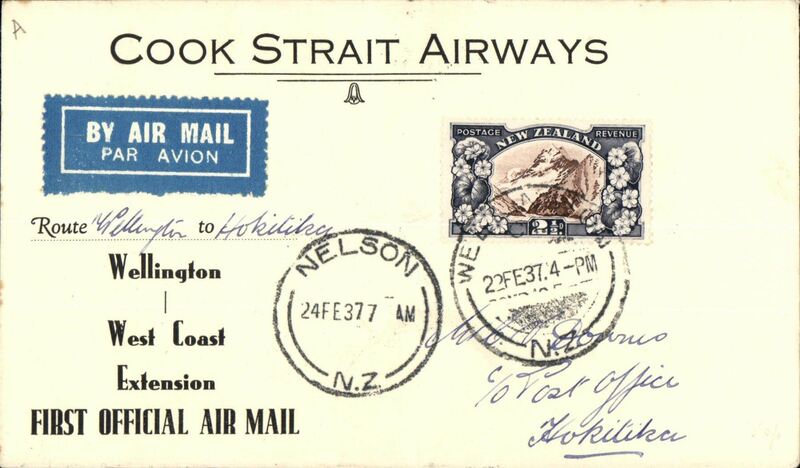 F/F Wellington to Hokitika, bs 24/2, via Nelson 23/2, black/white souvenir cover, franked 2 1/2d, fine blue/dark blue 'Use the Air Mail' vignette verso. Only 16 flown. 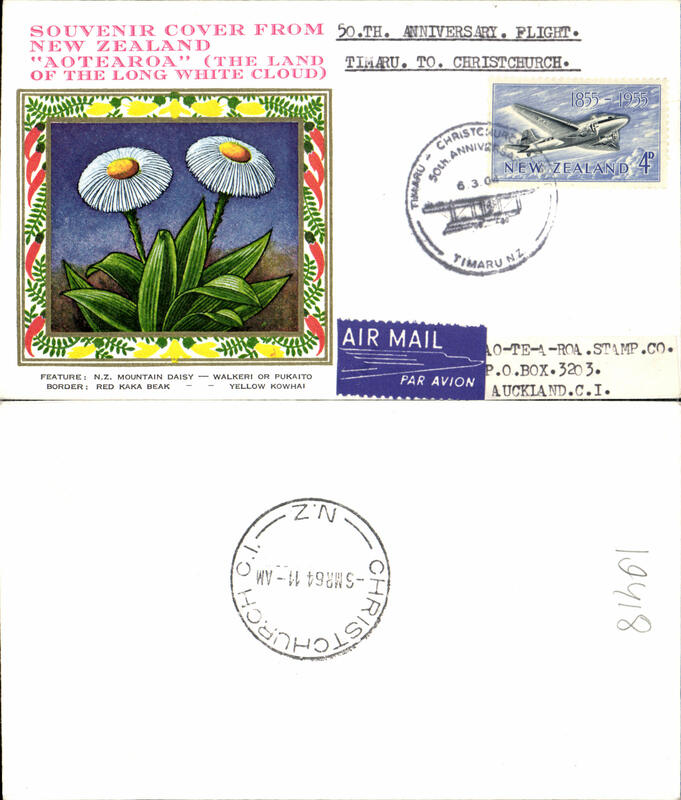 Souvenir FDC cover franked Coronation 1d, 2 1/2d, flown Christchurch to Dunedin, 14/5 arrival ds on front. 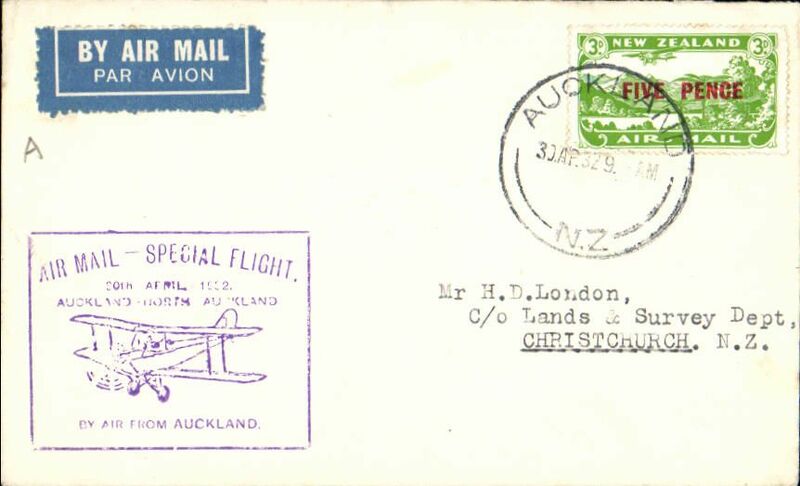 F/F Lockheed Electra service, Auckland to Wellington, bs 27/6, green/buff souvenir cover franked 2d canc Auckland cds..
Union Airways, F/F Dunedin to New Plymouth, bs 27/6, cover with Union Airways of New Zealand logo on the flap and picture of DH 86 on front lower lh corner, signed by Chief Pilot BA Blythe. 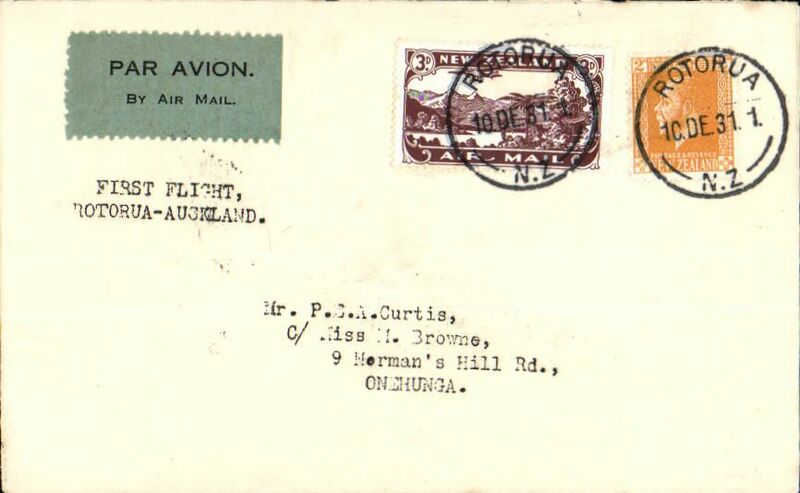 Union Airways, F/F Dunedin to Gisborne, bs 31/10, printed buff/green souvenir cover 'First Flight/Sunday Airmail Service' and 'New Zealand Official Air Mail' with drawing in green of DH 86, franked 2 1/2d. Capt. 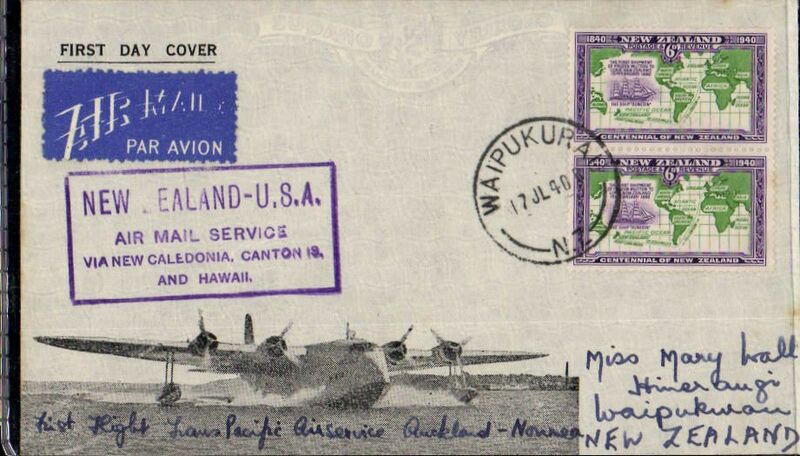 Musik's "Samoan Clipper", Pan American South Pacific Survey flight #2, Auckland to Honolulu, bs 3/1/38, franked 1/6d, scarce purple boxed "New Zealand-USA/First Air Mail/December 1937", winged red/white/blue PAA airmail etiquette, green/black 'Trans-Pacific' label..
Dunedin to Denver, USA, bs 7/1/38, carried on Capt. 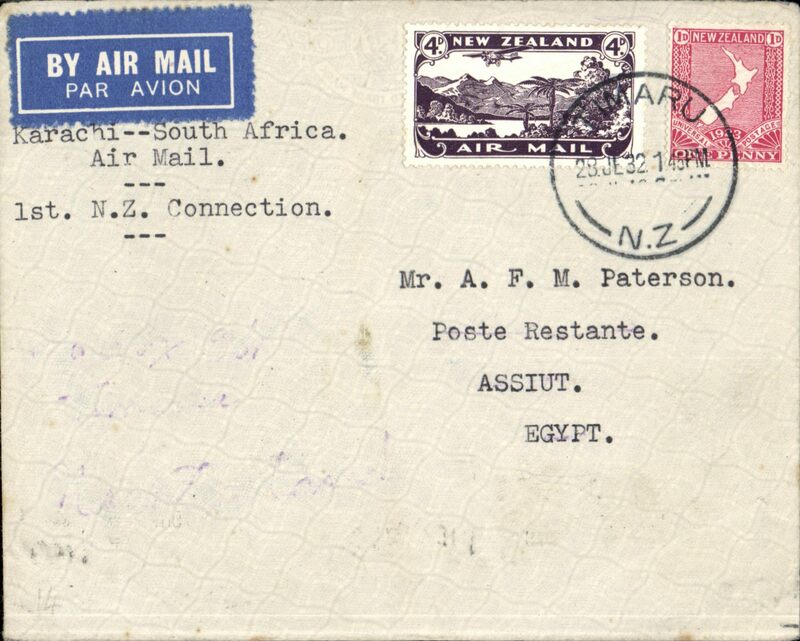 Musik's "Samoan Clipper", Pan American South Pacific Survey flight #2, Auckland to San Francisco, bs 6/1/38, franked 4/10d, red boxed "New Zealand-USA/First Air Mail/December 1937", par avion etiquette, plain registered (label) cover. Attractive item. Capt. 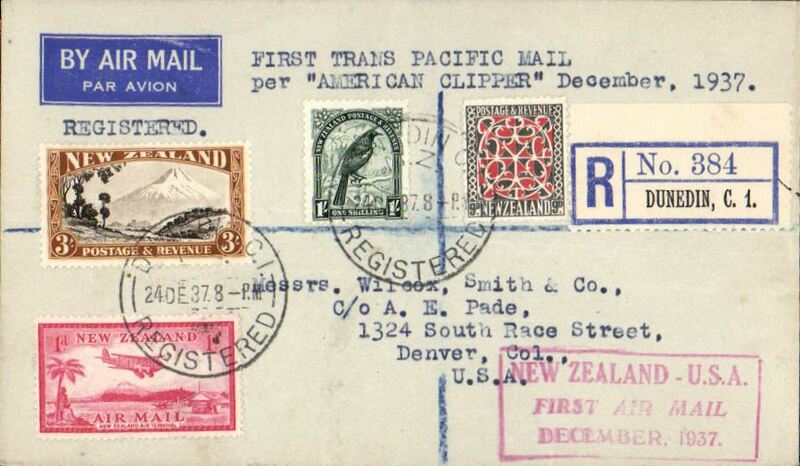 Musik, Pan Am 'Samoa Clipper', Trans-Pacific Survey Flight #2, New Zealand to Honolulu, bs 3/1/38, PC franked 1/6d, canc Auckland cds, red framed fight cachet, black/white "Tramns-Pacific Air Mail/Per Samoan Clipper" vignette. 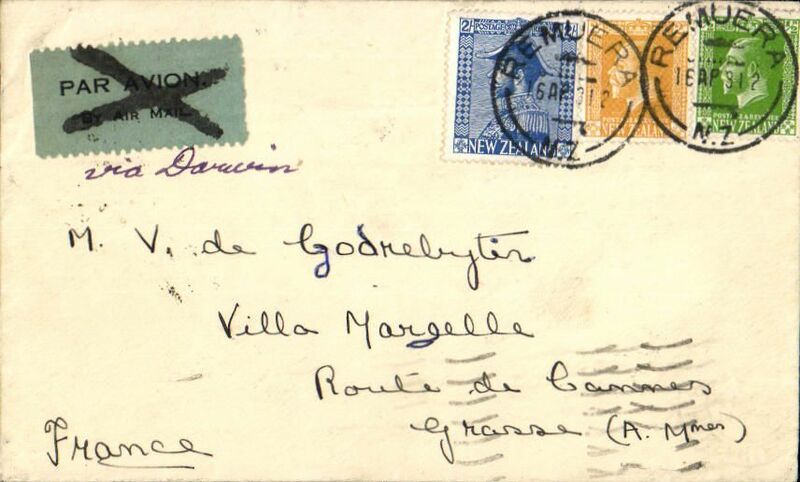 Flown post cards are scarce. Capt. 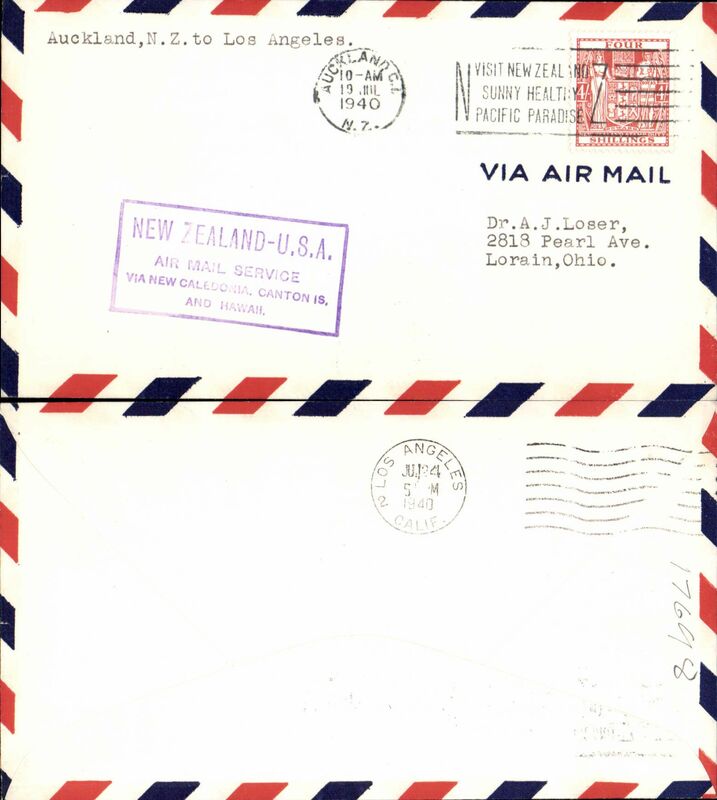 Musik "Samoan Clipper", Auckland to Honolulu, bs 3/1/38, leg of Auckland-San Francisco survey flight, franked 2/-, 1/-, 6d, blue boxed flight cachet, par avion etiquette, printed red/white/blue "Via Samoa Clipper" souvenir cover, Pan Am. A few tiny scuffs along bottom edge. 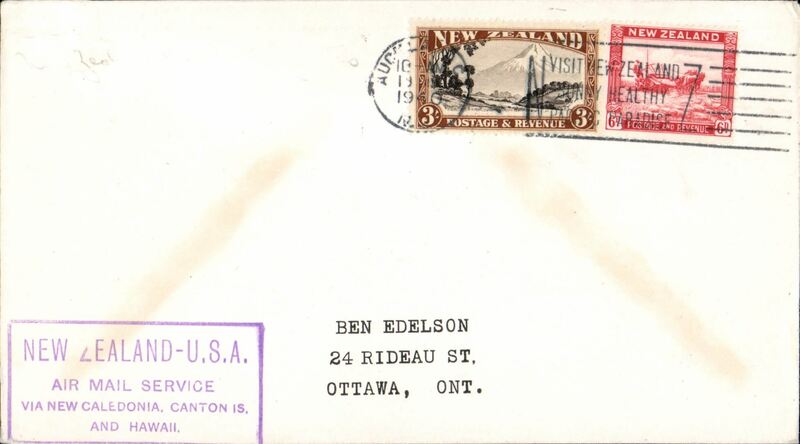 Auckland to Winnipeg, Canada, bs 8/1/38, carried on Capt. 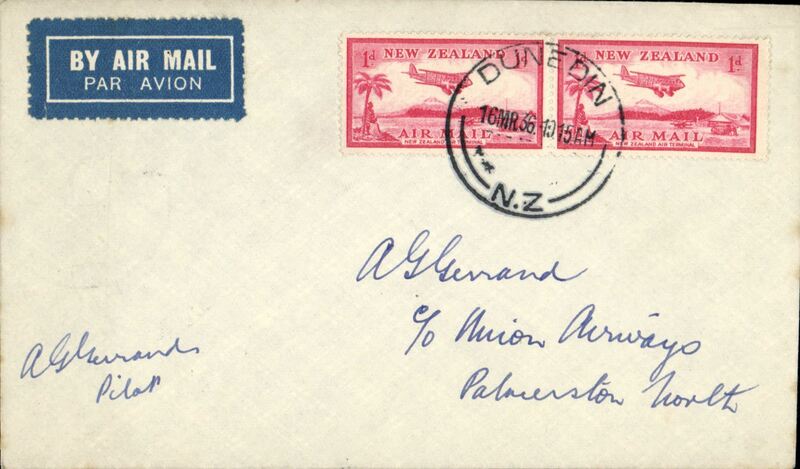 Musik's "Samoan Clipper", Pan American South Pacific Survey flight #2, Auckland to San Francisco, bs 6/1/38, franked 2x 2/-, 6d, 3d, red boxed "New Zealand-USA/First Air Mail/December 1937", par avion etiquette, plain registered (label) cover. Capt. 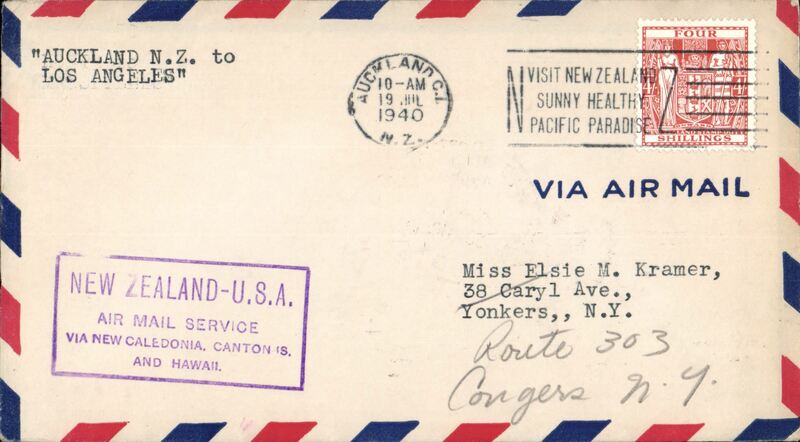 Musik's "Samoan Clipper", Pan American South Pacific Survey flight #2, Te Aroah, New Zealand to American Samoa, bs Pago Pago 1/1/38, ms "Per samoan Clipper", franked 1/1 1/2d, canc Te Aroah cds, red boxed "New Zealand-USA/First Air Mail/December 1937", par avion etiquette, plain registered (label) cover. Capt. 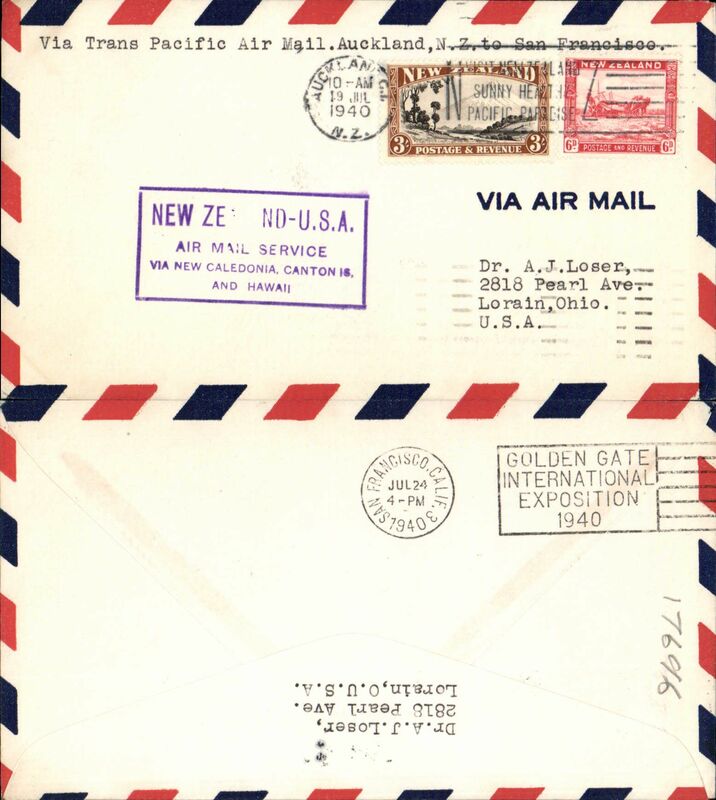 Musik's "Samoan Clipper", Pan American South Pacific Survey flight #2, Auckland to Honolulu, bs 3/1/38, franked 3/-, red boxed "New Zealand-USA/First Air Mail/December 1937", par avion etiquette, plain cover. Capt. 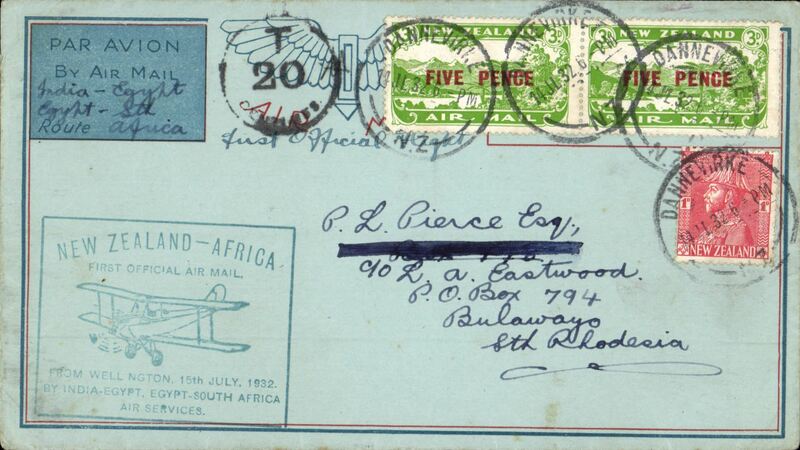 Musik "Samoan Clipper", Pan American South Pacific Survey flight #2, Auckland to Pago Pago, bs 1/1/38, franked 6d, scarcer black boxed "First Air Mail Flight/Pan American Airways/New Zealand/to/American Samoa", par avion etiquette, plain cover 10x21cm, signed by the pilot Captain Edwin C. Musik. One of the last covers to be autographed by Capt. Musik before his fatal crash. Capt. 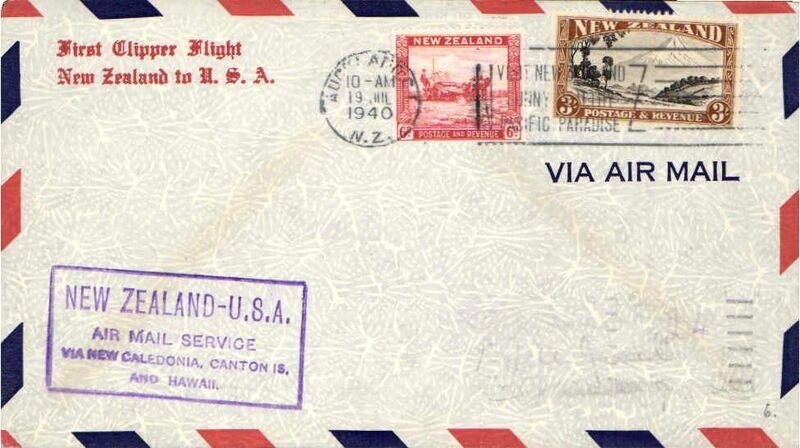 Musik "Samoan Clipper", Auckland to San Francisco, bs 6/1/38, franked 2/- x2 and 6d, red boxed flight cachet, par avion etiquette, attractive printed red/white/blue "South Seas First Flight/United States:New Zealand/Airmail Service/Hawaiian Islands: Fiji Islands" souvenir cover, Pan Am. Capt. 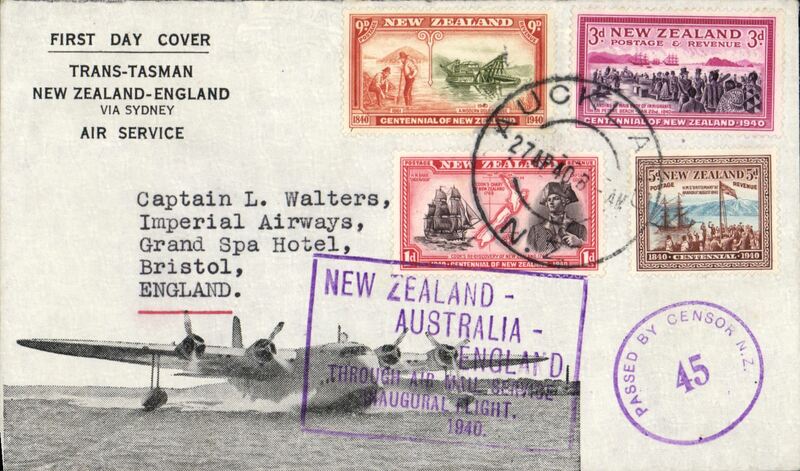 Musik, Pan Am 'Samoa Clipper', Trans-Pacific Survey Flight #2, New Zealand to Pago Pago, bs 1/1/38, souvenir cover, franked 7d, canc Wellington 28/12 cds, purple framed fight cachet, signed by the copilot W. Cuthbertson, £rd officer B. Sparks and the Navigator W. Alexander. Super item. Capt. 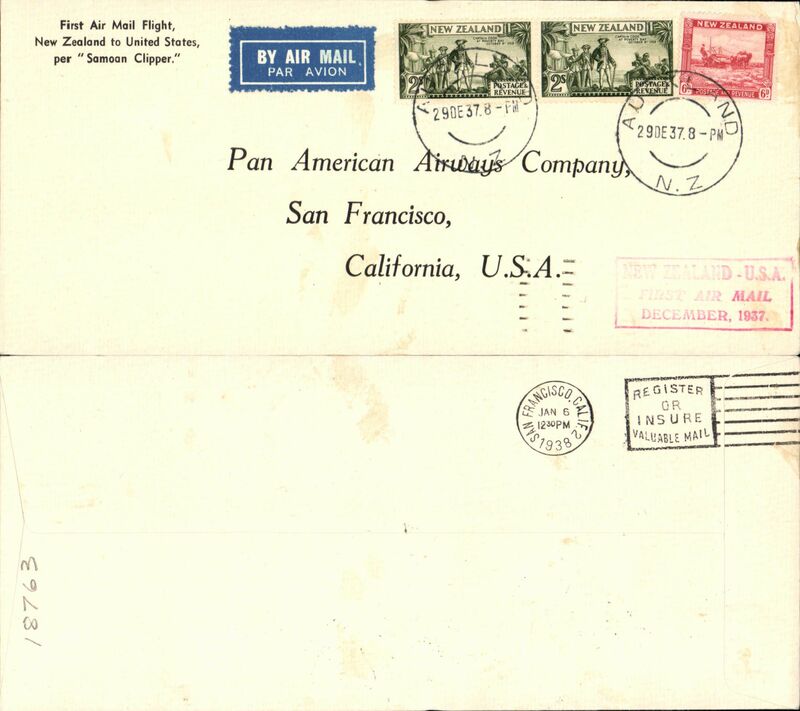 Musik "Samoan Clipper", Pan Am Auckland-San Francisco survey flight, bs 6/1/38, plain cover franked 4/6, red boxed cachet, par avion etiquette. Capt. 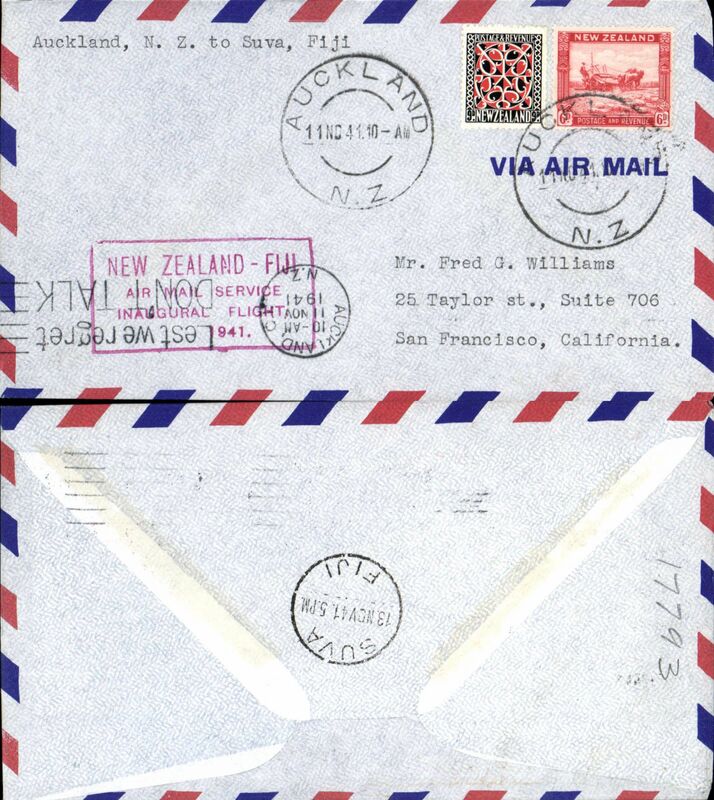 Musik "Samoan Clipper", Auckland to San Francisco, bs 6/1/38, franked 2/- x2 and 6d, red boxed flight cachet, par avion etiquette, cream/black souvenir cover printed "First Air Mail Flight/New Zealand to United Sates/per Samoan Clipper", Pan Am. Capt. 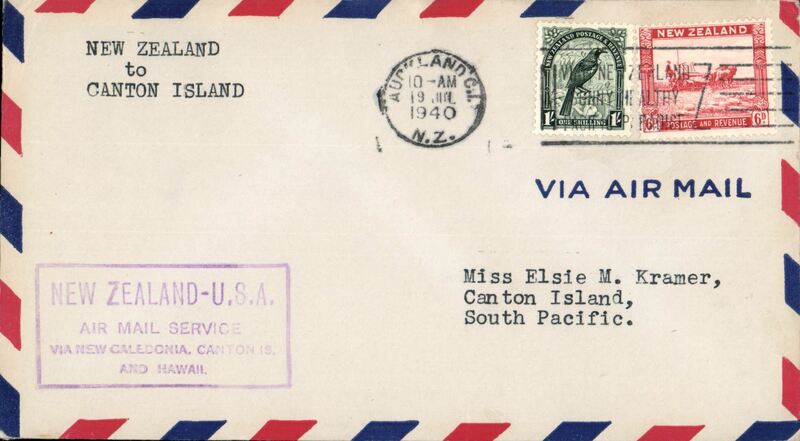 Musik "Samoan Clipper", Pan American South Pacific Survey flight #2, Auckland to San Francisco, bs 6/1/38, franked 2x 2/- and 6d, scarcer black boxed "First Air Mail Flight/Pan American Airways/New Zealand/to/United States", par avion etiquette, Pan American Airways Co/Honolulu/Hawaii corner cover, 10x21cm, signed by the pilot Captain Edwin C. Musik. One of the last covers to be autographed by Capt. Musik before his fatal crash. Capt. 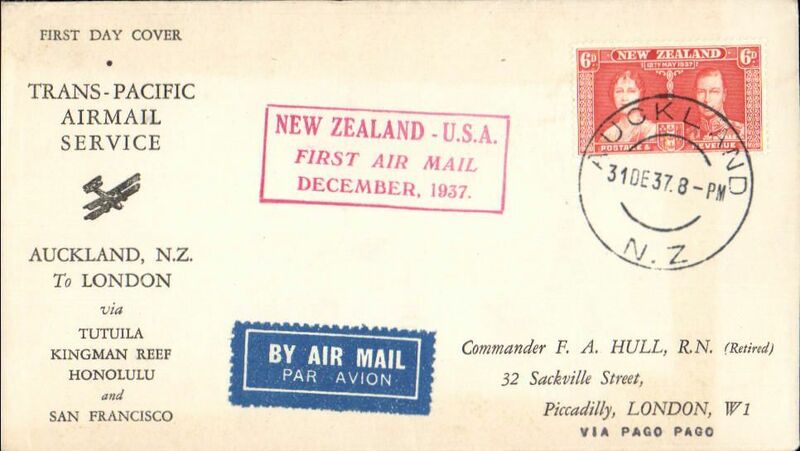 Musik "Samoan Clipper", Auckland-San Francisco survey flight, bs 6/1/38, franked 4/6, red boxed cachet, par avion etiquette, printed souvenir cover, Pan Am. Capt. 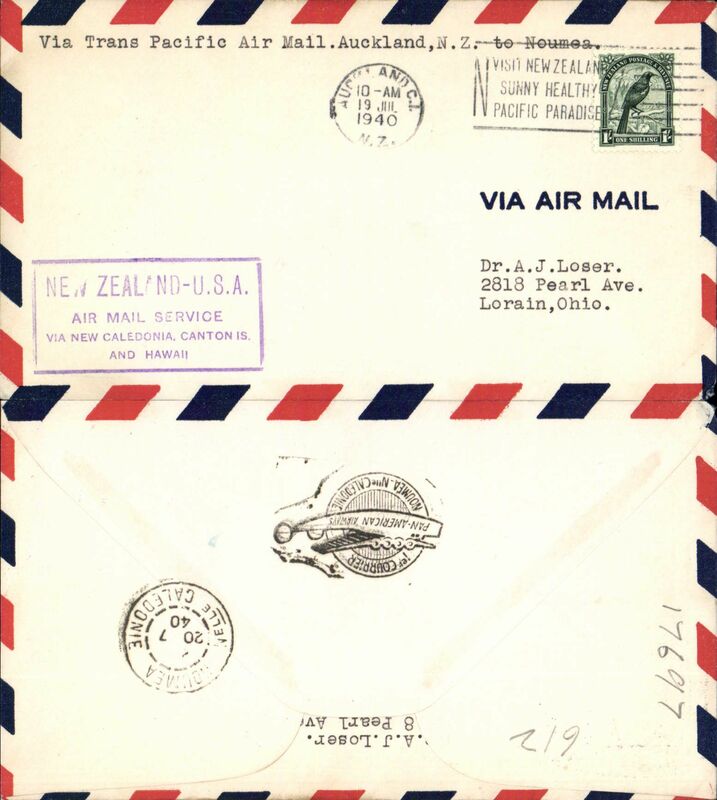 Musik "Samoan Clipper", Pan American South Pacific Survey flight #2, Auckland to San Francisco, bs 6/1/38, franked 2x 2/- and 6d, scarcer black boxed "First Air Mail Flight/Pan American Airways/New Zealand/to/United States", par avion etiquette, Pan American Airways Co/Honolulu/Hawaii corner cover, 10x21cm, signed by the pilot Captain Edwin C. Musik. One of the last covers to be autographed by Capt. Musik before his fatal crash. 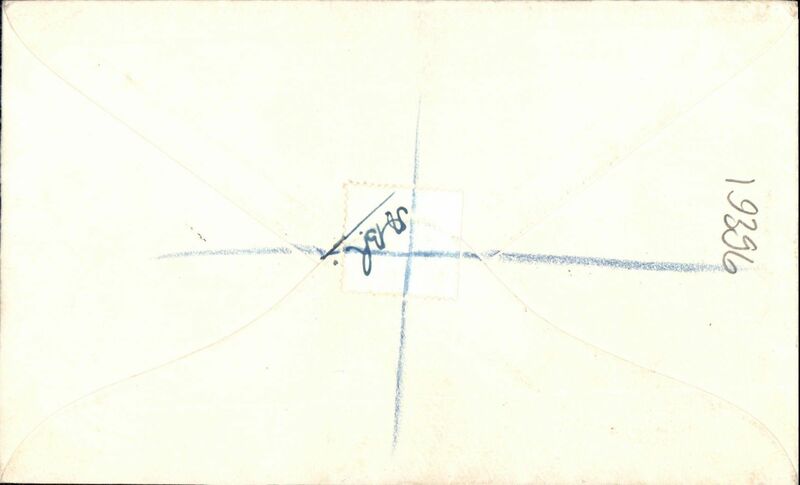 Bear note in pencil 'Schmidt - only 6 exist with cachet'. Capt. 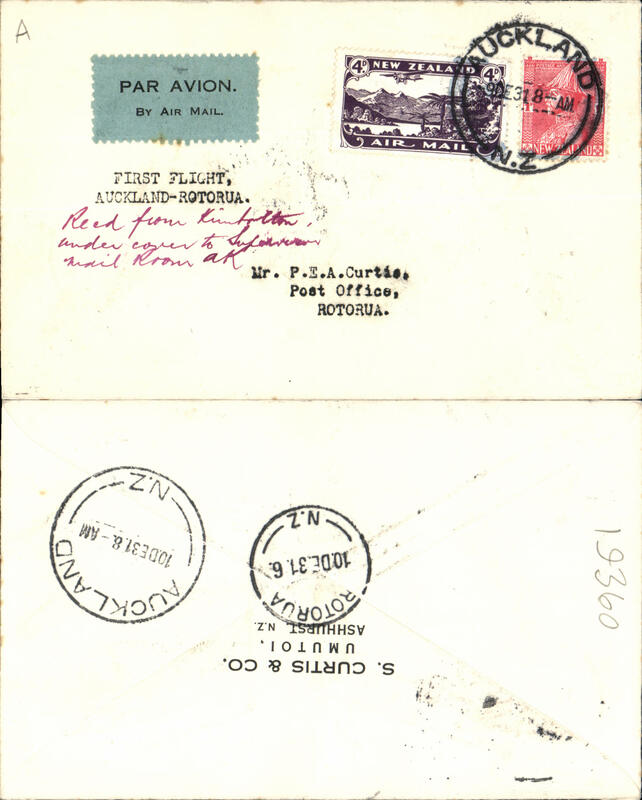 Musik "Samoan Clipper", Auckland-San Francisco survey flight, bs 6/1/38, franked 4/6, red boxed cachet, par avion etiquette, attractive and uncommon rd/white/blue printed 'Pavois' souvenir cover, franked 4/6s, Pan Am. Capt. 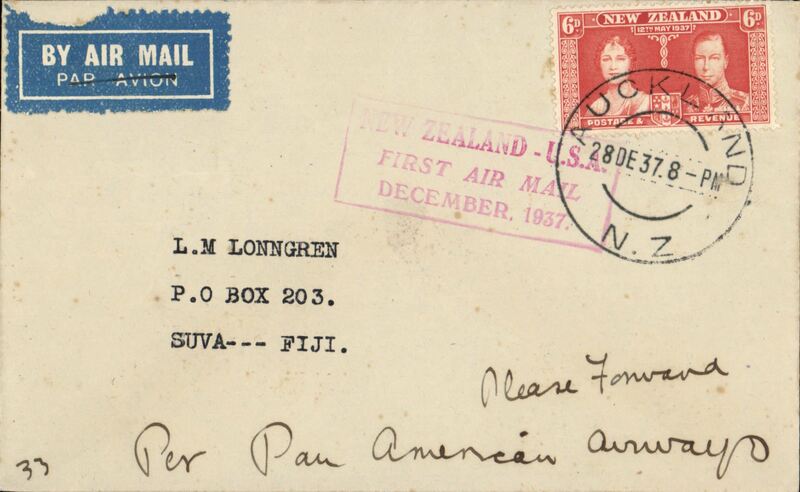 Musik, Pan Am 'Samoa Clipper', Trans-Pacific Survey Flight #2, New Zealand to Pago Pago, bs 1/1/38, and on to Fiji, bs Suva bs 18/1/38, plain cover, franked 6d, canc Auckland 31/12 cds, red framed fight cachet. Capt. 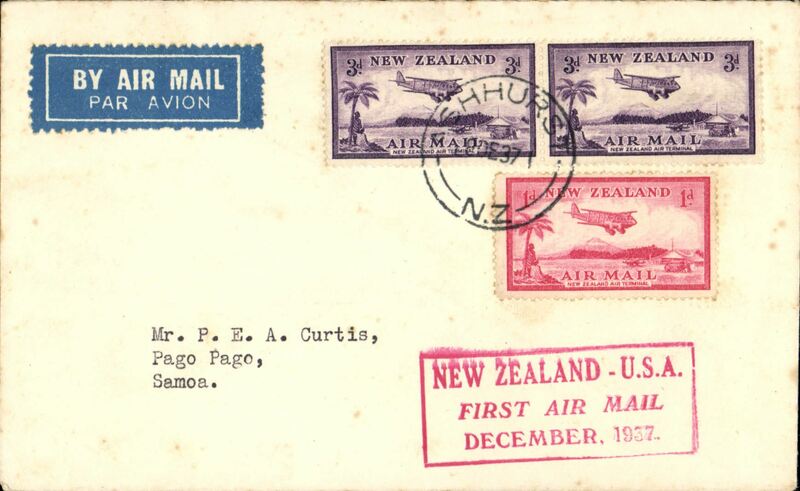 Musik, Pan Am 'Samoa Clipper', Trans-Pacific Survey Flight #2, New Zealand to Pago Pago, bs 1/1/38, red/blue/cream souvenir cover, franked 6d, canc Auckland 28/12 cds, red framed fight cachet. Capt. 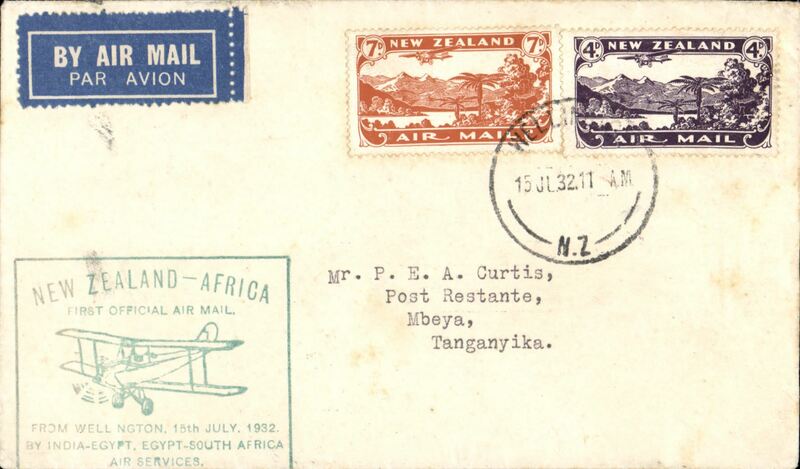 Musik, Pan Am 'Samoa Clipper', Trans-Pacific Survey Flight #2, New Zealand to Pago Pago, bs 1/1/38, plain cover, franked 7d, canc Auckland 29/12 cds, red framed fight cachet. Capt. 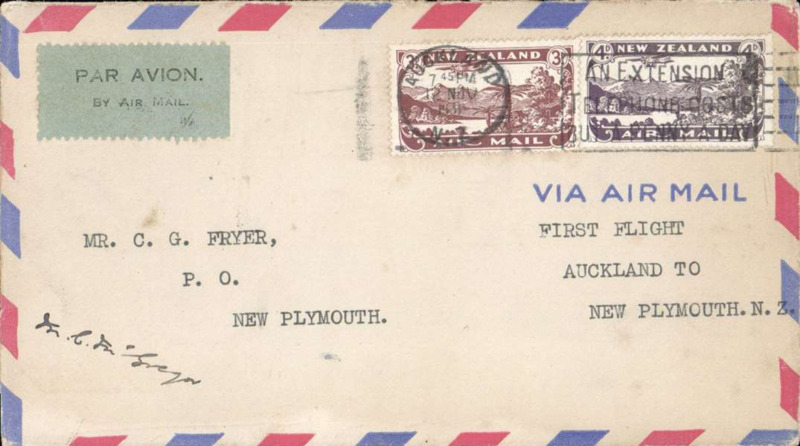 Musik, Pan Am 'Samoa Clipper', Trans-Pacific Survey Flight #2, New Zealand to Pago Pago, bs 1/1/38, souvenir cover, franked 6d, canc Auckland 31/12 cds, red framed fight cachet. 31st Dec is last known date and is relatively scarce. F/F, Wanganui to Palmerston North, and on to Wellington, bs 10/1, East Coast AW. 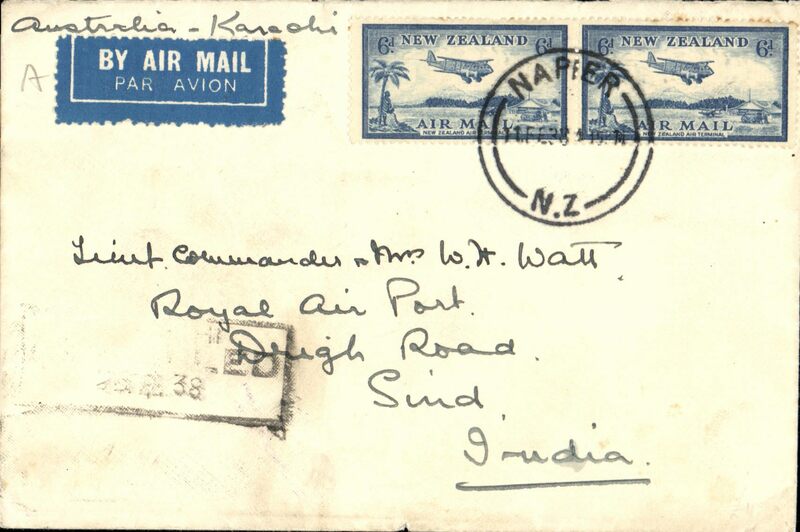 New Zealand to India, Napier to Sind, bs Karachi 25/2, airmail etiquette cover franked 1/-, partial strike 'Cancelled/Karachi/...38' receiver. 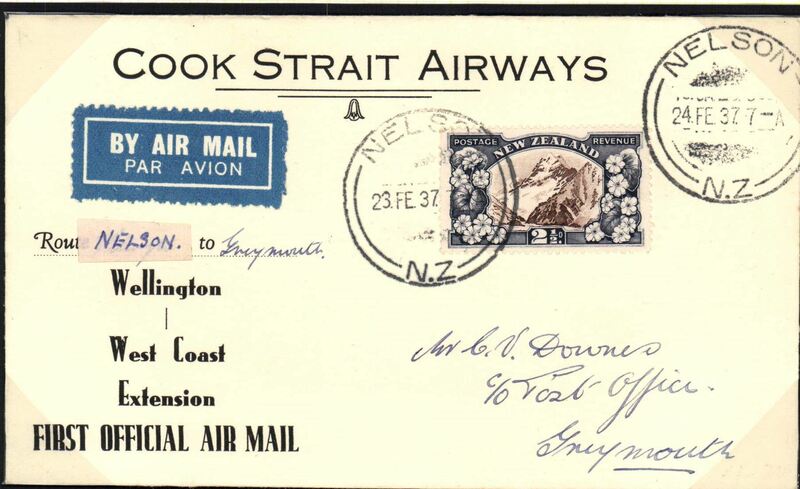 Carried by Imperial Airways on the last flight before the introduction of the new Australia service timetable, consequent upon the introduction of stage 2 of the Empire Air Mail Service. Nice one for the exhibit. 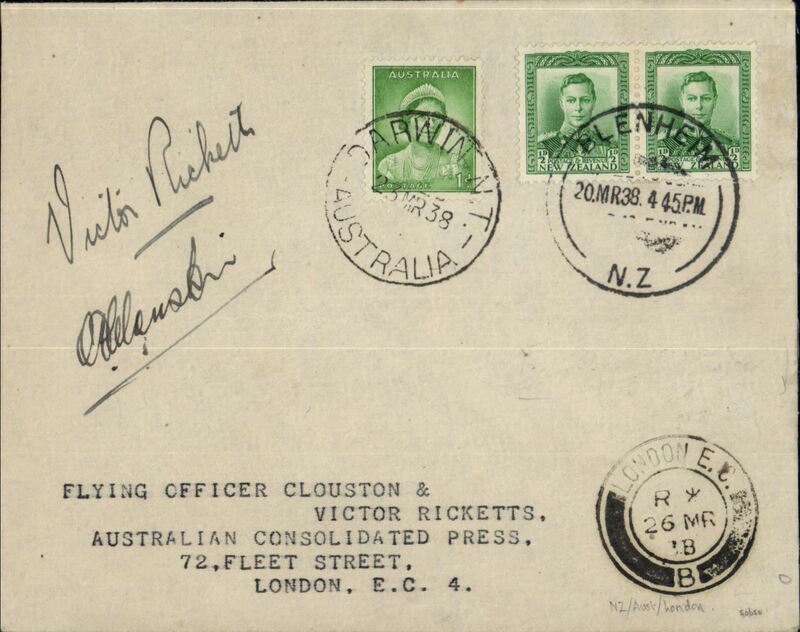 Cover flown from Blenheim to London by Clouston & Ricketts on their record breaking flight in DH88 Comet ‘Australian Anniversary.’ Cancelled at Drwin on 23/3 & London on 26/3. 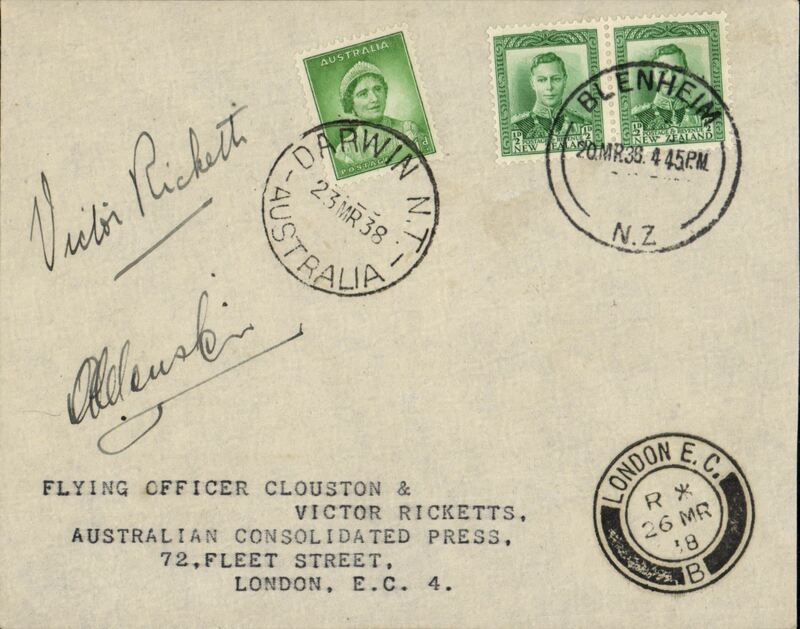 Clouston & Ricketts, return flight New Zealand-Australia-England in the DH-88 Comet 'Australian Anniversary', cover franked New Zealand 1/2d x2 canc Blenheim 20/3 cds and Australia 1d canc Darwin 23/10 cds, also London 26/3 arrival cds. Signed on front by 'A E Clouston' and 'Victor Ricketts', . One of only twelve signed covers carried. 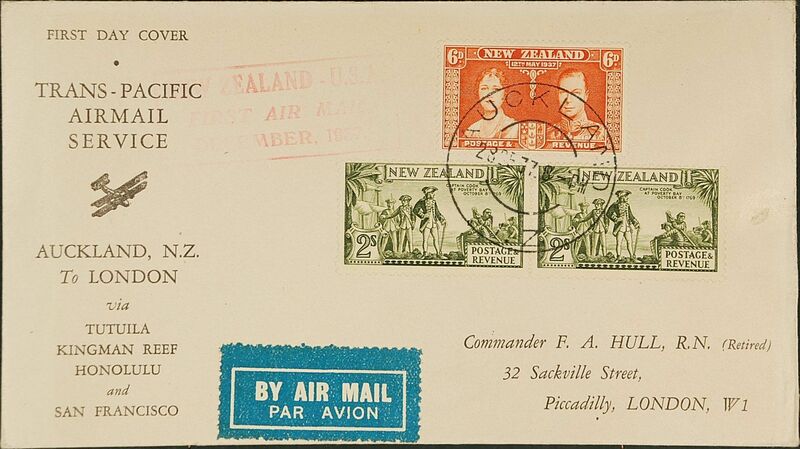 Extension of Air Mail Service to New Zealand, uncommon brown/cream souvenir cover variety, sent on first day of service from NZ to Australia, franked 1 1/2d canc Napier 26.Jl.38. The NZ-Australia leg was by sea. NZ acceptance for inauguration EAMS Australia-England, no arrival ds, uncommon printed brown/cream "Dominion of New Zealand" souvenir corner cover, franked 1 1/2d canc New Plymouth cds, Imperial AW, flown in "Carpentaria" by Capt. Denny Orme. 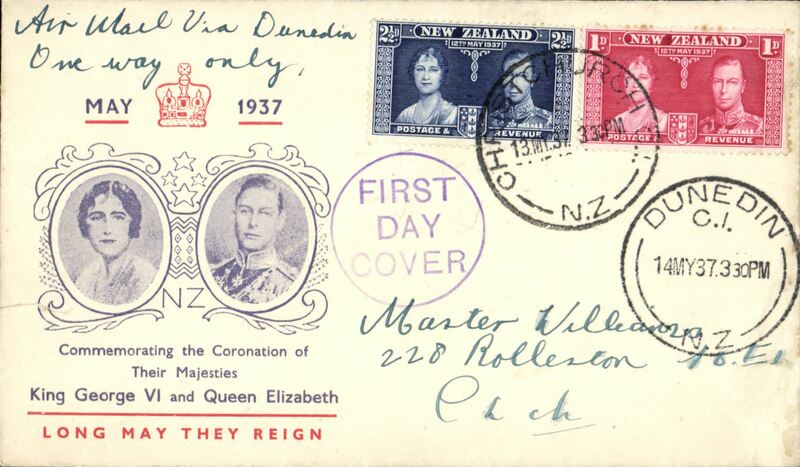 NZ acceptance for inauguration EAMS Australia-England, no arrival ds, uncommon red/white/blue souvenir 'First Day Cover'Zealand" cover showing Union Jack and map of route franked 1 1/2d canc New Plymouth cds, Imperial AW, flown in "Carpentaria" by Capt. Denny Orme. 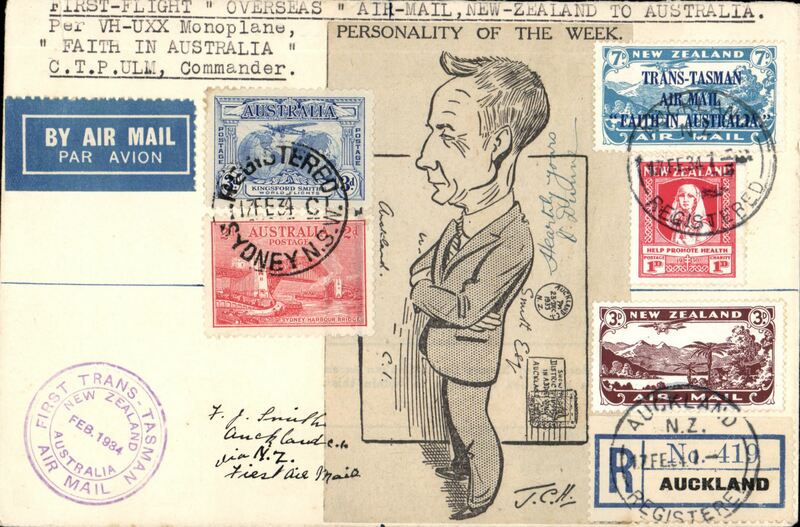 Double rate NZ acceptance for inauguration EAMS Australia-England, no arrival ds, uncommon illustrated souvenir (22x10cm) cover showing map of route franked 2x 1 1/2d canc Palmerston cds, Imperial AW. Ironed vertical crease. 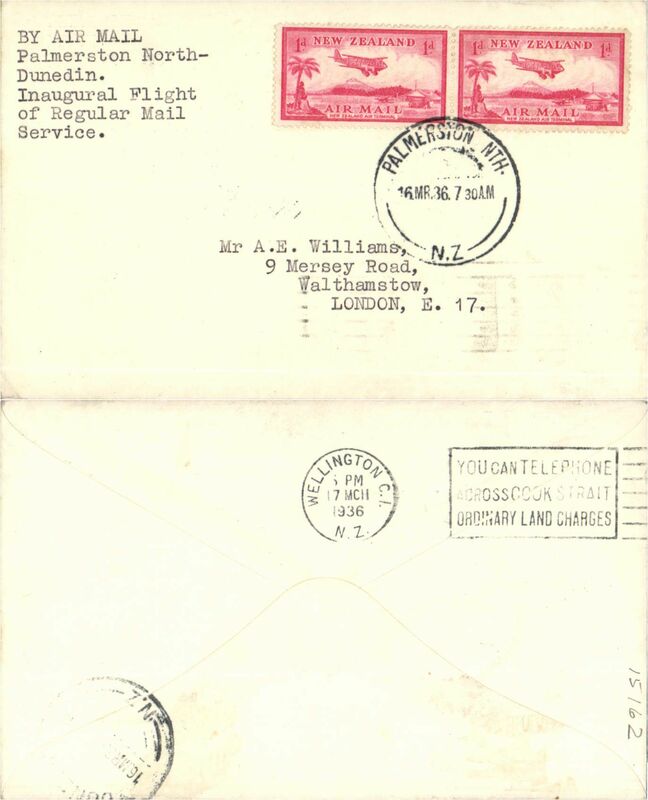 Stage 3 EAMS, "First Empire Air Mail" uncommon and attractive grey/red printed souvenir cover to England, franked 1 1/2d. 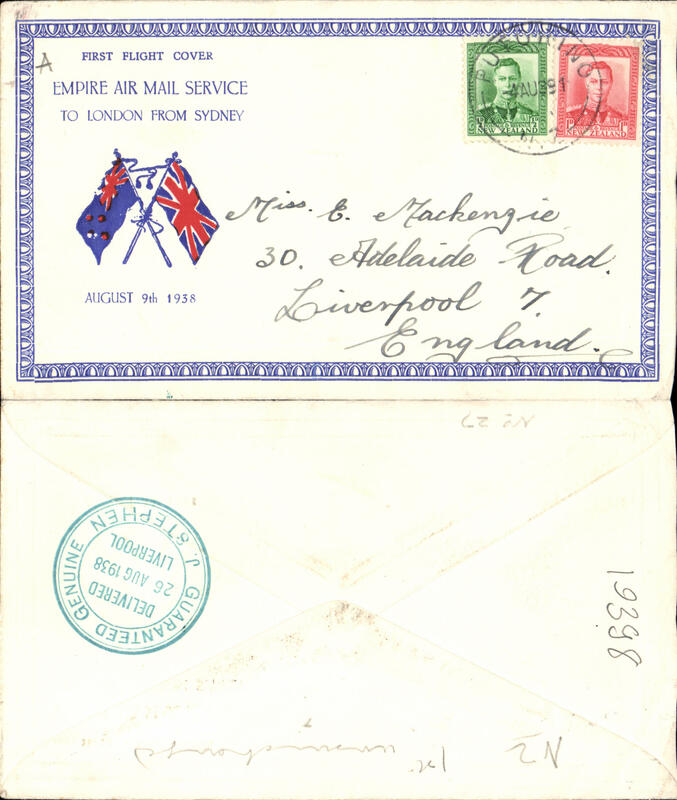 "First Flight Cover/Empire Air Mail Mail Service/From Sydney", attractive red/white/blue 'Twin Flags' souvenir cover to England, 20 Aug 38 arrival ds on front, franked 1 1/2d NZ stamp canc Wanganui cds, and GB 1/2d for surface return to NZ. 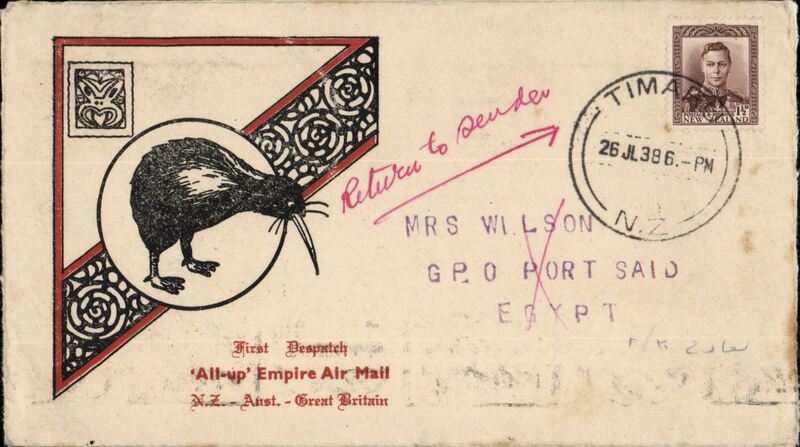 First mail from New Zealand to Egypt dispatched under Stage 3 of the Empire Air Mail Scheme and first thrice weekly service from Australia, Temuka to Port Said, bs 22/8, via Alexandria 21/8, black/red/cream 'Kiwi' souvenir cover franked 1 1/2d canc Temuka 26 Jul 38 cds. Departed from NZ by sea on 4 Aug aboard the SS Waganella to Sydney from where it departed on 9 Aug the in flying boat Coriolanus to Alexandria. 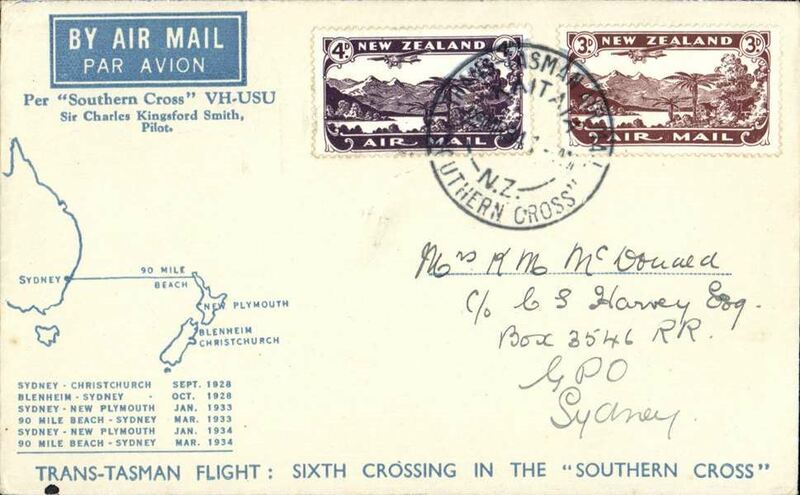 Although 26 July was the official start of Stage 3 EAMS, acceptances from New Zealand were held back for the flight that left on 9 August to ensure that the first EAMS mail did not overtake the last sea-mail service. 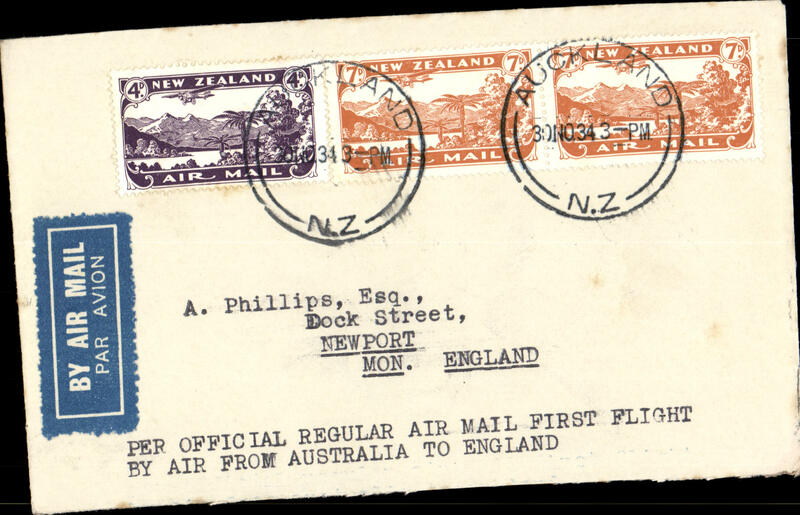 New Zealand to Bermuda, first NZ acceptance for inaugural EAMS Australia-England and OAT to Bermuda via London, no arrival ds, registered (label) illustrated black/red "Kiwi/All Up"souvenir cover, franked FDI 1 1/2d x3 plus 1935 3d and 6d airs, canc Granity cds, Imperial AW/Qantas, flown in "Carpentaria" by Capt. Denny Orme. 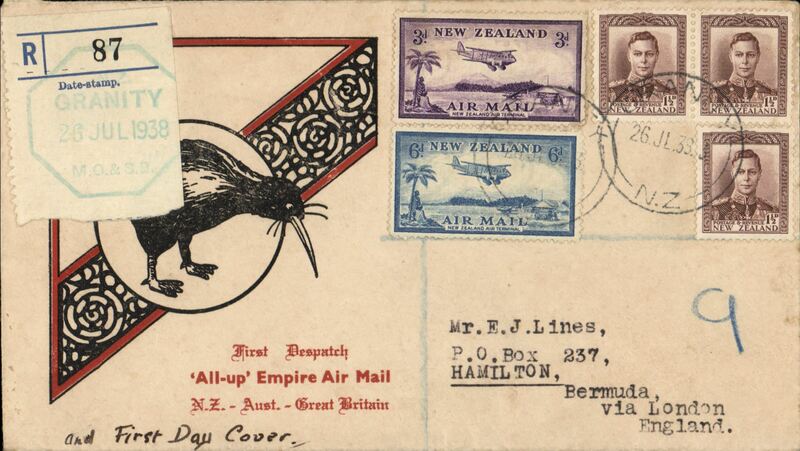 New Zealand to Scotland, first NZ acceptance for inaugural EAMS Australia-England, no arrival ds, illustrated black/red "Kiwi/All Up"souvenir cover, franked FDI 1 1/2d canc Granity cds, Imperial AW/Qantas, flown in "Carpentaria" by Capt. 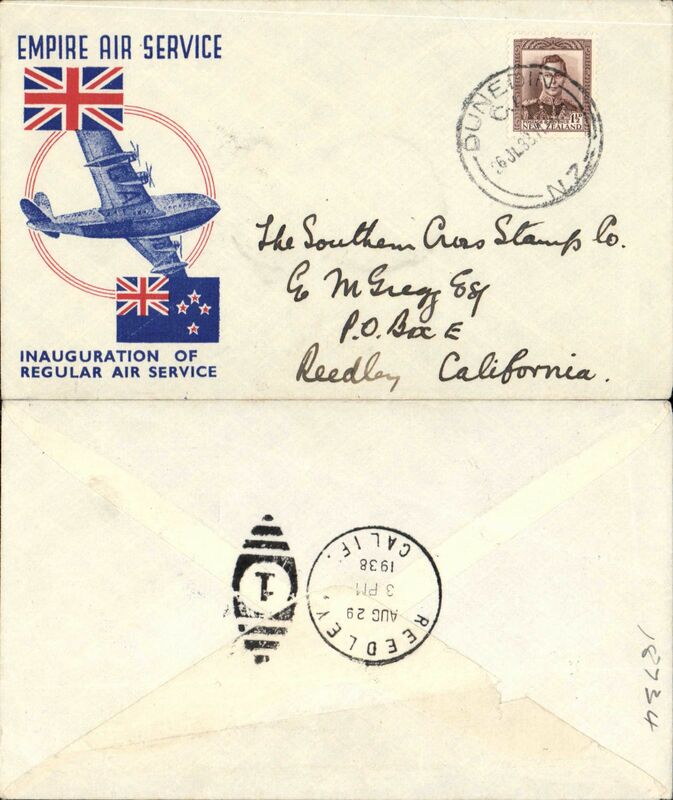 Denny Orme..
First acceptance of mail for USA of mail from New Zealand for carriage on the inaugural Empire Air Mail Servce from Australia to England, Dunedin to Reedley, California, bs 29/8, attractive red/white/blue 'Union Jack' Empire Air Service souvenir cover, franked 1 1/2d canc Dunedin cds, Imperial Airways, flown in "Carpentaria" by Capt. Orme Denny. 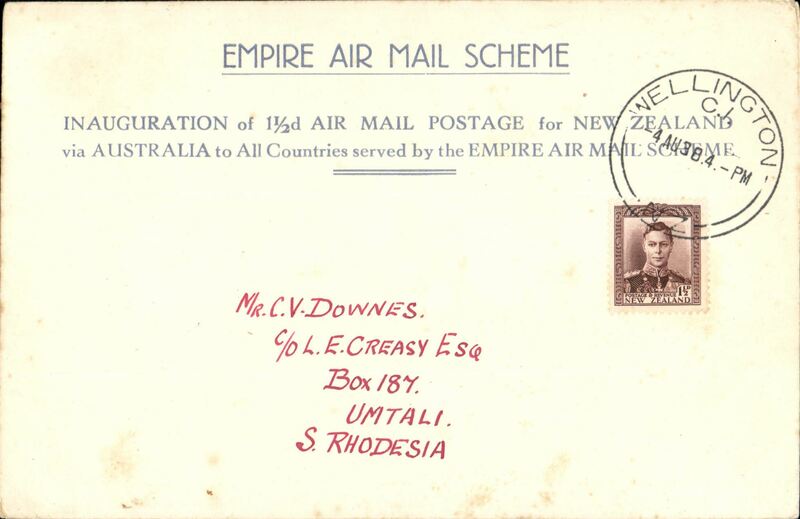 NZ acceptance for inauguration of EAMS Australia-England, no arrival ds, illustrated red/white/blue 'Union Jack' Empire Air Service souvenir cover, franked 1 1/2d canc Stratford cds, Imperial Airways. 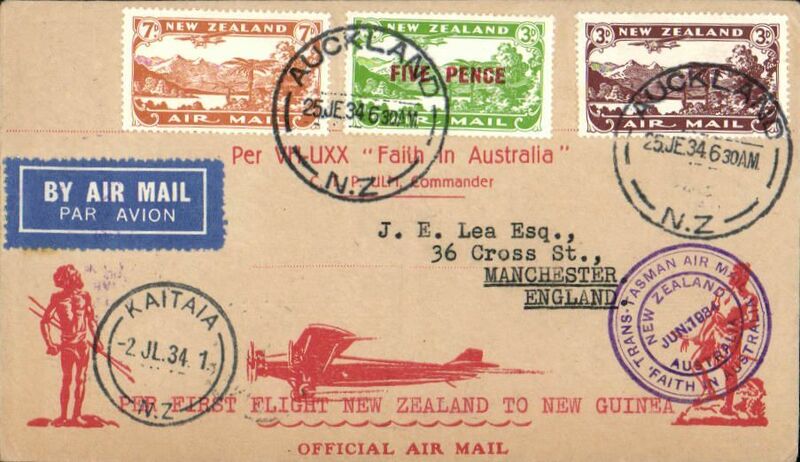 NZ acceptance for inauguration EAMS Australia-England, no arrival ds, registered cover franked 6d, canc Dunedin cds. 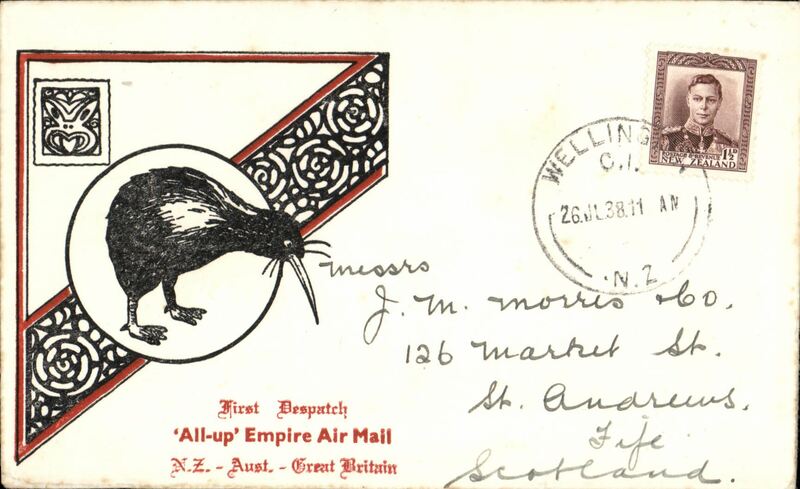 NZ acceptance for inauguration EAMS Australia-England, no arrival ds, illustrated black/red "Kiwi/All Up "souvenir cover, franked 1 1/2d canc Wellington cds, Imperial AW, flown in "Carpentaria" by Capt. Denny Orme. 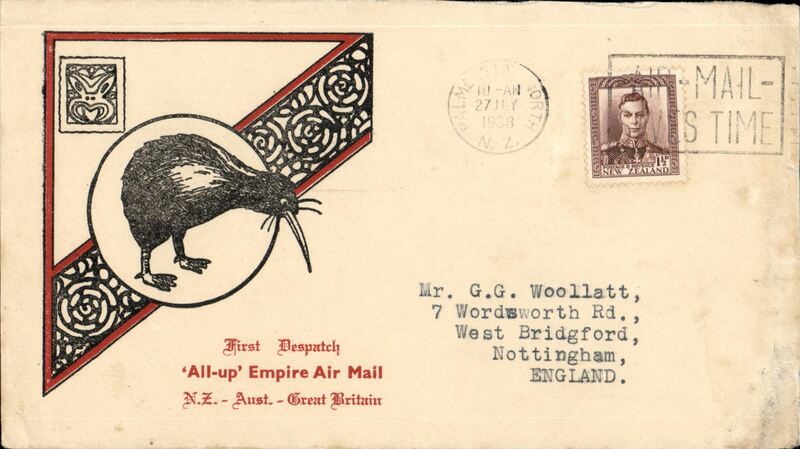 NZ acceptance for inauguration EAMS Australia-England, no arrival ds, illustrated black/red "Kiwi/All Up "souvenir cover, franked 1 1/2d canc Palmerston Norhth cds, Imperial AW, flown in "Carpentaria" by Capt. Denny Orme. 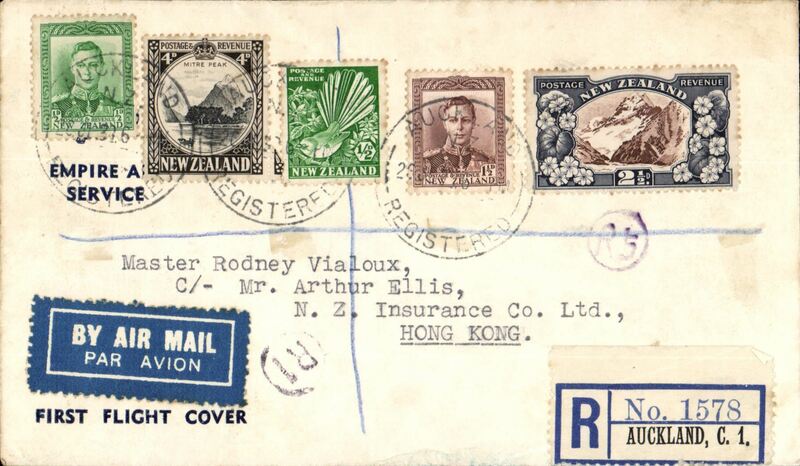 Cover flown al the way by air from Auckland to Hong Kong, bs 12/8, reg (label) printed 'Empire Air Mail Service/First Flight Cover', franked 9d, canc Auckland Registered cds, blue/white airmail etiquette. 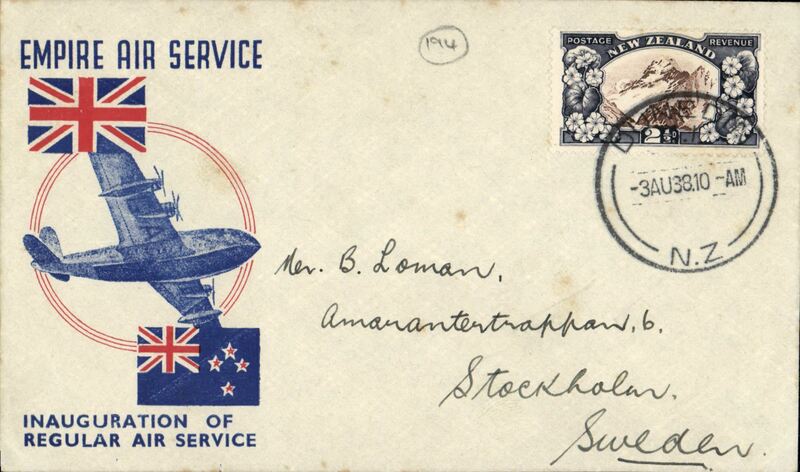 Although the EAMS to Australia and New Zealand service officially started on 26 July 1938 the NZ F/F EAMS mail was held back until Aug 4 to ensure that it did not overtake the last sea-mail dispatch at the pre-EAMS rate which left Auckland on 25 July. 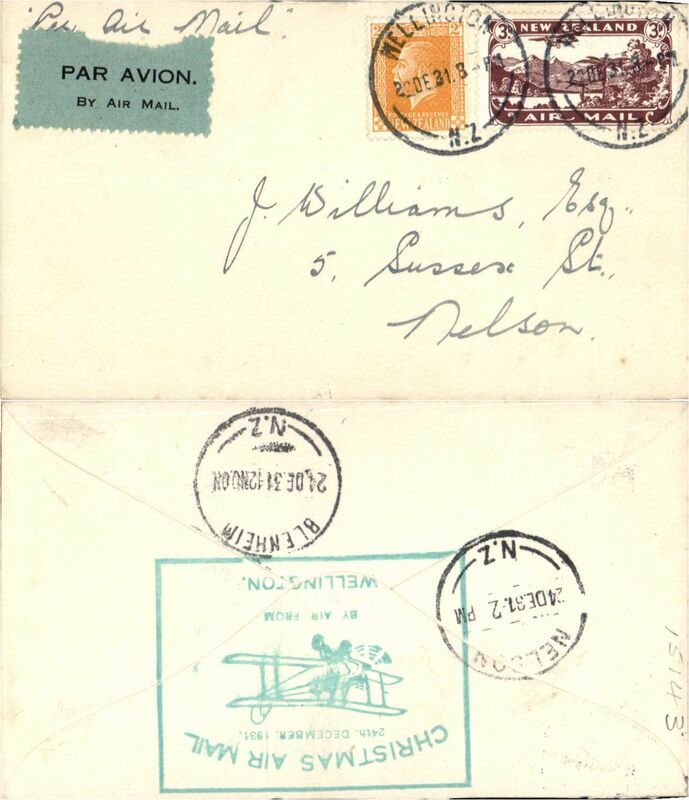 The sender of this particular cover paid the now 'defunct' 5d air mail surcharge to avoid this delay, and to ensure carriage by air all the way to Hong Kong. A nice one for the exhibit. 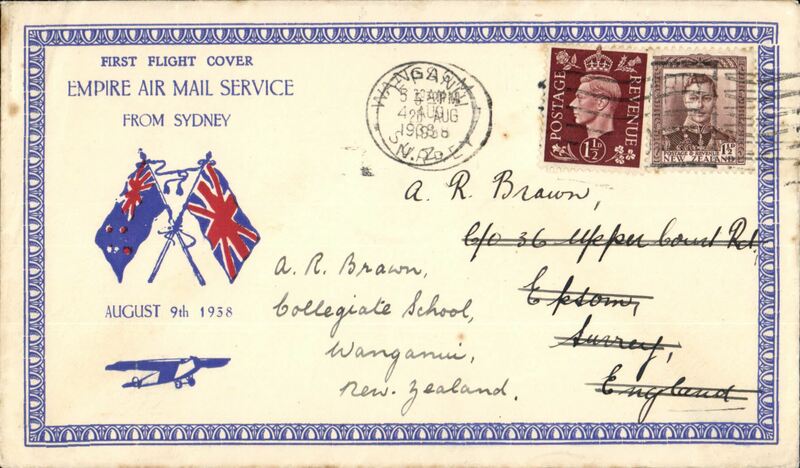 Inauguration EAMS NZ-England, no arrival ds, attractive red/white/blue printed souvenir cover with crossed flags and "First Flight Cover/Empire Air Mail Service/From Sydney/August 9th 1938", Imperial AW. First mail from New Zealand to the Transvaal dispatched under Stage 3 of the Empire Air Mail Scheme and first thrice weekly service from Australia, Temuka to Pietersburg, bs 23/8, red/white/blue 'Flag' souvenir cover franked 1 1/2d canc Temuka 2 Au 38 cds, fine strike three bar Jusqu'a. Departed from NZ by sea on 4 Aug aboard the SS Waganella to Sydney from where it departed on 9 Aug in flying boat Coriolanus connecting at Alexandria with the England -South Africa service. 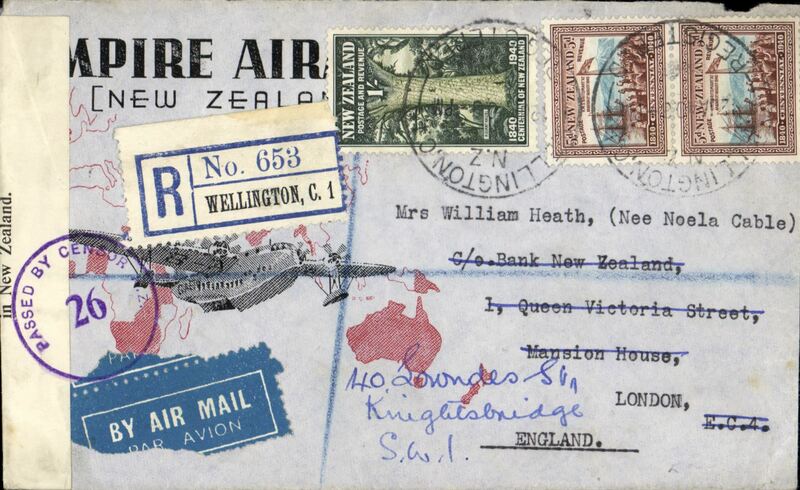 Although 26 July was the official start of Stage 3 EAMS, acceptances from New Zealand were held back for the flight that left on 9 August to ensure that the first EAMS mail did not overtake the last sea-mail service. 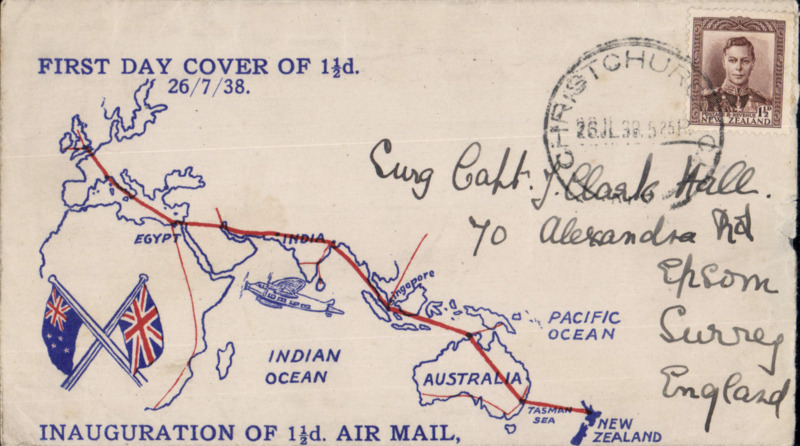 First mail from New Zealand to Tanganyika dispatched under Stage 3 of the Empire Air Mail Scheme and first thrice weekly service from Australia, Temuka to Lindi, red/white/blue 'Flag' souvenir cover franked 1 1/2d canc Temuka 2 Au 38 cds. 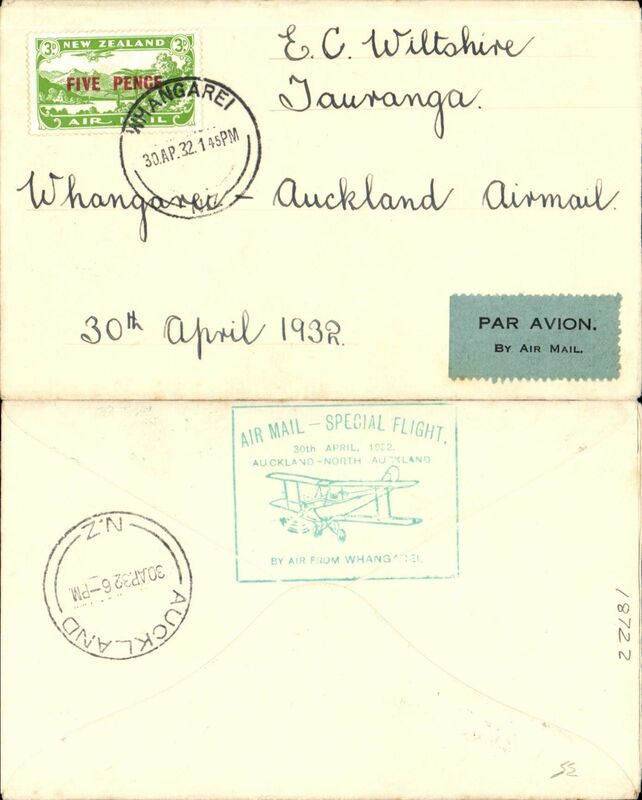 Departed from NZ by sea on 4 Aug aboard the SS Waganella to Sydney from where it departed on 9 Aug in flying boat Coriolanus connecting at Alexandria with the England -South Africa service and at Mombassa with Wilson Airways to destination. 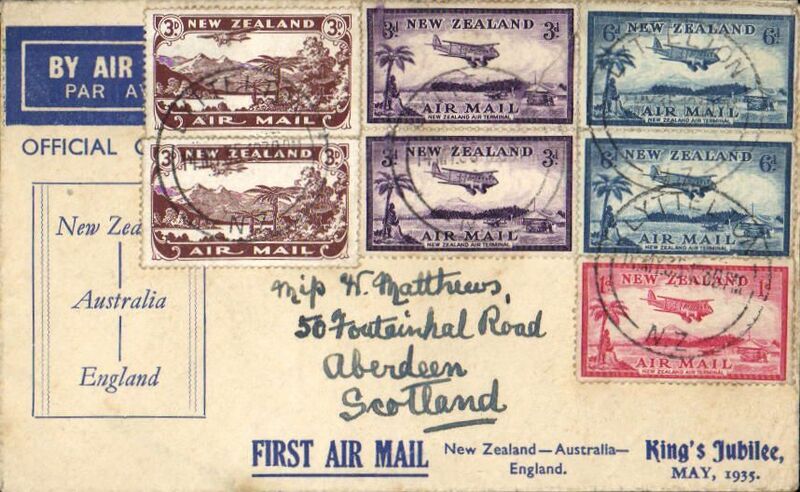 Although 26 July was the official start of Stage 3 EAMS, acceptances from New Zealand were held back for the flight that left on 9 August to ensure that the first EAMS mail did not overtake the last sea-mail service. 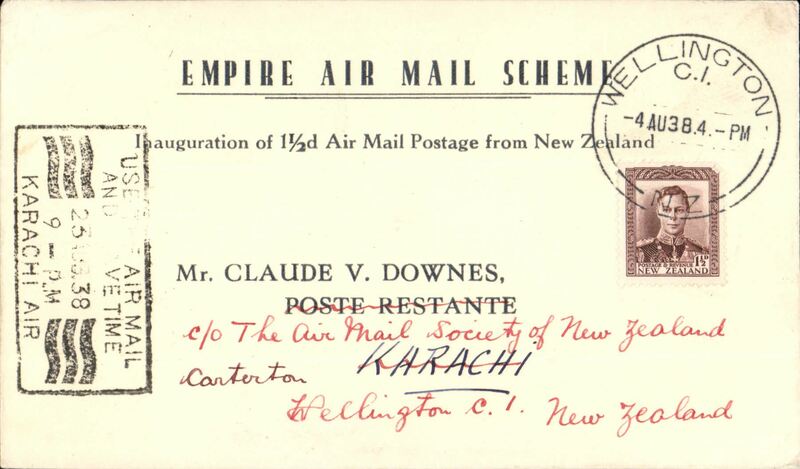 First mail from New Zealand to India dispatched under Stage 3 of the Empire Air Mail Scheme and first thrice weekly service from Australia, Wellington to Karachi, bs 15/8, printed souvenir 'Empire Air Mail Scheme' cover franked 1 1/2d canc Wellington /4 Aug/1938 cds. Departed from NZ by sea on 4 Aug aboard the SS Waganella to Sydney from where it departed on 9 Aug in flying boat Coriolanus to Karachi. 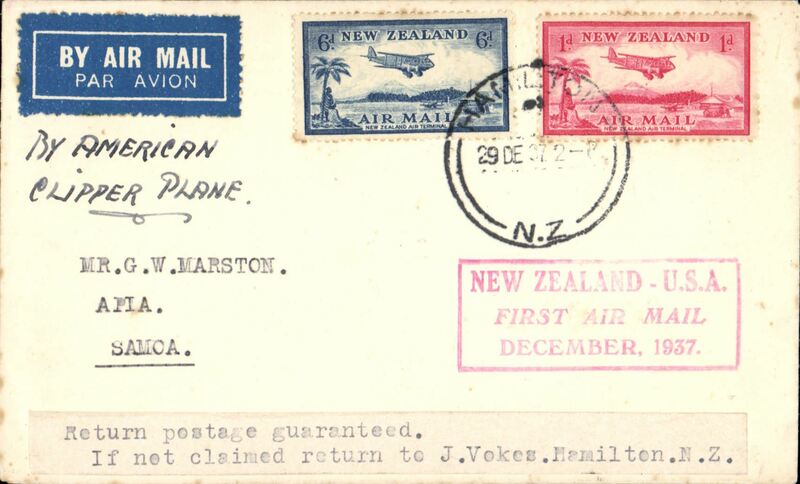 Although 26 July was the official start of Stage 3 EAMS, acceptances from New Zealand were held back for the flight that left on 9 August to ensure that the first EAMS mail did not overtake the last sea-mail service. 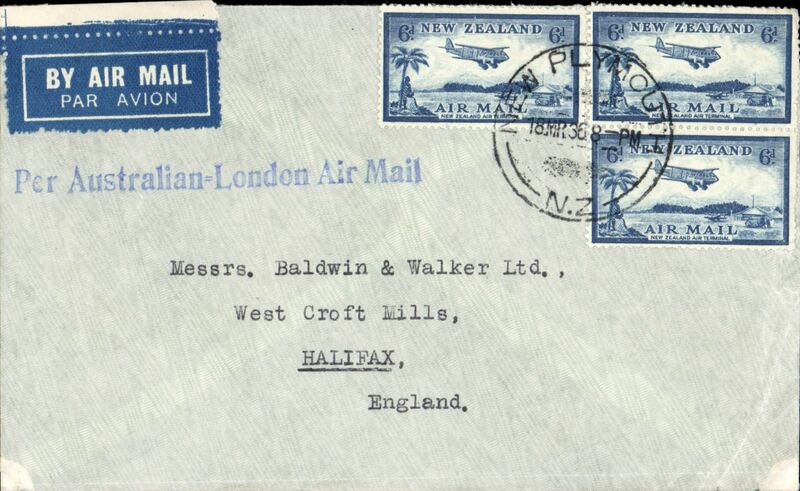 First mail from New Zealand to Southern Rhodesia dispatched under Stage 3 of the Empire Air Mail Scheme and first thrice weekly service from Australia, Wellington to Umtali, bs 23/8, printed souvenir 'Empire Air Mail Scheme' card franked 1 1/2d canc Wellington /4 Aug/1938 cds. Departed from NZ by sea on 4 Aug aboard the SS Wagganella to Sydney from where it departed on 9 Aug in flying boat Coriolanus to Alexandria connecting with the England-South Africa service. 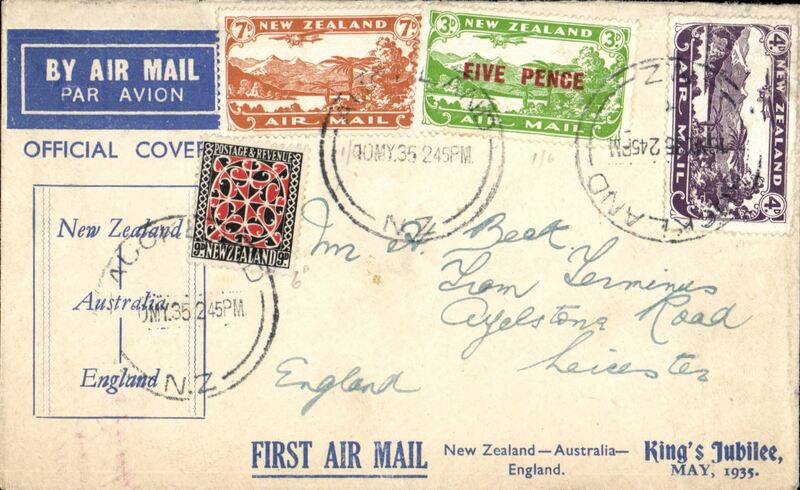 Although 26 July was the official start of Stage 3 EAMS, acceptances from New Zealand were held back for the flight that left on 9 August to ensure that the first EAMS mail did not overtake the last sea-mail service. 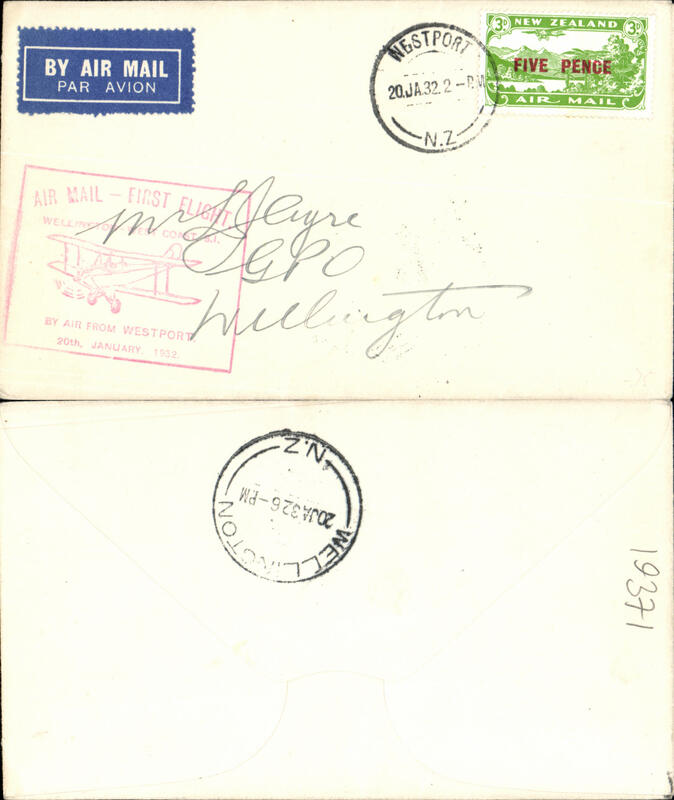 First mail from New Zealand to Burma dispatched under Stage 3 of the Empire Air Mail Scheme and first thrice weekly service from Australia, Wellington to Akyab, 14/8 arrival ds on front, via Rangoon 13/8, printed souvenir 'Empire Air Mail Scheme' card franked 1 1/2d canc Wellington /4 Aug/1938 cds. Departed from NZ by sea on 4 Aug aboard the SS Waganella to Sydney from where it departed on 9 Aug in flying boat Coriolanus. 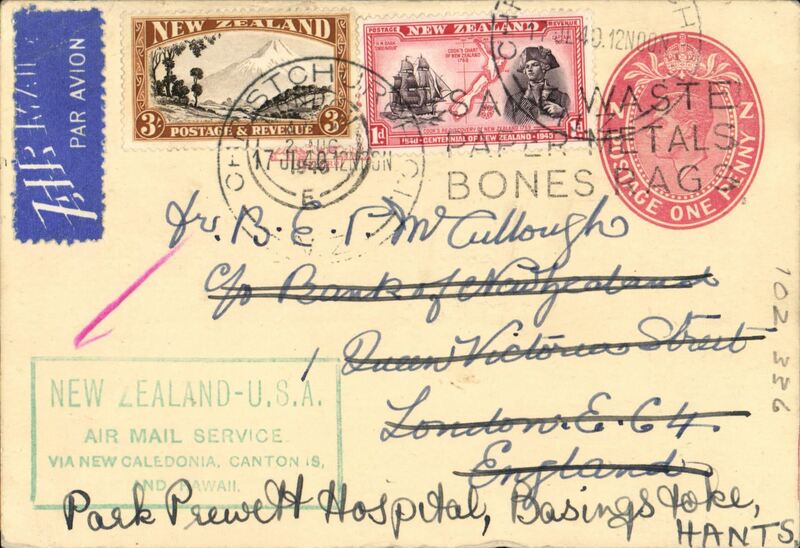 Although 26 July was the official start of Stage 3 EAMS, acceptances from New Zealand were held back for the flight that left on 9 August to ensure that the first EAMS mail did not overtake the last sea-mail service. 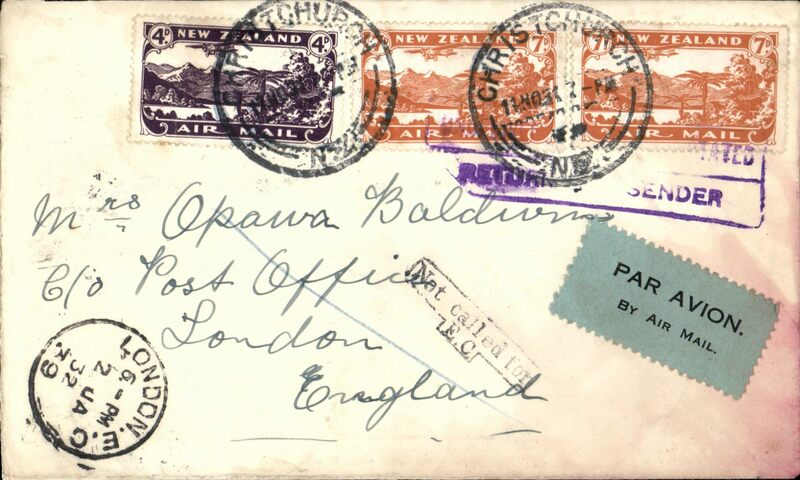 Stage 3 Empire Air Mail Scheme, NZ acceptance for first thrice weekly 'All Up' service, Otahuhu to London, bs Warrington 19/8, registered (label) cover franked 5d, IAW/Qantas, flown in "Cariolanus" by Capt. GU Allan. 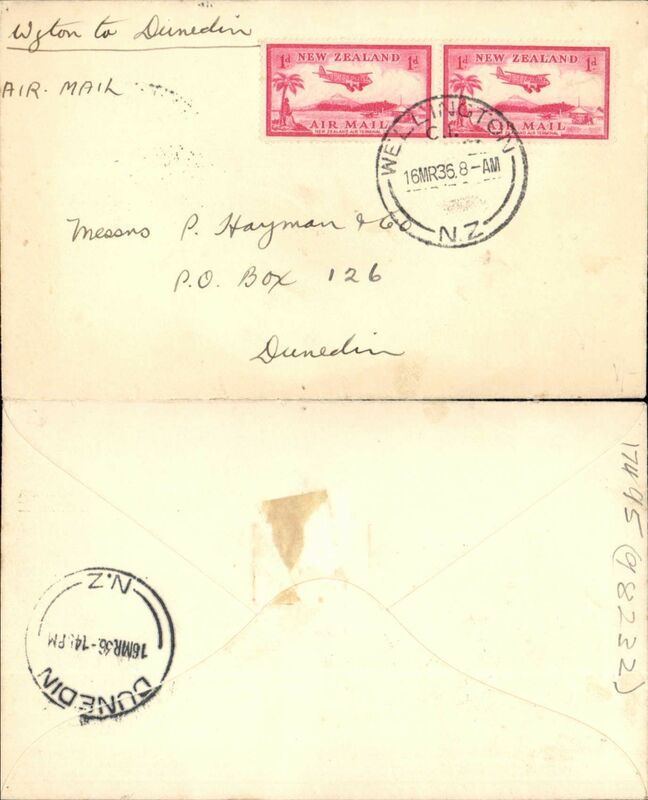 Stage 3 Empire Air Mail Scheme, NZ acceptance for first thrice weekly 'All Up' service, Dunedin to Stockholm, Sweden, no arrival ds, red/white/blue Empire Air Service souvenir cover franked 2 1/2d. 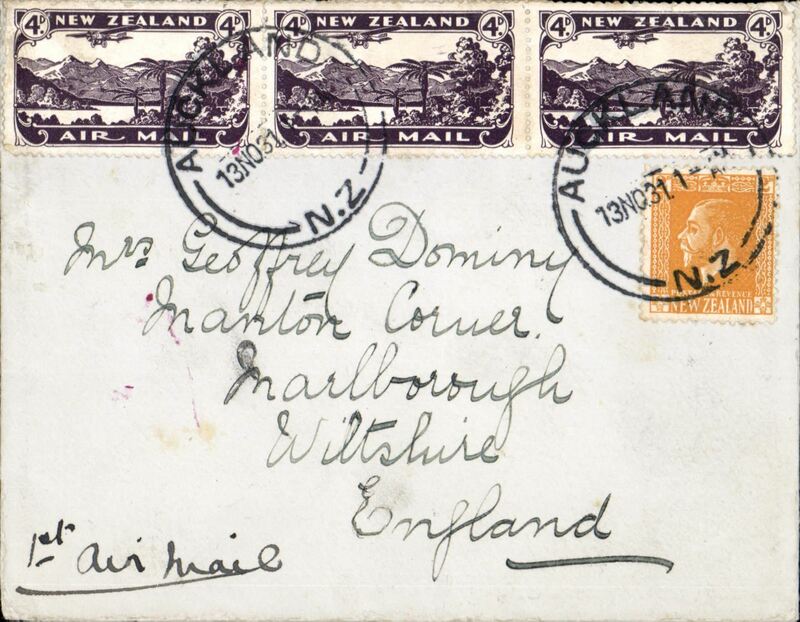 First mail from New Zealand to England dispatched under Stage 3 of the Empire Air Mail Scheme and first thrice weekly service from Australia, Wanganui to England, no arrival ds, printed souvenir 'Empire Air Mail Service' corner cover franked 1 1/2d canc Wanganui /4 Aug/1938 cds. Departed from NZ by sea on 4 Aug aboard the SS Waganella to Sydney from where it departed on 9 Aug in flying boat Coriolanus to Southampton. 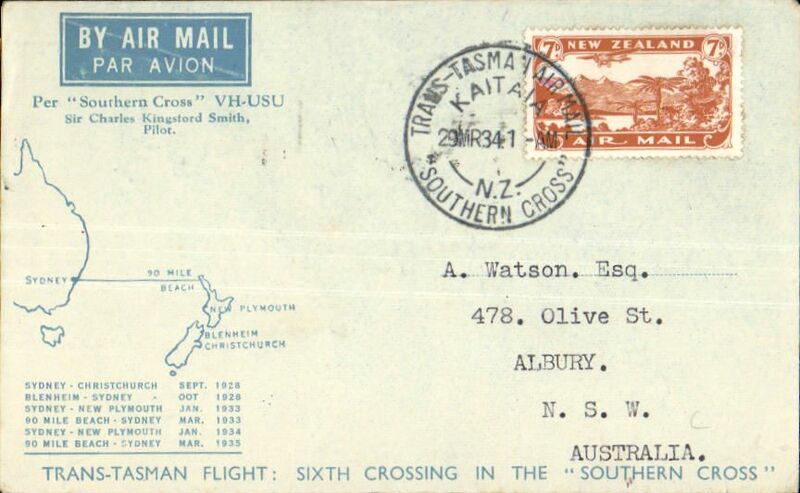 Although 26 July was the official start of Stage 3 EAMS, acceptances from New Zealand were held back for the flight that left on 9 August to ensure that the first EAMS mail did not overtake the last sea-mail service. 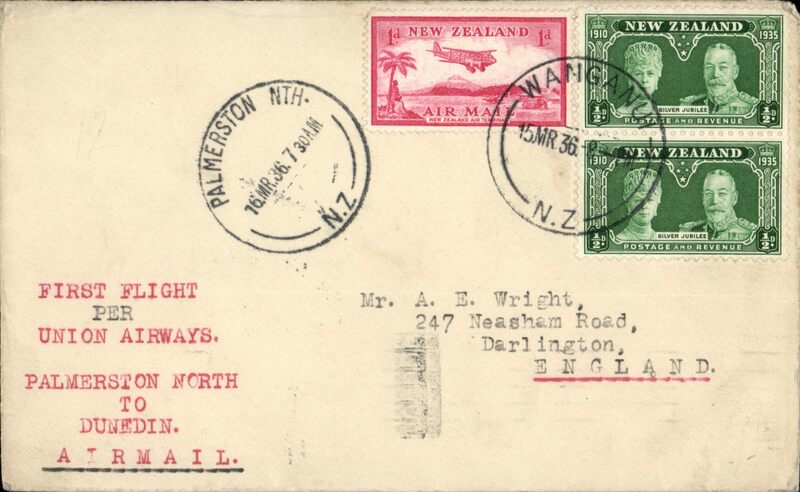 Stage 3 All Up postage rate, a framed information cachet similar to that used for Stages 1 and 2 but now including Australia and New Zealand, on airmail cover from New Zealand to England, franked 1 1/2d, canc Wellington 26 Aug 1938. See scans. 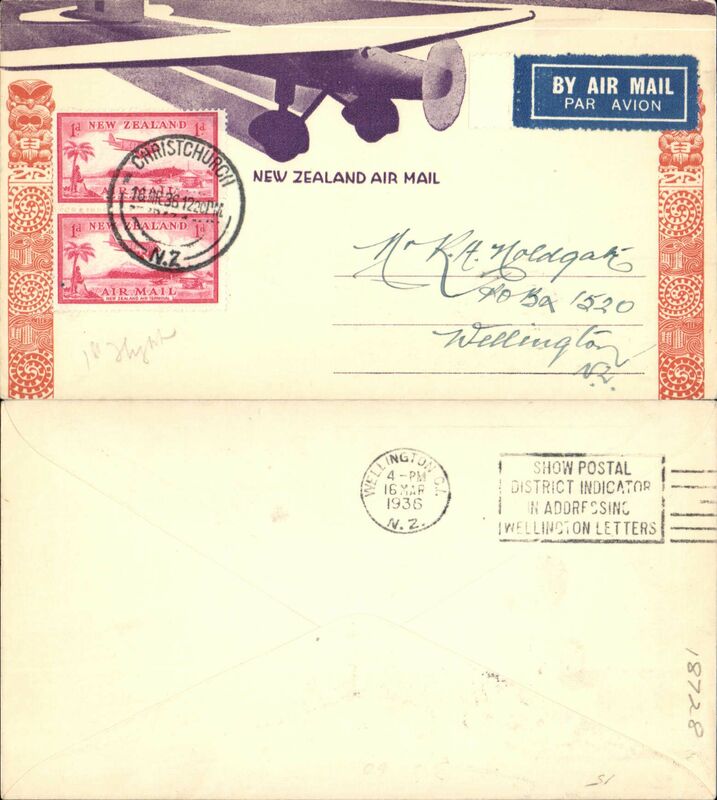 NZAMS, National Airmail Expo, special souvenir cover, franked 1d tied winged Expo cancellation. 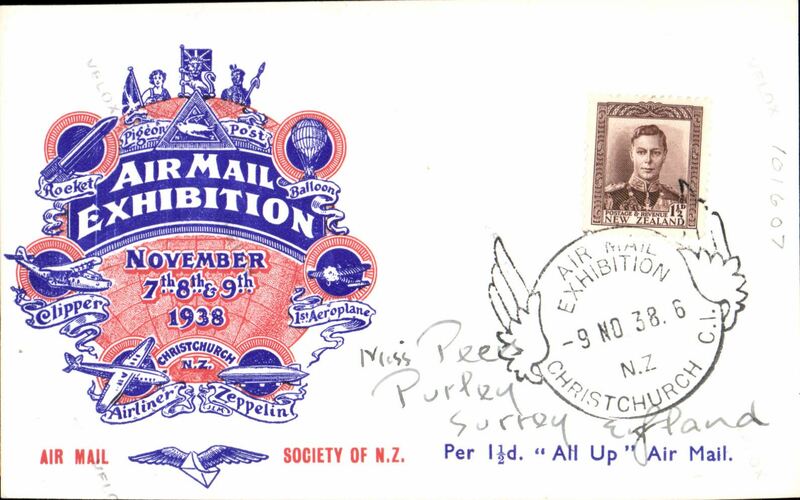 Air Mail Expo Christchurch, November 7,8,9, red/white/blue 'Per 1 1/2d "All Up" Air Mail day 3 souvenir card franked 1 1/2d and showing verso a B&W photo of the mail box and special bag in which official letters were carried on the first "All Up" from New Zealand. Only 50 cards were mailed on November 9. 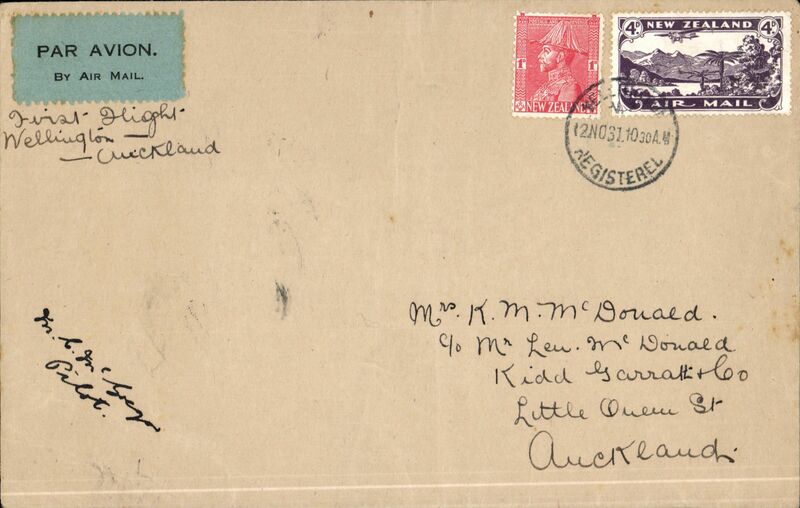 Early WWII airmail, Auckland to England, no arrival ds, airmail etiquette cover franked 1/6d, sealed B&W New Zealand censor tape, tied by black 'Passed by Censor N.Z/21'. 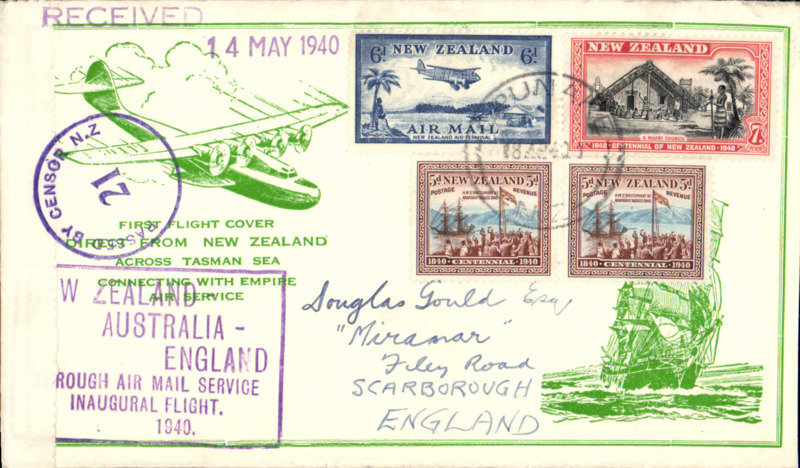 Correctly franked for carriage by sea to Australia, then by the BOAC empire service to England. 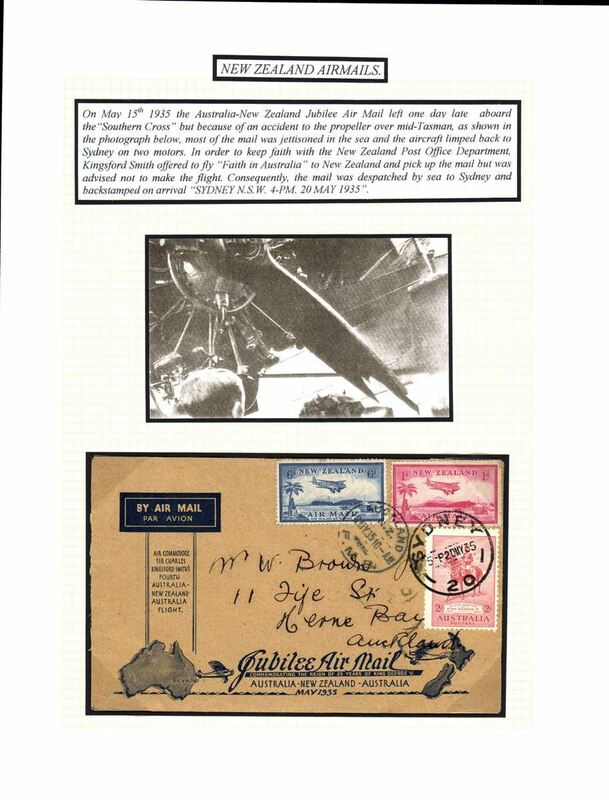 From the onset of WWII until April 1940 NZ did not have a direct airmail connection with any other country, see Boyle p866. 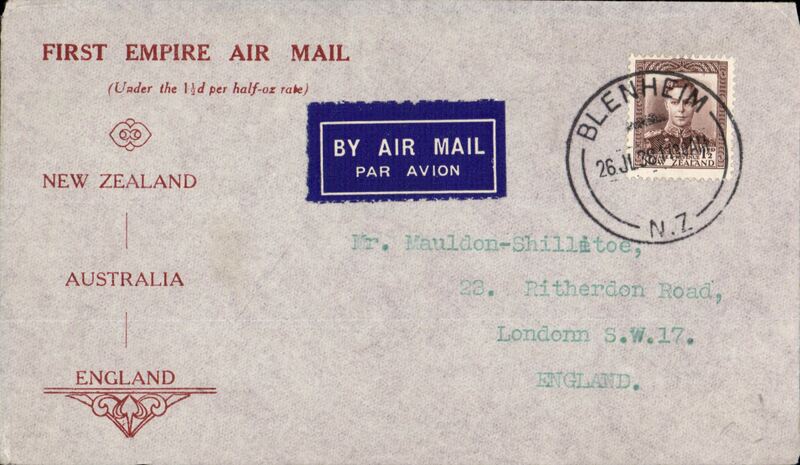 New schedule of airmail charges, NZ to London, via Empire Air Service, bs 5/2, registered red/black/grey' Empire Air Mai lService/New Zealand', correctly rated 1/6d + 4d registration, canc W ellington cds, sealed NZ censor tape tied by PBC NZ 26 censor mark. 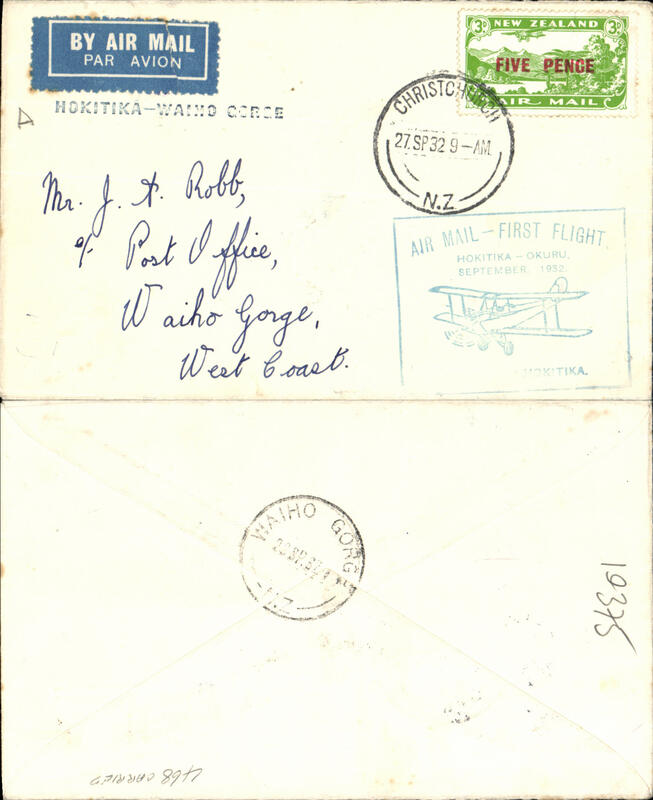 The new schedule reduced the srface rate, but the airmail rate remained the same. Small opening tear on flap. 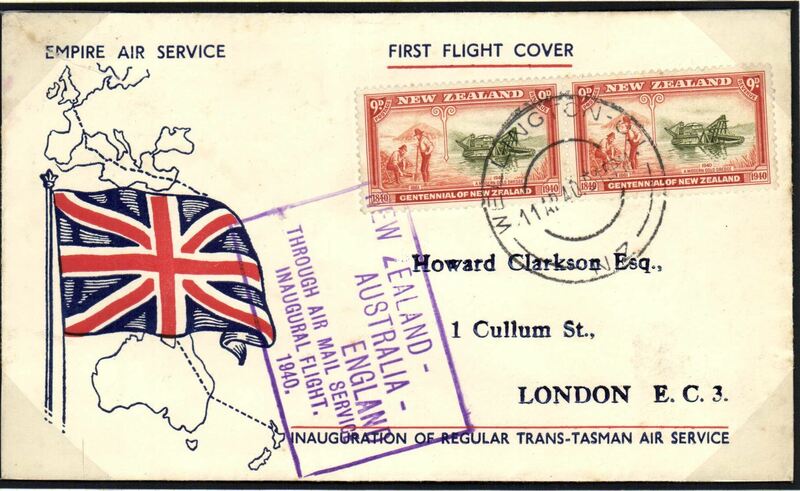 Auckland-London, carried on the inauguration of the regular trans-Tasman air service, by flying boat "Aotearoa" from Wellington to Sydney, then Qantas/BOAC to London, no arrival ds, fine strike violet framed official month omitted flight cachet, souvenir 'Empire Air Service' with map of route and Union Jack plain cover franked 1/6d. Service suspended in June 1940 when Italy joined the war. Mounted on album leaf with detailed explanatory text, see scan. 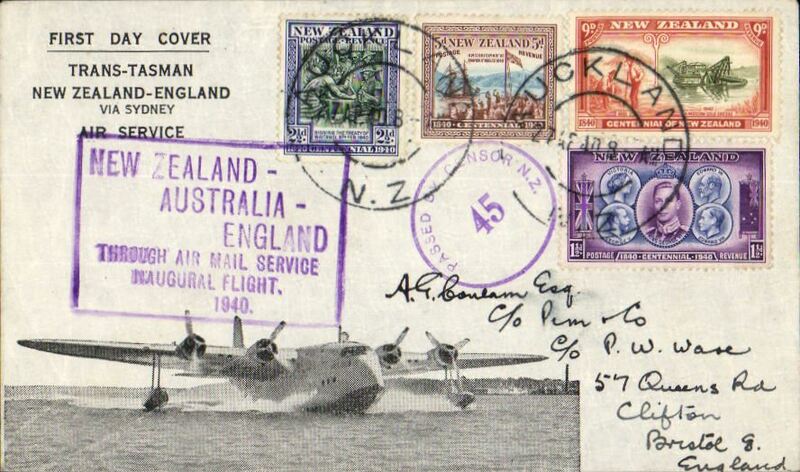 Auckland-London, carried on the inaugural flight flying boat "Aotearoa" from Auckland to Sydney, then Qantas/BOAC to London, no arrival ds, large framed official cachet with month omitted, "First Trans-Tasman/New Zealand-England/via Sydney/Air Service" cover franked 1/6d, violet circular NZ/45 censor marks front and verso. This service was suspended in June 1940 when Italy joined the war. 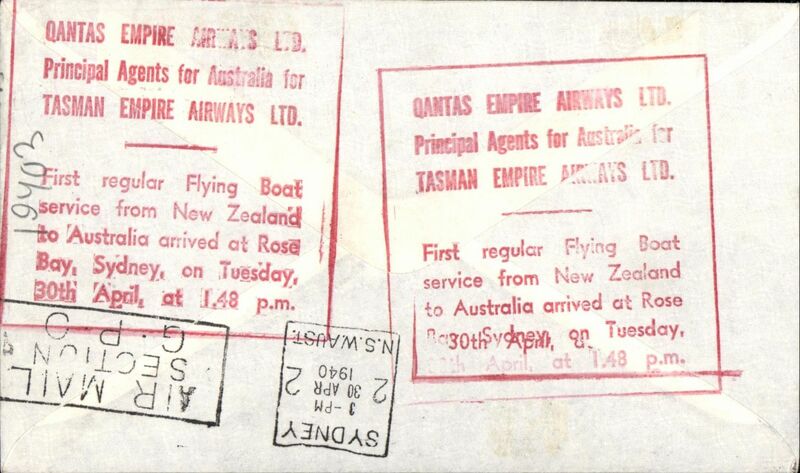 Auckland-London, carried on the inaugural flight flying boat "Aotearoa" from Auckland to Sydney, then Qantas/BOAC to London, no arrival ds, violet framed official month omitted flight cachet, plain cover franked 1/7 1/2d, sealed NZ censor tape, tied by NZ censor mark. Service suspended in June 1940 when Italy joined the war. 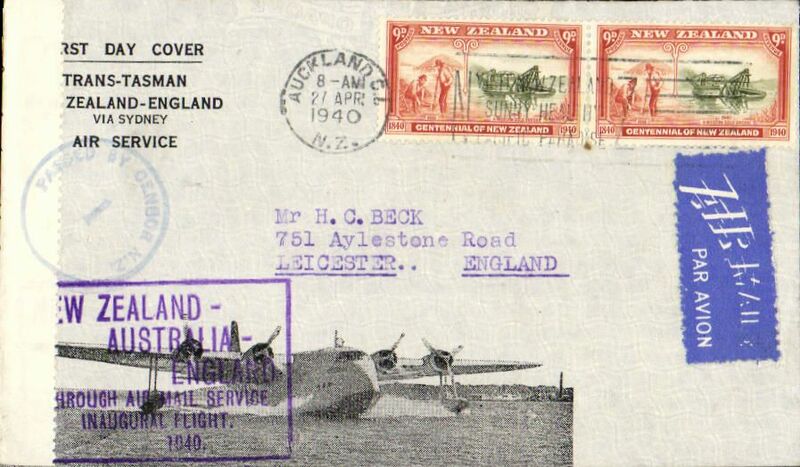 Auckland-London, carried on the inaugural flight flying boat "Aotearoa" from Auckland to Sydney, then Qantas/BOAC to London, two line 14 may 1940 reciever, large framed cachet, attractive gree/cream souvenir cover, sealed by B&W New Zealand censor tape. Service suspended in June 1940 when Italy joined the war. Auckland-London, carried on the inaugural flight flying boat "Aotearoa" from Auckland to Sydney, then Qantas/BOAC to London, no arrival ds, large framed flight cachet, souvenir "First Trans-Tasman/New Zealand-England/via Sydney/Air Service" cover, franked 1/6d, tied by violet circular NZ/7 censor mark. This service was suspended in June 1940 when Italy joined the war. Auckland-London, carried on the inaugural flight flying boat "Aotearoa" from Auckland to Sydney, then Qantas/BOAC to London, no arrival ds, large framed flight cachet, souvenir "First Trans-Tasman/New Zealand-England/via Sydney/Air Service" franked 1/6d, sealed NZ censor tape, tied by green circular NZ/7 censor mark. This service was suspended in June 1940 when Italy joined the war. 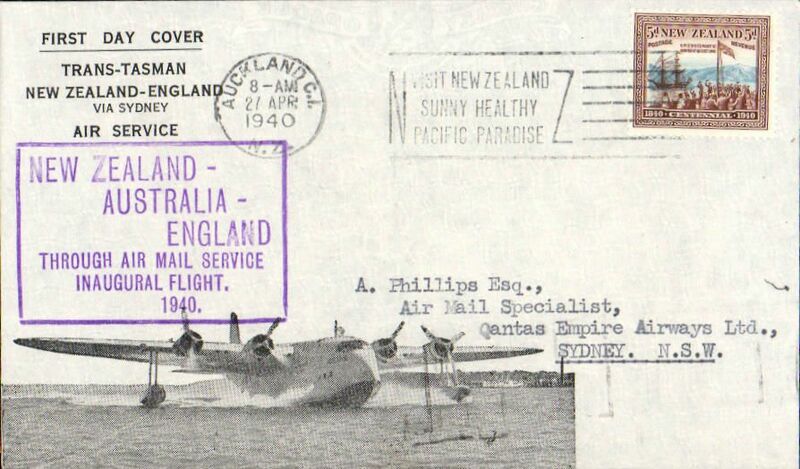 Auckland-London, carried on the inaugural flight flying boat "Aotearoa" from Auckland to Sydney, then Qantas/BOAC to London, no arrival ds, large framed flight cachet, plain cover franked 1/6d, sealed NZ censor tape, tied by NZ censor mark. Service suspended in June 1940 when Italy joined the war. Auckland-London, carried on the inaugural flight flying boat "Aotearoa" from Auckland to Sydney, then Qantas/BOAC to London, no arrival ds, large framed cachet, souvenir cover with imprint photo of plane. Service suspended in June 1940 when Italy joined the war. 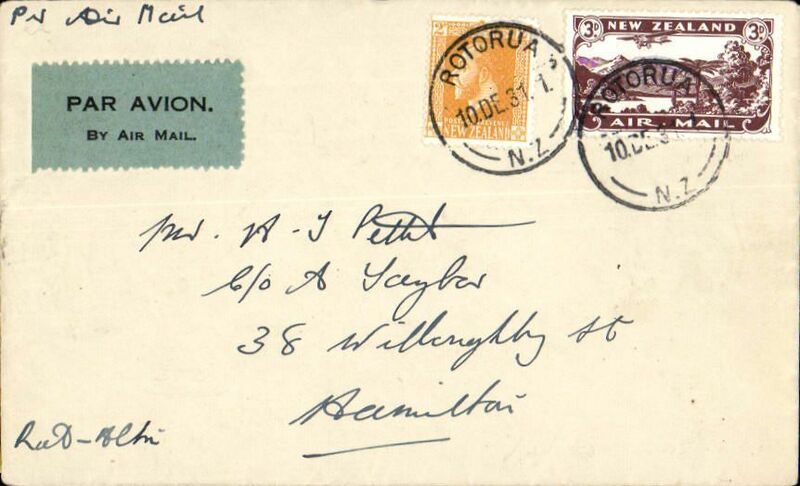 Rare first WWII dispatch from New Zealand over the Horseshoe Route, Hamilton to London, bs 10/8, plain cover franked 1940 9d x2, canc Hamilton '1 JE 40' cds, sealed B&W 'Opened and Passed by Censor/in New Zealand' censor tape. Correctly rated 1/6d, because at the outset of WWII the rate reverted to the pre EAMS airmail surcharge letter rate of 1/6d. 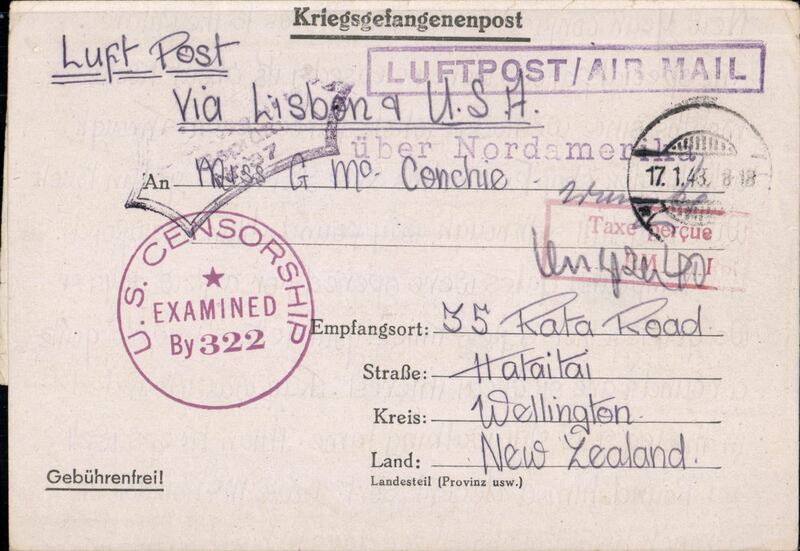 Once war had been declared with Germany, censorship was declared in the country, and all correspondence had to by passed by the New Zealand censor. 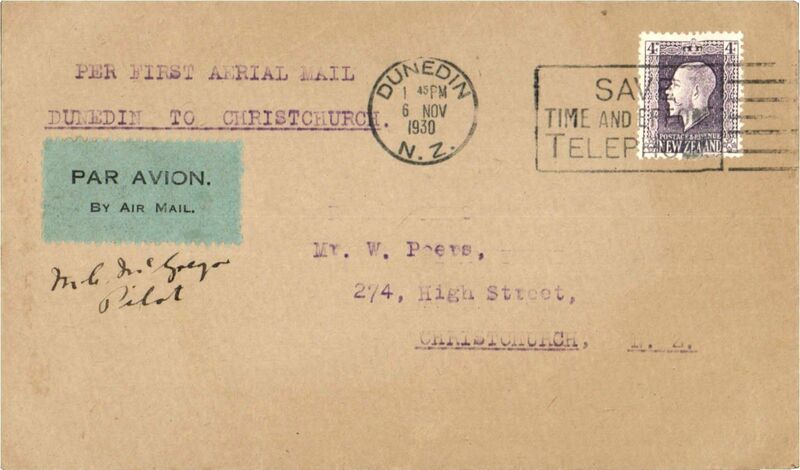 The government of the day also declared that all mail should be held for at least ten days after censorship within New Zealand before onward dispatch. This was to confuse the enemy so, should the letters be intercepted, they would gain no intelligence from the correspondence. The first TEAL flight to connect with the 'Horseshoe Route' flight out of Sydney departed Auckland on 18 June 1940. 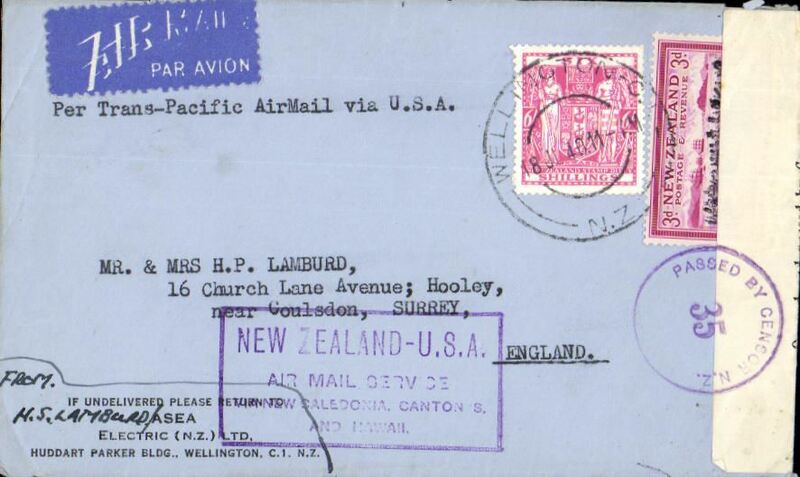 First Flight, World War II trans pacific air 'all the way' from New Zealand to England, Palmerston North to Canterbury, England, no arrival ds, censored cover franked 3/- x2 and 3d, etiquette, canc 12 JUL 40, ms 'Great Britain/USA & New Zealand', sealed black/white NZ censor tape tied by circular blue "Passed By Censor NZ/32" censor mark and violet framed "New Zealand-USA/via Air Mail Service/via New Caledonia, Canton Is and Hawaii" first flight cachet. Correctly rated 6/3d for 'All Air' Pan Am FAM19 Auckland to San Francisco, US internal air service to New York, Pan Am FAM 18 to Lisbon, BOAC/KLM to London. A short lived rate from 20 JUL 1940 to 9 Sept 1940. See Boyle p 877. Superb WWII item. 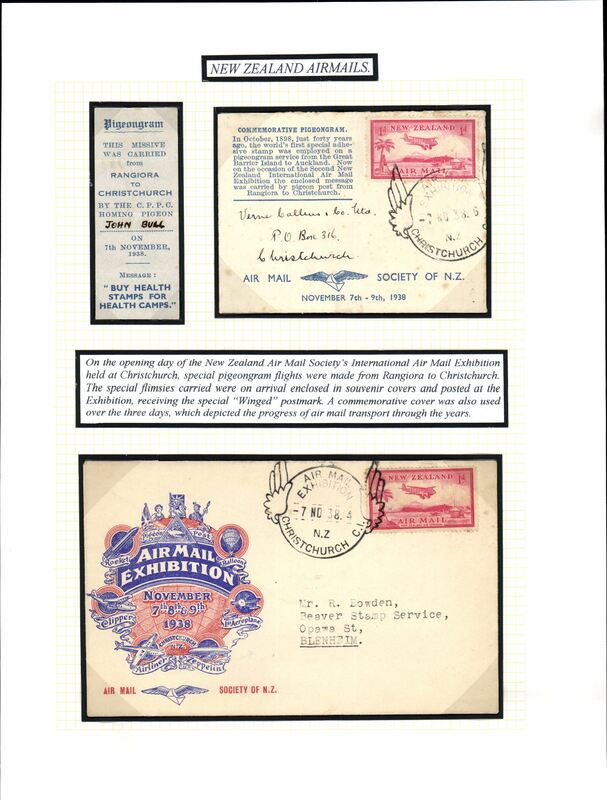 Christchurch to London, 2.Aug.40 arrival cds on front, first acceptance of GB mail for carriage on the inaugural Pan Am FAM 19 service from Auckland to San Francisco, 1d PSC with additional 3/- and 1d stamps, green framed 'New Zealand-USA' flight cachet, blue/white airmail etiquette. Two ocean and trans-continental USA by Pan Am, and Lisbon-London on the newly formed BOAC DH-91 service. A scarce item, all the more so, because it has a London arrival ds. 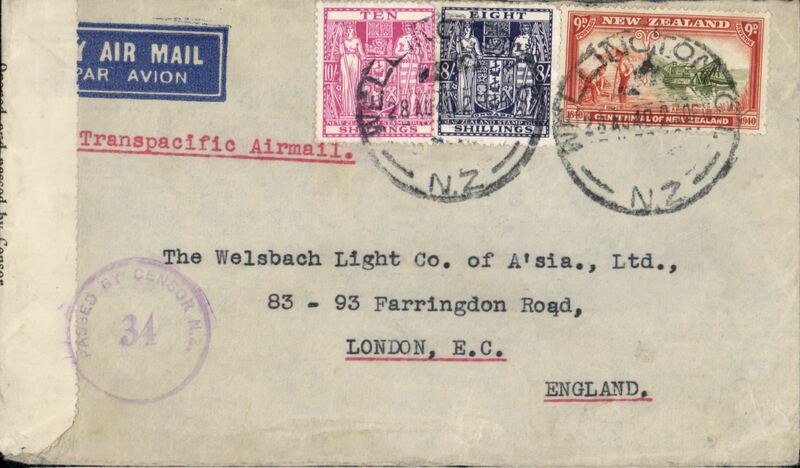 According to Walker, Airmails of New Zealand, Vol , p336 - "London mail was not backstamped". 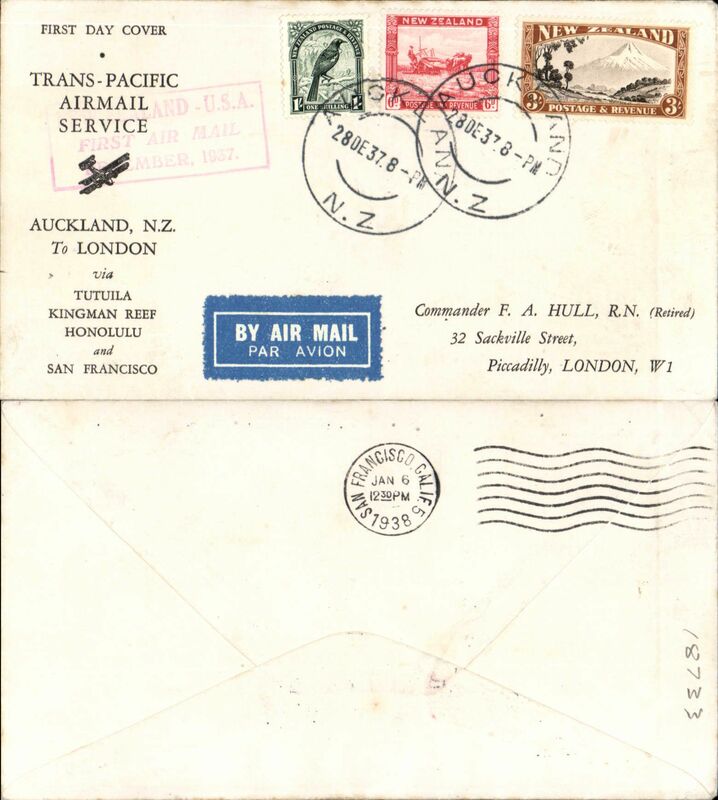 First Flight of theTrans-Pacific air all the way service from New Zealand to England, World War II censored commercial cover from Wellington to Surrey, franked 6/- Fiscal and 3d, violet framed "New Zealand-USA/Air Mail Service/New Caledonia, Canton Is and Hawaii", typed 'Per Trans Pacific Air Mail via USA', sealed black/white NZ censor tape and tied by circular violet "Passed By Censor NZ/35" censor mark. Correctly rated for 'All Air' Pan Am FAM19 Auckland to San Francisco, US internal air service to New York, Pan Am FAM 18 to Lisbon, BOAC/KLM to London, A short lived rate from 20 Jul 1940 to 9 Sept 1940. See Boyle p 877. Scarce WWII item. 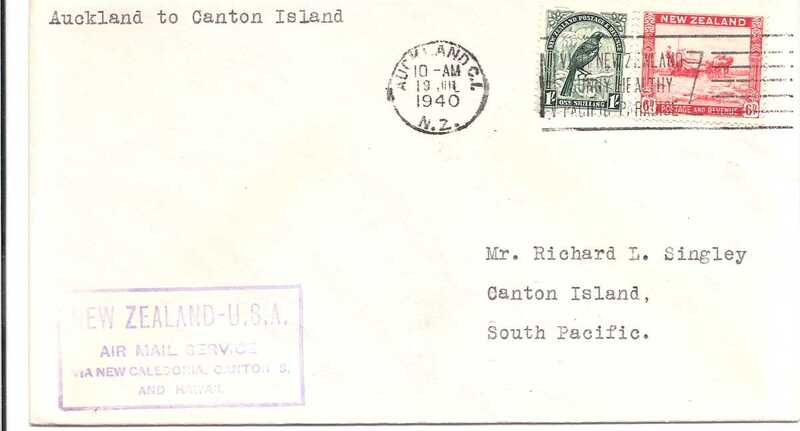 Reopening Pan Am trans-Pacific Auckland-San Francisco service, Auckland to Canton Island, 20/7 arrival ds on front, B&W PPC showing City Hall, Cape Town, franked 11d, nice strike violet framed 'New Zealand-USA/ir Mail Service/via New Caledonia, Canton Island and Hawaii'. F/F, Auckland to San Francisco, cachet, b/s, air cover, Pan Am. Image. 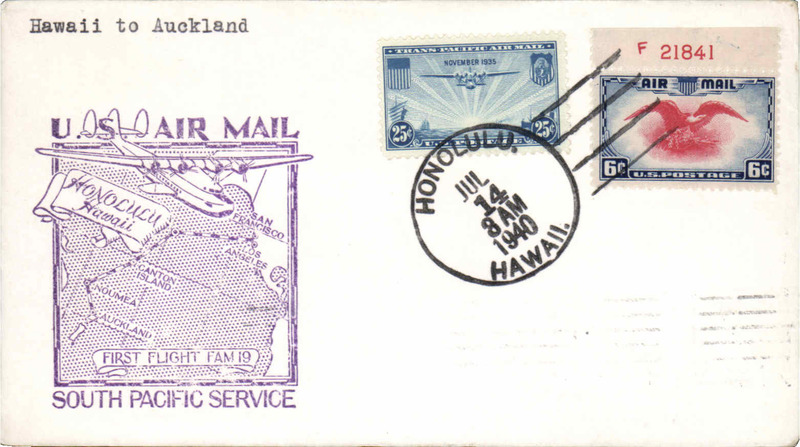 Trans pacific airmail, Pan Am FAM19 F/F, Auckland to San Francisco, official flight cachet, b/s, air cover. 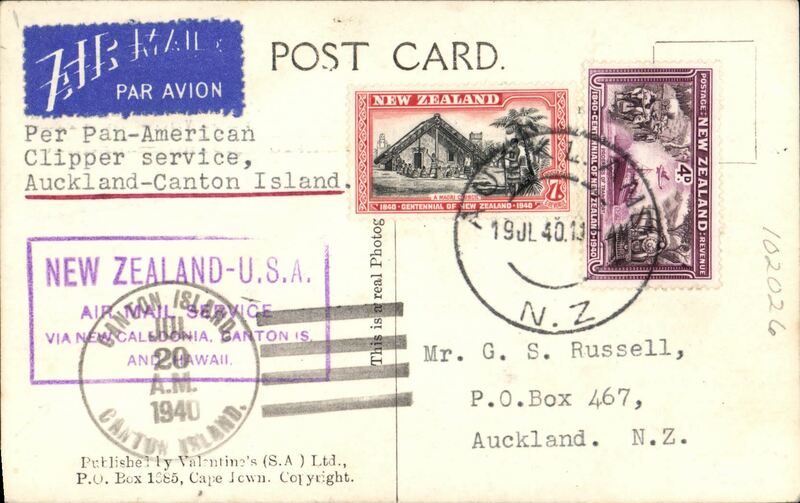 Trans pacific airmail, F/F FAM 19 Auckland to Noumea (New Caledonia), bs 20/7, black/grey souvenir cover with picture of flying boat, franked 1/-, purple 'New Zealand-USA' cachet and black 'Pan Am Noumea FF' cachet verso. 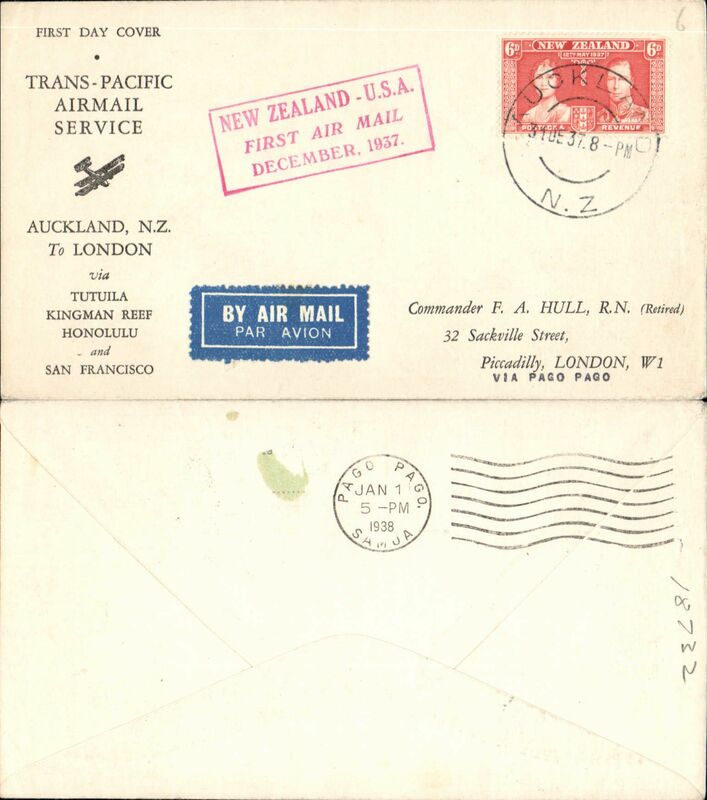 Trans pacific air all the way from New Zealand to England, World War II censored commercial cover from Wellington to London, no arrival ds, franked 10/- and 8/- Fiscal and 3d (3x 6/3d), etiquette, typed 'Transpacific Airmail', black/white NZ censor tape tied by violet "Passed By Censor NZ/34" censor mark. Triple rated correctly for 3x 6/3d 'All Air' Pan Am FAM19 Auckland to San Francisco, US internal air service to New York, Pan Am FAM 18 to Lisbon, BOAC/KLM to London. A short lived rate from 20 Jul 1940 to 9 Sept 1940. See Boyle p 877. A truly scarce WWII item. 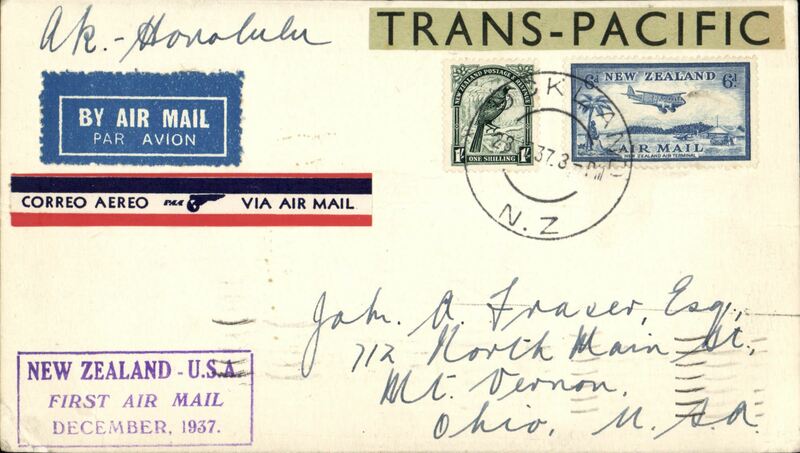 Trans pacific air all the way from New Zealand to England, World War II censored commercial cover from Auckland to Leicester, no arrival ds, franked 6/- Fiscal and 3d, etiquette, ms 'Trans Pacific/Airmail/ USA, UK, sealed black/white NZ censor tape and tied by circular blue "Passed By Censor NZ/39" censor mark. Correctly rated for 'All Air' Pan Am FAM19 Auckland to San Francisco, US internal air service to New York, Pan Am FAM 18 to Lisbon, BOAC/KLM to London. A short lived rate from 20 Jul 1940 to 9 Sept 1940. See Boyle p 877. Scarce WWII item. 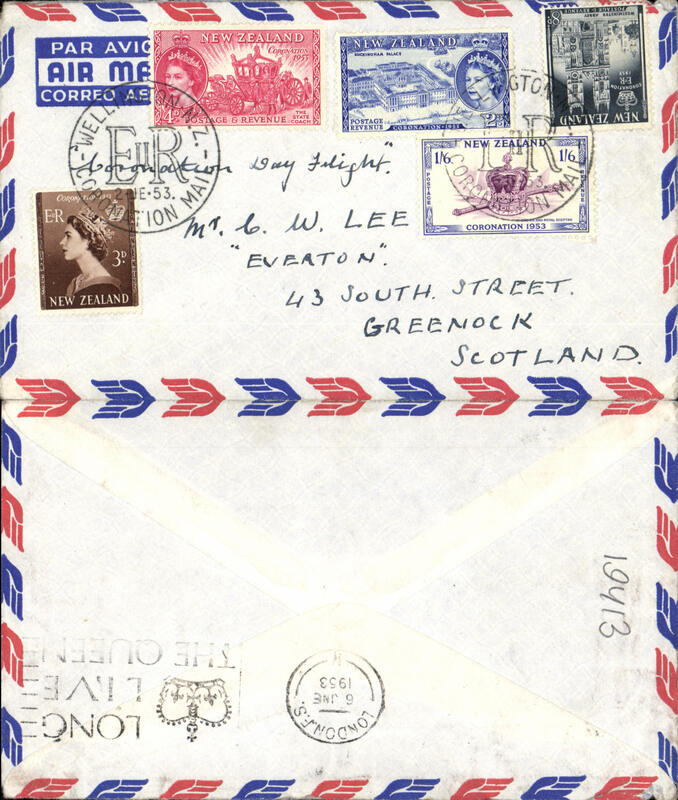 Air all the way two ocean airmail from New Zealand to England, World War II censored Trans-Pacific airmail, NZ to Scotland, bs Greenock 26/7, "Military Camp/Everyman's Hut. 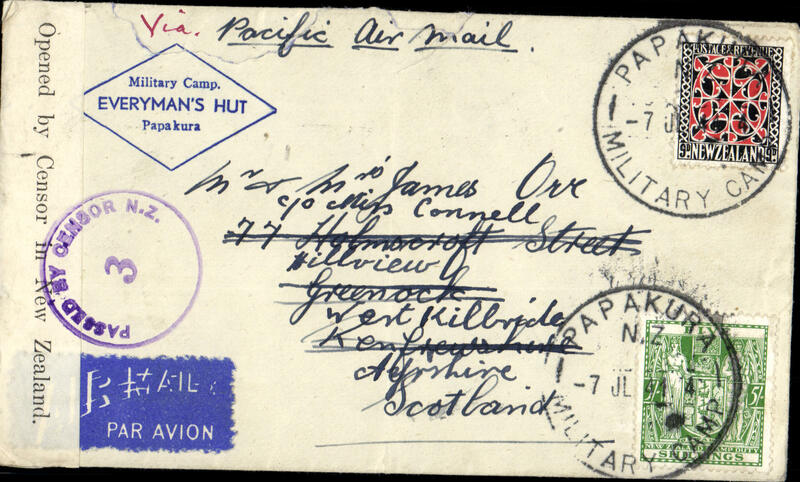 Papakura' corner cover franked 5/9d, canc Papakura Military Camp cds, airmail etiquette, ms "Via Pacific Air Mail", sealed B&W NZ censor tape, tied by purple NZ censor mark. Correctly rated for air across the Pacific, air across the US and air across the Atlantic, see Boyle p877. 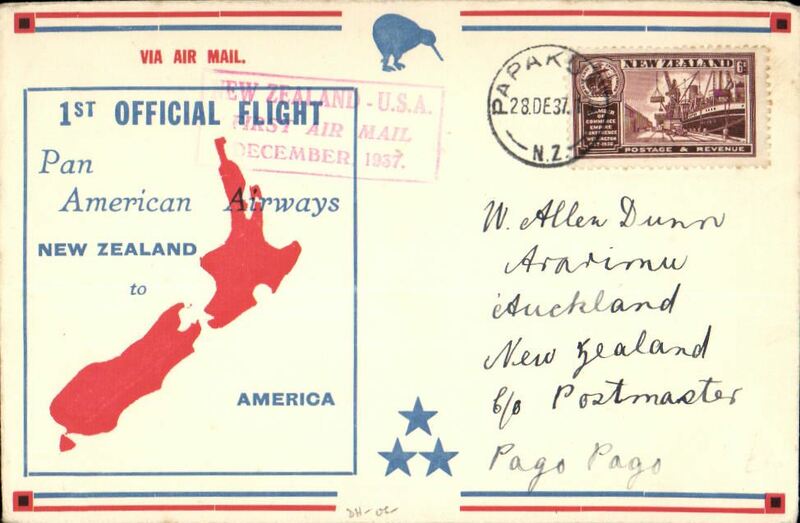 Air all the way from New Zealand to England, early flight of the 5/9d rate for Great Britain (9/9/40 - 12/12/41) by air across the Pacific, by air across the US, and by air across the Atlantic Ocean, see Boyle p877. 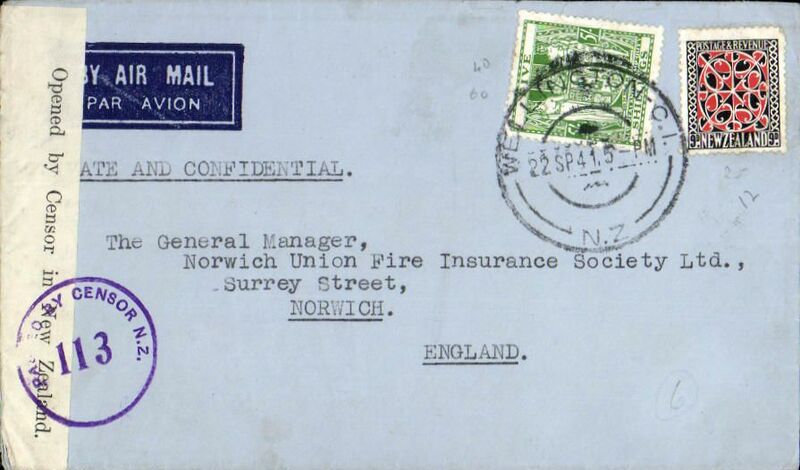 World War II censored cover from franked 5/- and 9d, canc Wellington cds, addressed to the Norwich Fire Insurance Society, Norwich, no arrival ds, sealed black/white OBC New Zealand censor tape tied by circular violet "Passed By Censor NZ/113" censor mark. 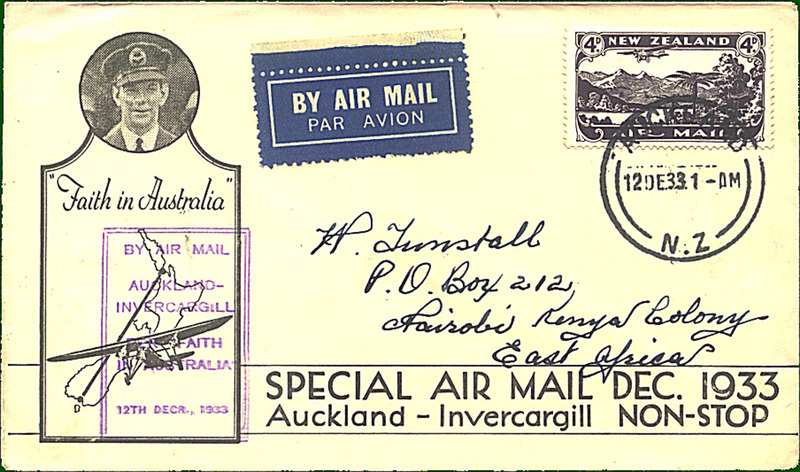 Air all the way two ocean airmail from New Zealand to England, World War II censored Trans-Pacific airmail, NZ to Scotland, no arrival ds, plain imprint etiquette cover franked 5/9d, canc Dunedin cds, airmail etiquette, ms "Via Pacific Air Mail", sealed B&W NZ censor tape, tied by purple NZ censor mark. Correctly rated for air across the Pacific, air across the US and air across the Atlantic, see Boyle p877. 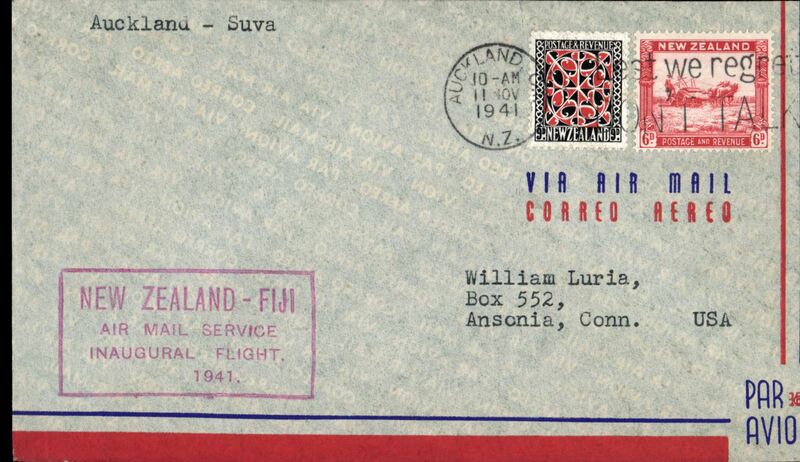 Pan Am, F/F Auckland to Suva (Fiji), red cachet, b/s, airmail cover franked 1/3d. 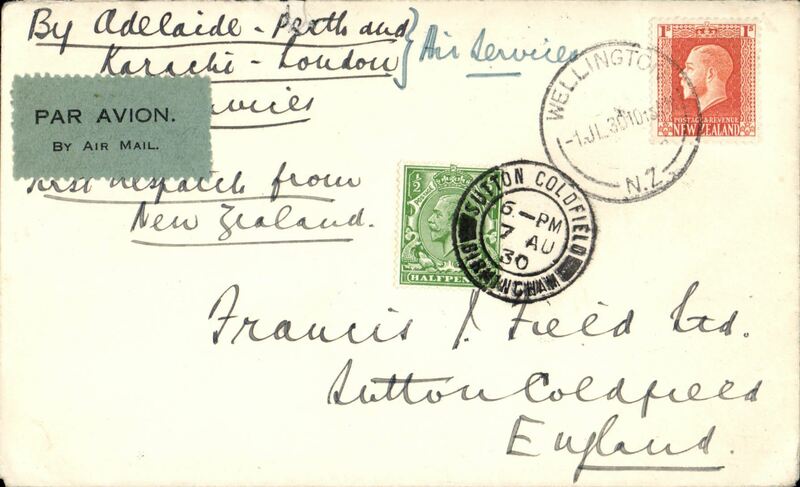 First inclusion of Fiji in FAM 19 service, Auckland to Suva, airmail cover franked 1/3d, official cachet. 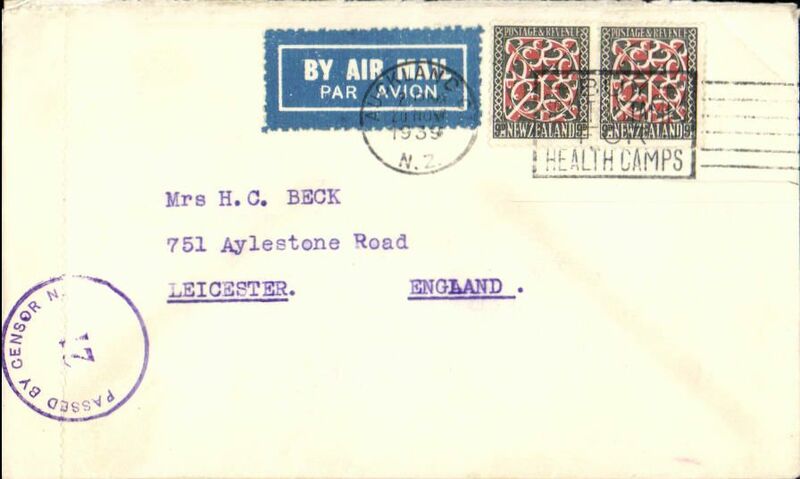 World War II censored two ocean sea/air cover to England, correctly franked 3/6d for sea to Panama, air to Miami and New York, air by Pan Am FAM18 to Lisbon (see Boyle p877), and onward to UK. 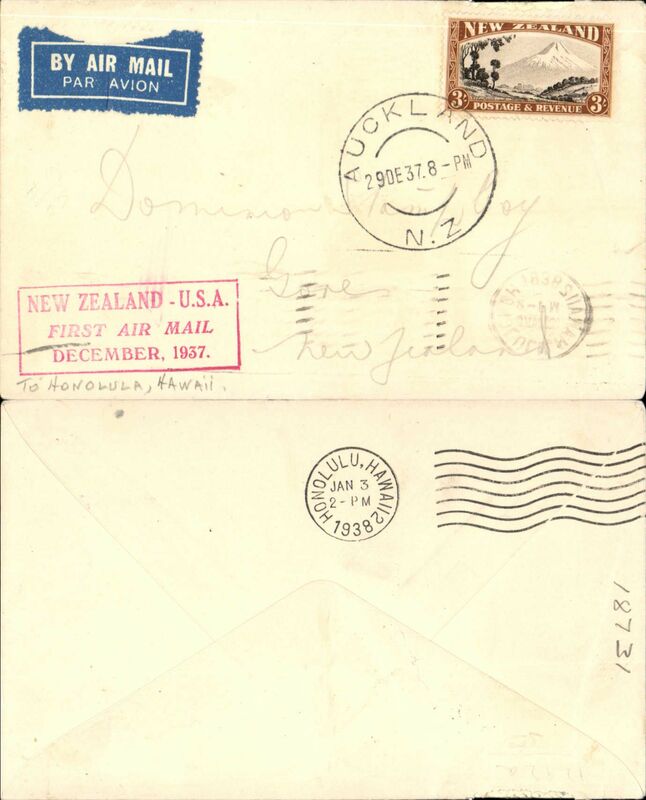 Pale grey airmail etiquette cover, postmarked Timaru machine cancel, sealed black/white New Zealand censor tape tied by red circular NZ/5 censor mark. 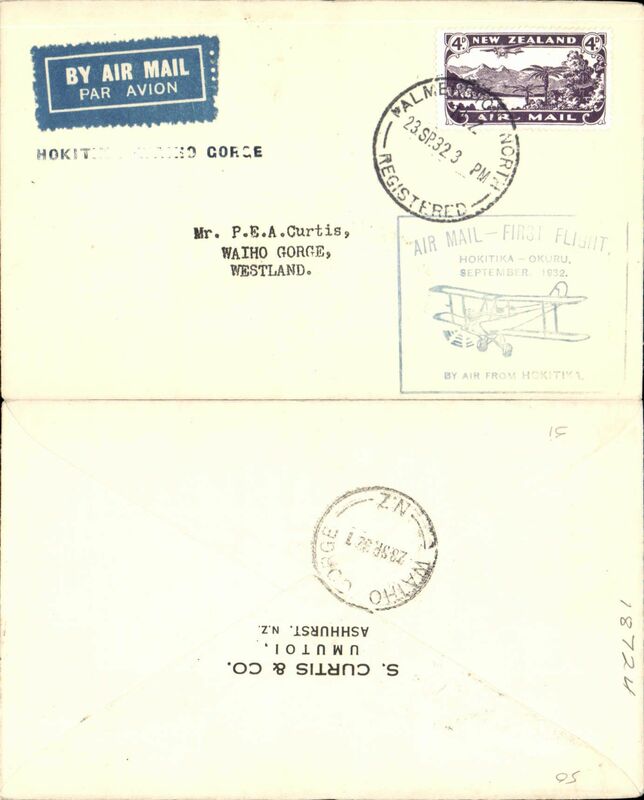 World War II censored two ocean sea/air cover to England, correctly franked 3/6d for sea to Panama, air to Miami and New York, air by Pan Am FAM18 to Lisbon (see Boyle p877), and onward to UK. 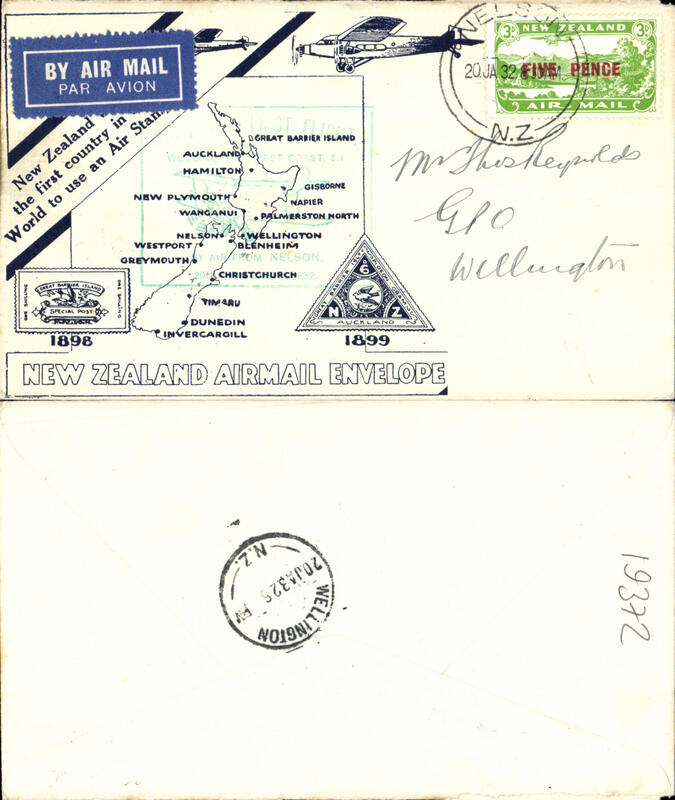 Pale grey airmail etiquette cover, postmarked Auckland machine cancel, sealed black/white New Zealand censor tape tied by purple circular NZ/5 censor mark. 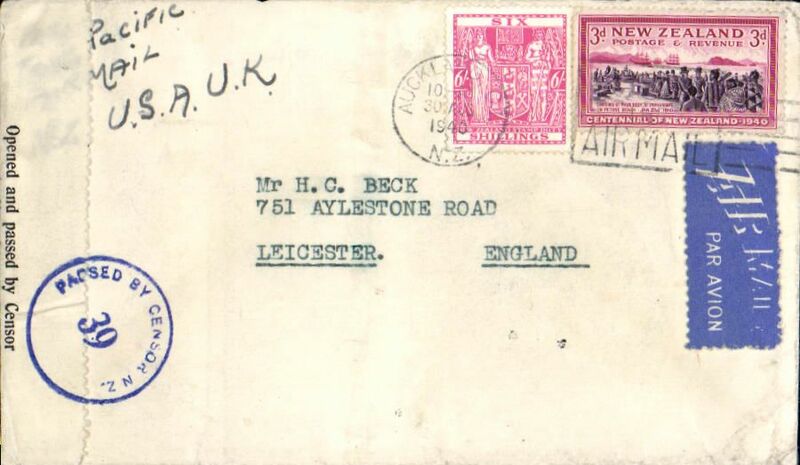 Dual censored German Prisoner of War Post, Prisoner of War camp Stalag VIII-B to New Zealand, via Lisbon and the USA, a wonderfully preserved Luftpost/Air Mail letter to New Zealand with clearly legible contents about camp life, blank (no name) 17/1/43 cds tied by red framed 'Tax Percue/...RM.....1' hs, violet 'Luftpost /Airmail' and 'uber Nordamerka' hs's, extra fine strike 'US Censorship/Examined By 322' censor mark on front tying black German (possibly scarce SS) scalloped 'Stalag VIII B.Censor/Nr 37', contents page also stamped with the same censor mark. Stalag VIII-B Lamsdorf was a German Army prisoner of war camp located near the small town of Lamsdorf in Silesia. In January 1945, as the Soviet armies advanced into Germany, many of the prisoners were marched westward on the so-called Long (Death) March. An exceptional item of museum quality. Image. 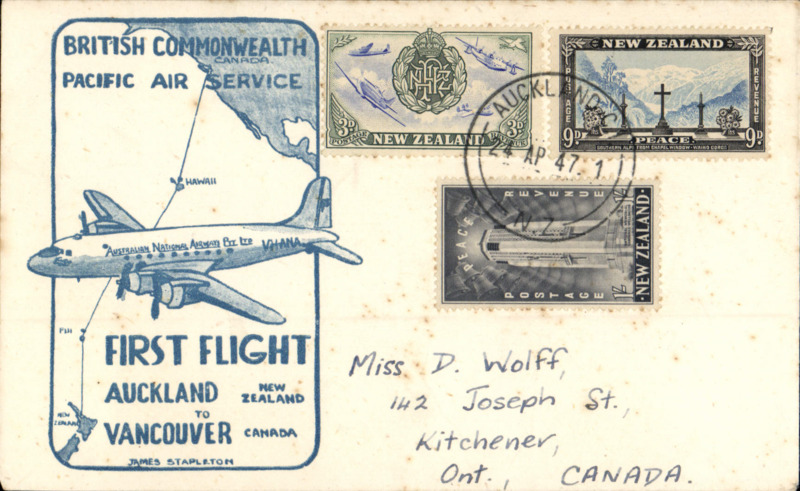 ANA/British Commonwealth Pacific Airways F/F Auckland to Vancouver, b/s 27/4, cream/blue souvenir cover with map & aircraft cachet produced by J Stapleton (about 50 covers with this cachet were prepared for all stages). Few tiny pinpoint tone spots, do not detract, see scan. 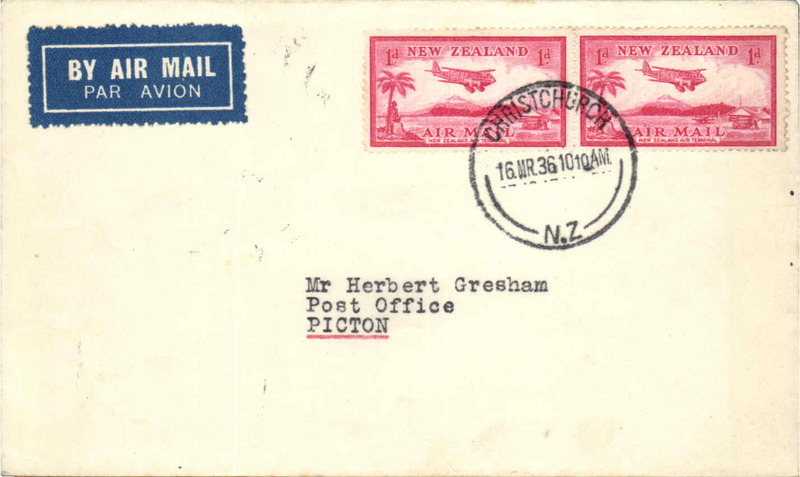 50th Anniversary Great Barrier Island Pigeongram, souvenir cover postmarked Okura, bs Auckland 19/7, Airmail Society Of NZ authentication hs. 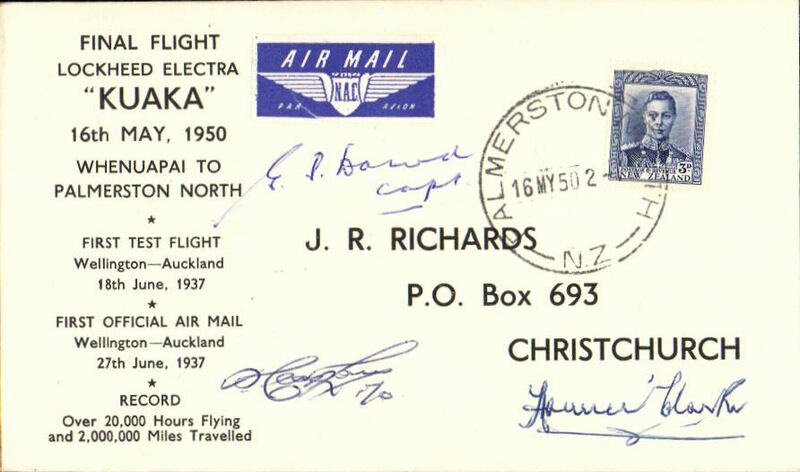 Final flight Lockheed Electra 'Kuaka', Whenuapai to Palmerston North, souvenir cover signed by the captain, the second officer and the general manager of NAC, NAC Union Airways. 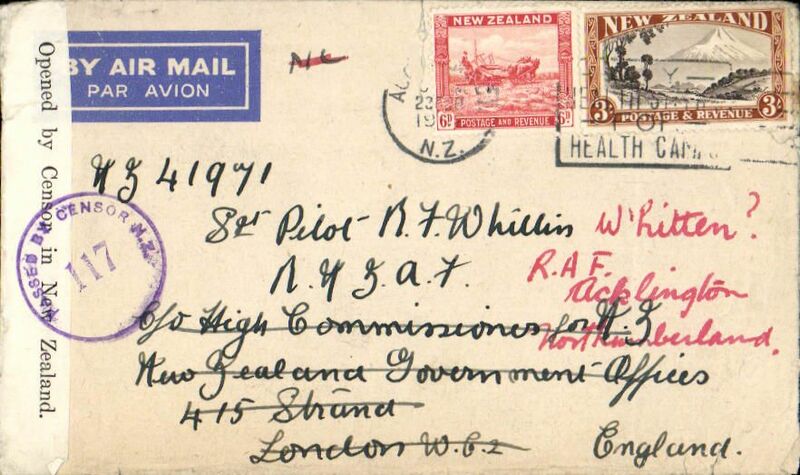 NZ Coronation airmail, NZ-London, bs 6/6, airmail cover franked 2/10 1/2, canc Wellington special cds. TEAL F/F direct Christchurch-Melbourne, cachet, b/s. 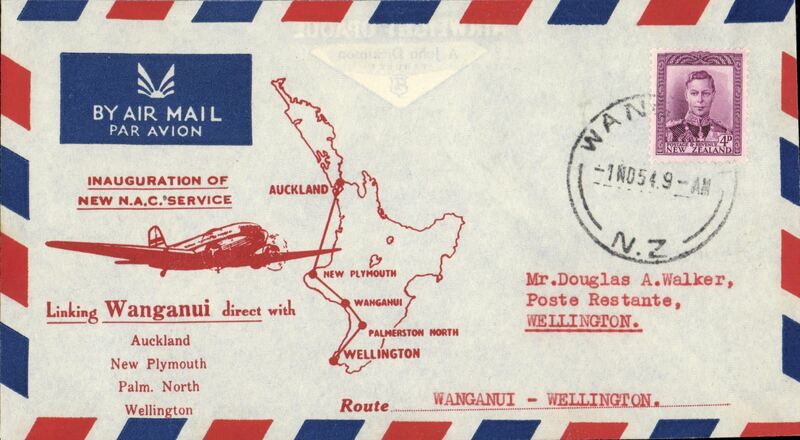 F/F NAC Service, Wanganui to Wellington, red/white/blue souvenir cover franked 4d. 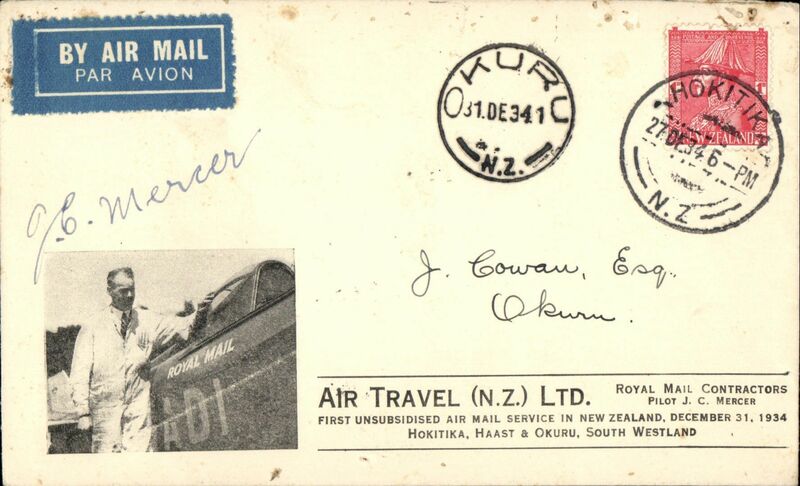 NAC Turbo-prop Viscount, Christchurch to Auckland, bs 3/2, souvenir cover franked 4d. 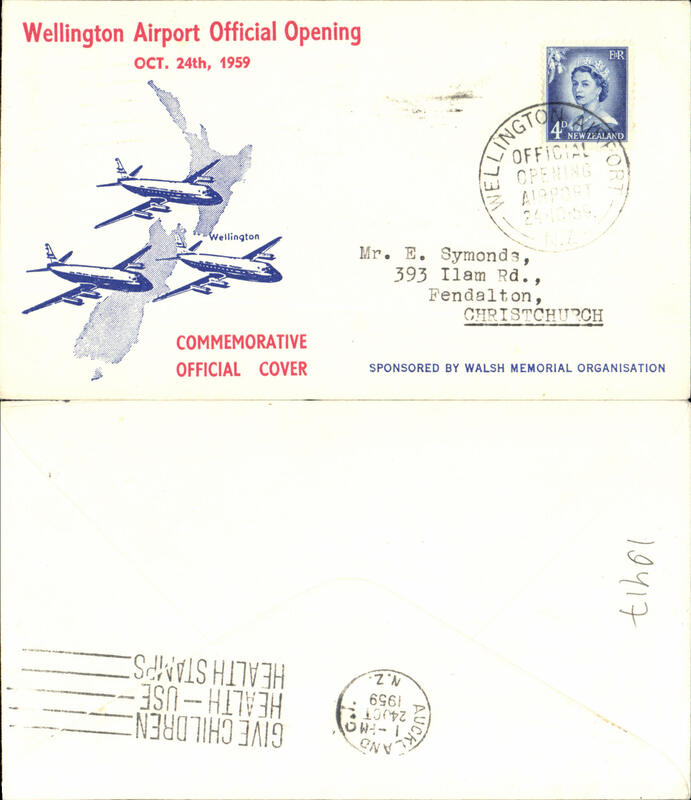 30th Anniv flight honouring Kingsford Smith, NZ/ Australia/NZ, special cancel Woodbourne Air Force Base, airmail etiquette, b/s Sydney Oct 14, official cover. 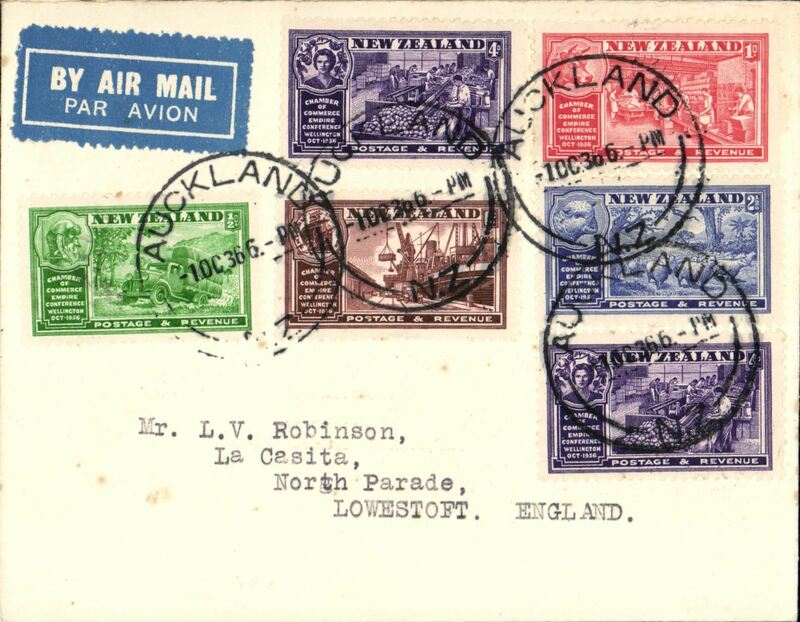 Official Opening Wellington Airport, Wellington to Auckland, bs 24/10, souvenir cover franked 4d. 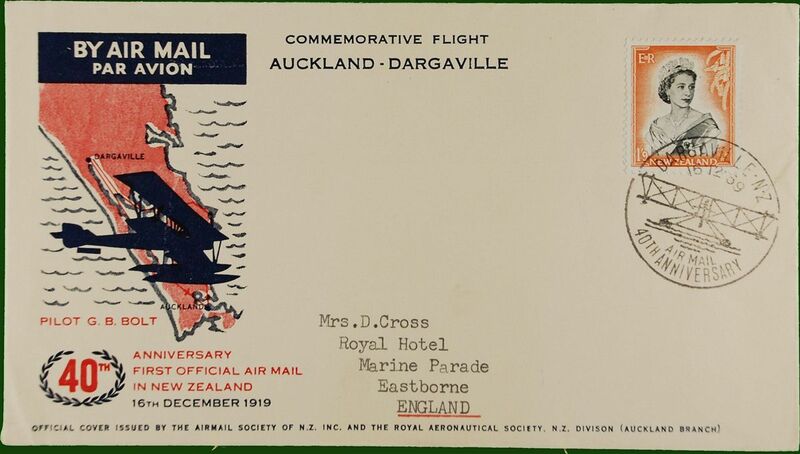 40th anniversary F/F Darganville to Auckland, b/s, souvenir cover. 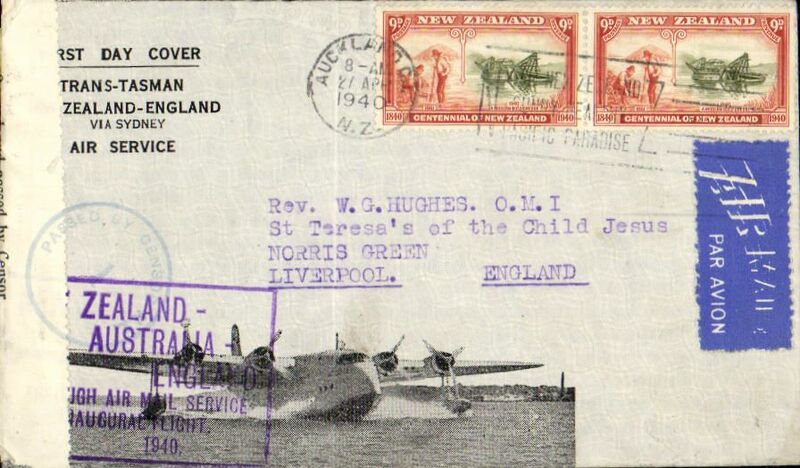 50th Anniversary of 1st Timaru-Chrstchurch flight, attractive souvenir cover, postmarked Timaru, bs Christchurch 6/3. 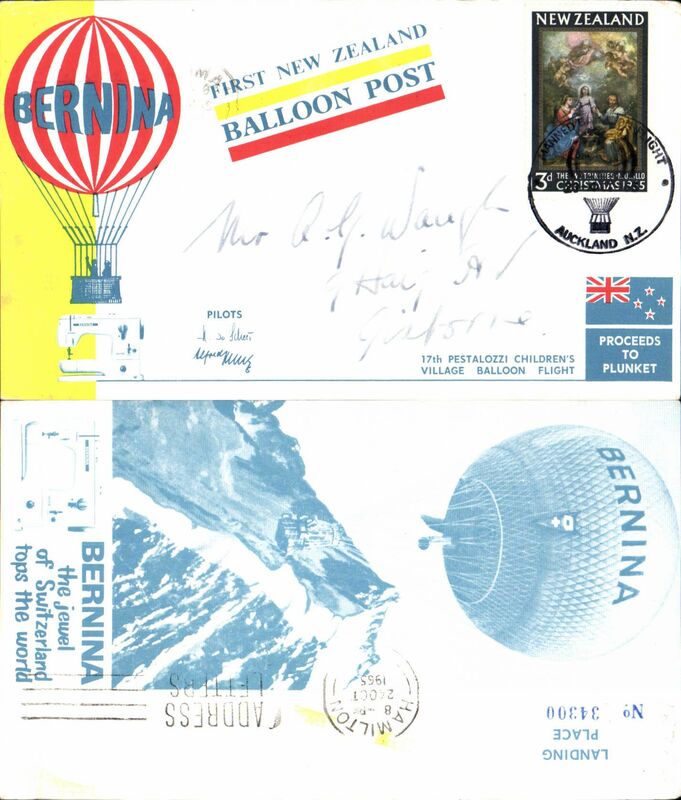 First New Zealand balloon post, 17th Pestalozzi Children's Village, postmarked Auckland, souvenir card. 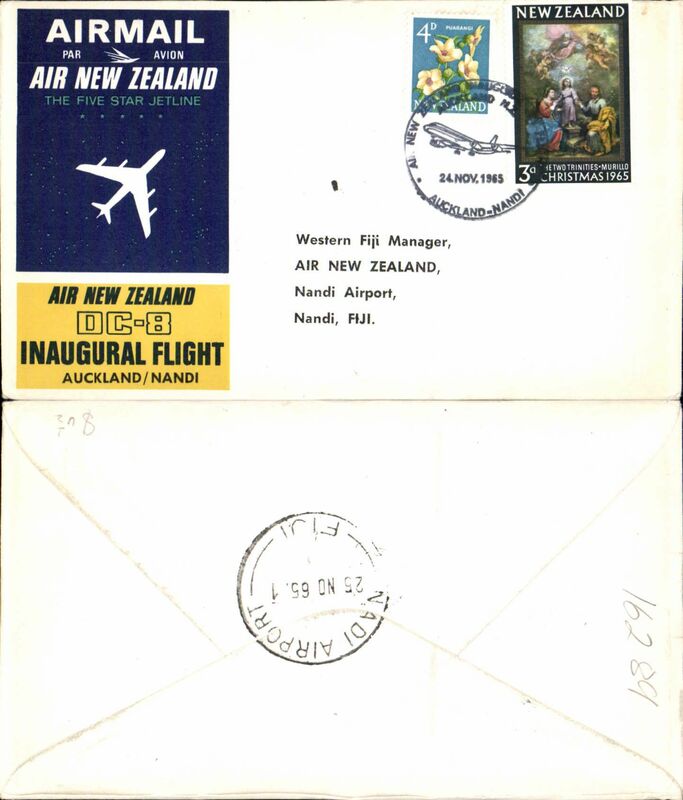 Air New Zealand, F/F DC8, Auckland to Nadi, b/s, souvenir cover. 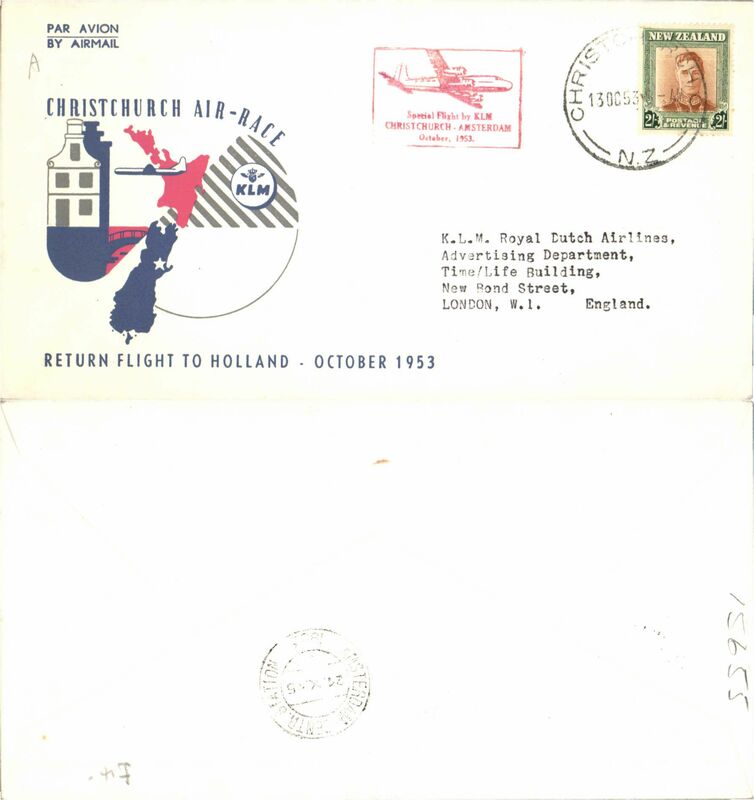 50th Anniversary of 1st crossing Christchurch-Wellington, bs 25/10, souvenir cover. 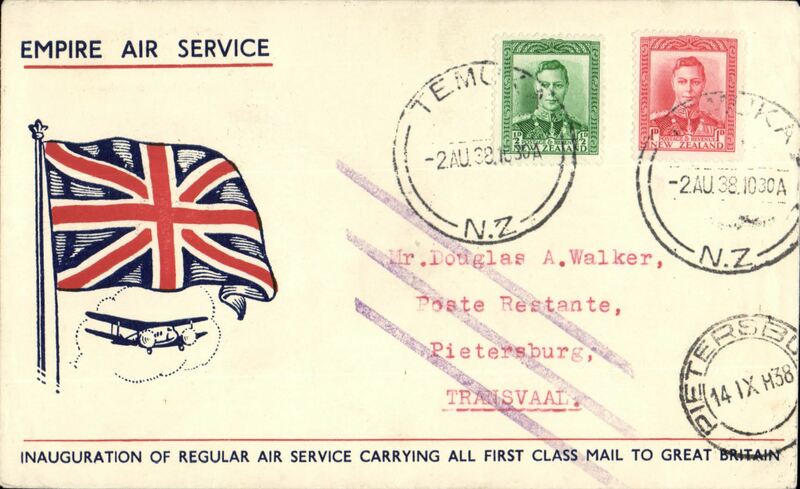 50th Anniversary of 1st crossing Wellington-Christchurch, bs 28/10, souvenir cover. Air New Zealand, F/F Auckland to London, b/s, official souvenir cover, flight cachet.